While on Excavation in Idjos Serbia, we took a break from shovelling and ventured into the City of Timişoara, Romania. Travelling is like reading a book from the inside out. Every new place reveals itself like the unread side of a turning page. Passages of a journey string themselves together; one word; one foot after another. And with every chapter; every place; a newer version of yourself is created. ‘It’s, like a quest’, Said Dragan, one of the Serbian archaeologists at the site of Gradište Iđoš, where I would be excavating for the next month. We were standing at the foot of a complex of Serbian apartments outside the town of Kikinda, waiting for the the rest of the team to join us for a few beers in the local bar. “The people, the characters and their stories,” he said, “they are golden”. I had been in Idjos for three weeks; as an extra shovel hand, helping with site photography and to give a lecture on Experimental Archaeology to the UCD and Cardiff University students who were there as part of a fieldschool. 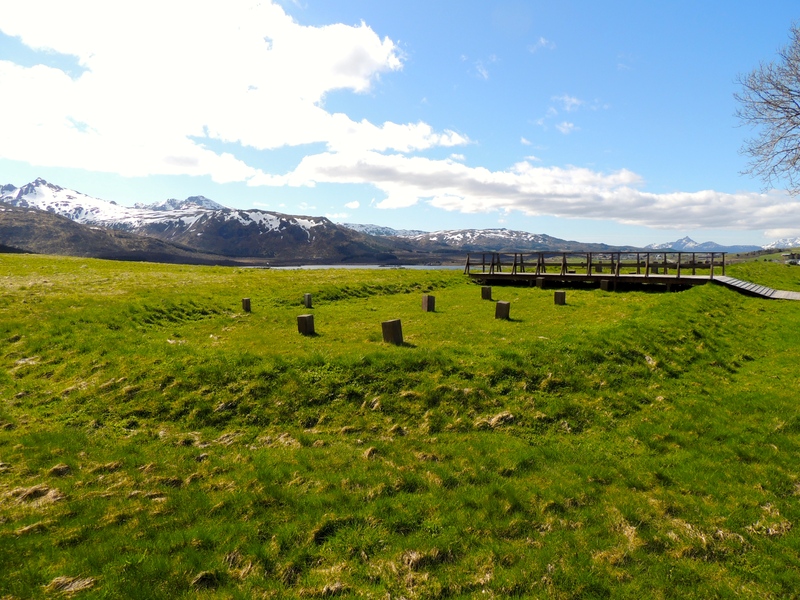 A break from making our Viking house at my University, making longbows and sailing Viking Longships in Northern Norway, meant a chance to complete some fieldwork and to travel. 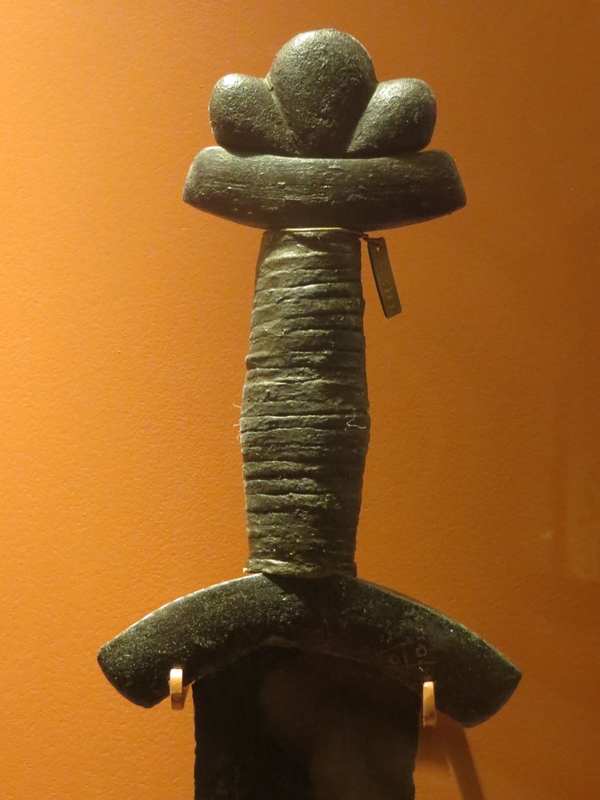 After Serbia I would be heading to Crete to visit some key Archaeological sites on the Island. After which, I would then continue on to Athens to begin research on an exciting new Experimental Archaeology Project I had started. The archaeological site of Idjos in the south-central Great Hungarian Plain in Serbia was occupied periodically for over 5000 years, from Europe’s first Neolithic farmers to the builders of an elaborate Late Bronze Age fortification. Excavations were first conducted in 1913 and then again in the 1950’s and 70’s. Today, the project is led by an international team with a diverse of expertise. 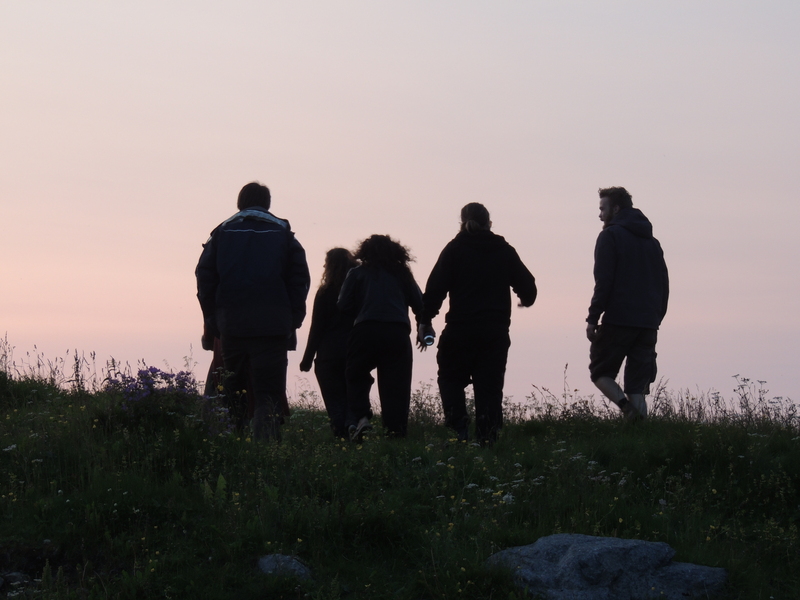 This year, UCD and Cardiff students as part of the Borderlands: ARISE field-school are investigating two features that appeared on geophysical surveys: a possible Neolithic house and the entrance to a Bronze-Age Rampart. Students from Cardiff and UCD begin their fieldwork. 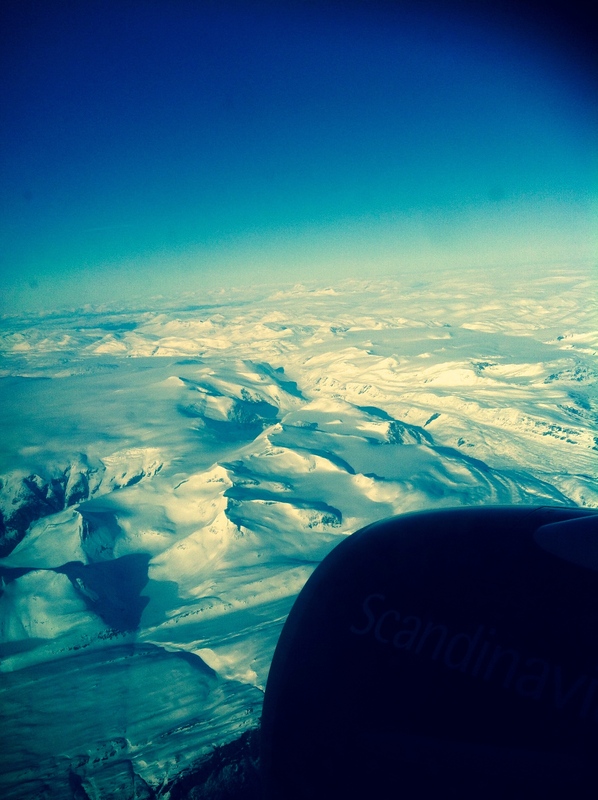 The bus hummed and rattled along the straight but pockmarked road to Idjos. The tips of green leafed huskless corn-plants flew in a blur passed the windows. The sun seemed to have only risen, but the orange hue that made the inside of the bus glow, reminded its passengers to apply their sunscreen and wet their bandanas before stepping into the heat. Every second seat held a body and in the seat next to it, a backpack with personal gear: a lunch, 2 litres of water, a hat and trowel. My gear comprised of the same with the addition of a tripod and camera bag. In it, a Canon DSLR with a 24-70mm zoom and a 10 -20mm wide angle lens, for both portrait, working and landscape shots. While the Sony-NEX 6 with a 30mm macro lens was used for detailed shots and artefact photography. The larger of my bags carried the rest of an excavator’s photographic essentials: north arrows, ranging rods, scales, logbooks and a small blackboard. In the event that a photo gets confused or misplaced, as well as a record of scale and direction according to North, it has been branded in chalk, with Trench, Site and Context Number included in the shot. Jumping off the bus, it is several acres of field-walking before reaching the site. A patrol of students, postgraduates, archaeologists and local workers make their way with barrows, buckets, backpacks and shovels. Lifting boots and trampling through corn reminds the leg muscles of trudging through snow. The dew from the night before gathers at the base of the corn-plants weighing down boots and trouser legs with water, while everything above the foliage simply swelters. This early in the morning the temperature averages between 25-28 degrees, until it peaks at 14:00 with temperatures of about 35-38 degrees with 90% humidity. Though, occasionally in the right conditions, there is the off-chance of torrential rain and a violent thunder-storm. Like my first day on site, which saw me into no more than 5 minutes of work before the sky began to darken and grumble ominously. We had just begun pulling out corn plants to lay down a test trench, when the heavens opened up. “The dew from the night before weighs down your boots… while everything above the foliage simply swelters”. AS THE DAYS CONTINUE; feet pushing spades into the earth; shovel loads flying; sherds appearing; bagging; tagging; lunch in the shade; crickets screaming; mosquito swatting; dust brushing; photo taking; site needs cleaning; water, sipping; I take my boot off and watch the dirt fall out as I turn it over onto a spoil heap that grows higher by the barrow and bucket load. It wasn’t long before this patch of rural countryside, coated thickly in green vegetation, began to transform into an archaeological site. Straight edged trenches, half a meter down, spoil heaps gathering on all sides and naturally trampled pathways through cornfield greenery from trench to trench revealed our network of activities. And then, the archaeology emerges. 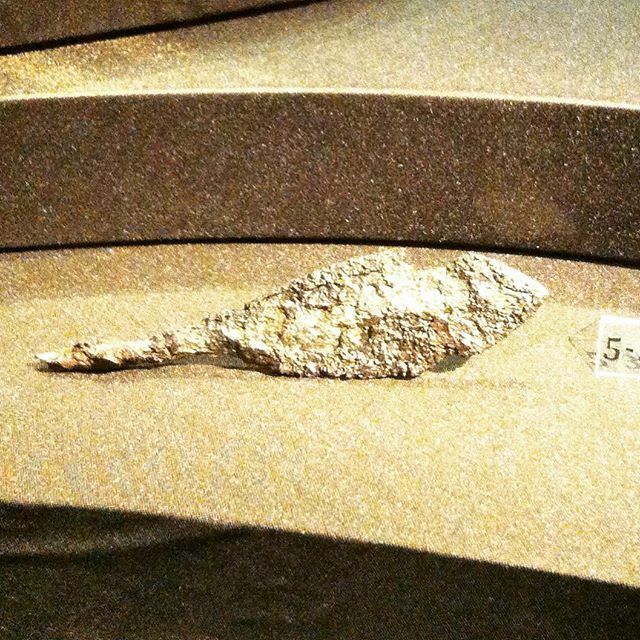 In this region in Serbia, an authentic WWII American trench spade is preferred over a trowel. Typically and often described as a cake, as soil is stripped away, different stratigraphic layers of time can be distinguished by differences in colour. But this is made difficult by animals and humans who time and again mess it all up by digging holes, trenches, pits and ditches; emptying and refilling them. Layers intersect; they mix and blend. Some can only be seen in the right light, while others can only be felt with a trowel. But as these features are removed they begin to make sense. For example, after removing the topsoil, you might hypothetically find that the ancient layer is made of tightly packed yellow soil. But running straight through the yellow, is a speckled strip of greyish black. You know that the yellow stuff is natural, because it’s compact and undisturbed by an ancient pick or shovel. You are now standing on the ground that Ancient people walked on. But the greyish speckled stuff running through it? That’s not natural, it’s grey and speckled because it has been disturbed sometime in the past and refilled. The speckles are bits of the natural stuff mixed in with other debris, and sometimes, artefacts. You carefully remove the black, leaving the yellow alone and paying close attention for any tiny pieces of archaeology you might find. You notice that the black strip is getting thinner. You follow the yellow sides of the ditch you have started to dig out, and realise while removing black, that the yellow sides are coming together, like a ‘V’ in section. It must be a ditch. You follow it until all the black is removed and only natural remains. What you are now standing in, is a ditch that was made by someone in the past. From when, depends on its context, established by the dates the finds (a piece of charcoal, a known type of pottery) discovered while digging it out. Between our Bronze-Age site and the Neolithic site at the south end of the field, a number of nice things were found this season: perforated bone, a bronze pin, a complete and decorated vessel, and to my great excitement a Bronze Arrowhead. “… taking it directly from the ground seemed to push that modern experience deeper into the past; to see the real thing and pass my own hand over the imprint of an ancient one was simply thrilling”. Miroslav, one of the head excavators was working away on the edge of the rampart. With a keen eye, he spotted the smallest speck of green and removed the dirt around it slowly until he saw what it was. Knowing too well my obsession, he called out. I heard my name and grabbed the camera to capture the commotion. As I knelt down to take the photo, so low to the ground my ear was touching the dirt, I saw this fragile green triangle through the viewfinder. It had a double edge that lead to a narrow point; slightly barbed and although no trace of a wooden shaft remained, a shallow, conical recess in the base, showed that a longer socket for an arrow shaft had long since disintegrated. As cool as it was to remove from the earth, bag and tag a find so close to my heart, it wasn’t the find that truly grabbed my attention. A material that is often found in abundance all over the site, but regrettably taken for granted, are pieces of daub. Daub is a mixture of mud and clay that was typically used to plaster the wicker or ‘wattle’ walls of a house. Preserved on the piece I found, were the perfectly preserved, negative impressions of woven wattle sticks. As we were photographing a collection of pits that had been packed full of the stuff, Barry Molloy, UCD colleague and director at Idjos, handed me a small piece of it. It was hard, clumpy and orange in patches. Not much at first, but turned in the light, its contours emerged. 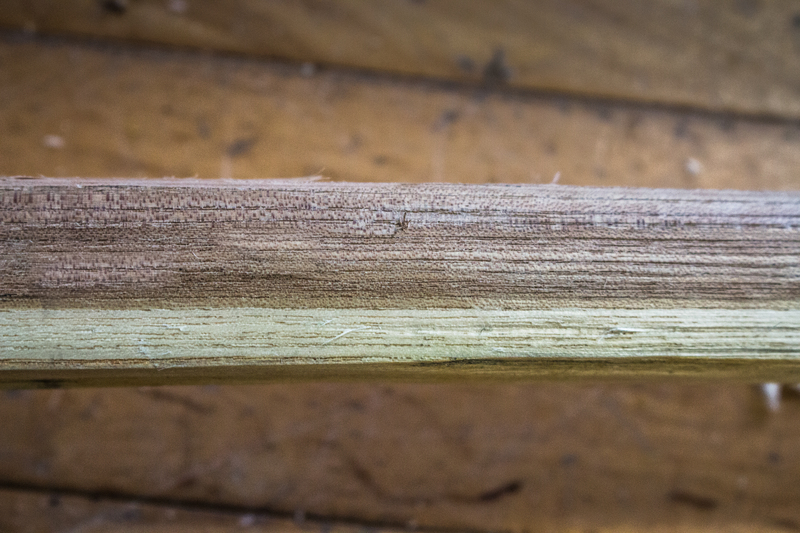 On its face you could see the negative impression of thin weaving rods; on its side, the impression of a thicker stake or upright. While on the back was a portion of the smeared hand print of its maker; dried and slightly curved; an action trapped in clay. 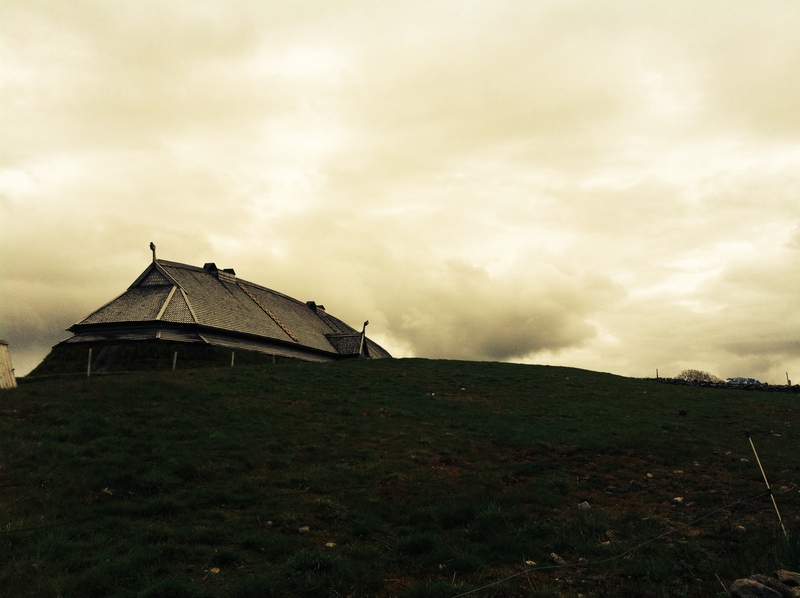 For the past year I have been building a Viking house at UCD Centre for Experimental Archaeology and Material Culture. In the weeks before coming to Serbia, my last days in UCD were spent cutting, bending and weaving thin hazel rods just like these over each other to make the walls of an Early Medieval Longhouse. 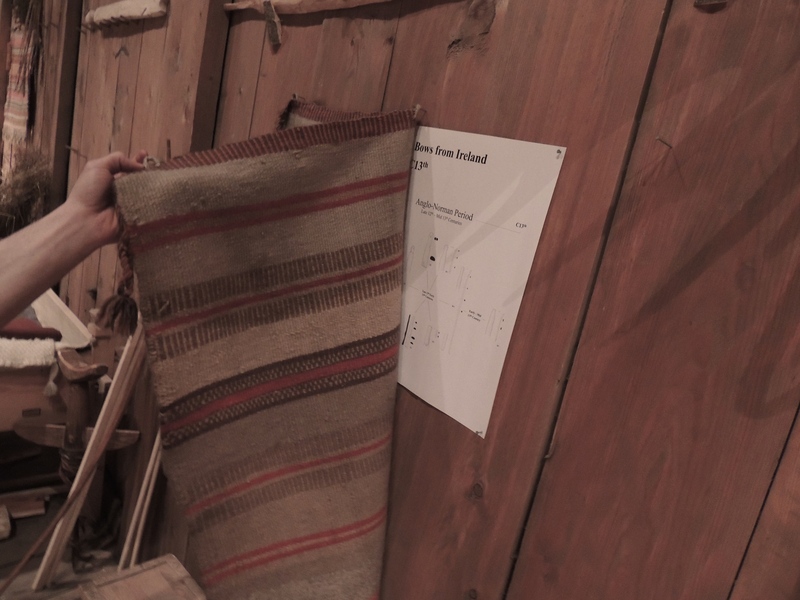 Vikings didn’t use daub on their houses in Dublin, so the research team at UCD, relied on detailed drawings and photographs of preserved wattle sections that were made in the 1980’s. Since staring the Viking house, wattle is something I feel very familiar with. But taking a lump of archaeology directly from the ground, within which is trapped an example of the real thing, seemed to push my experience of this organic technology deeper into the past; to really see it and pass my own hand over the imprint of an ancient one was simply thrilling. The Borderlands: ARISE field-school gathers an international collection of students and gears their programme towards giving students a variety of archaeological skills including excavation practices, post-excavation methods, documentation and scientific analysis of finds, environmental and faunal analysis, and applications of digital technology from spatial analysis to object visualisation. After a day in the field, the students are given a few hours to freshen up, after which everyone heads to the Kikinda National Museum. Although the building was completed in 1867, the National Museum and Archive were founded in 1947 where today, it houses various finds from archeological, historical and ethnological collections. Its rustic white walls, huge wooden doors, tall ceilings and open courtyard provide the field fieldschool students with the perfect environment to attend lectures, discuss ideas and spend their evenings engaging in post excavation work like cleaning, drawing and cataloging objects. While they were preoccupied with brushes and buckets of water, I spent my evenings by the light of an open window photographing artefacts of ceramic, bronze, bone, antler, and stone finds from previous and current excavations; photos that will be used in publication. Being so close to its border, we decided to venture out to Timişoara in Romania. We arrived on a quiet Sunday. Not much to do but plenty to see. One of the Cardiff students made contact with a local Archaeologist who was carrying out a rescue excavation in the city centre. We were guided by him into the site where, beyond a plywood door that separated the main street from the site, was gaping hole into the past. Imagine a clump of apartment buildings, tightly surrounding a single building at the centre. Now scoop out that central building to reveal all the floors of the previously attached buildings in 360 degrees. This is what we walked into. Down the group went, following the site director and his translator. Looking up, we felt dwarfed by the crumbling architecture that loomed over the site. Standing on the bottom level, you could see modern rooms with wooden and plastic doorways packed on top of stone-made medieval ones. The director told us the history of the site, the nature of rescue archaeology in Romania and the origin of the area that was once no more than a swamp. I stepped out for some air. As I waited for the group to finish up, one of the workers came out from inside a room by the plywood door. From his complexion I guessed he was local. He must have known where we had made the journey from, because when he approached me, he said something in Serbian. I told him I didn’t understand. ‘English…’ He said, disappointed and unable to speak it. ‘Sprichst du Deutsch?’ (do you speak German). ‘Ja, Ein Bisschen’ (A little), I replied. Delighted, he tapped me on the back, shook my hand and smiled from behind a dark but greying moustache; a few gold teeth glinting in the sunlight. And there we were, two none German travellers to Romania, fully conversing with each other ‘auf Deutsch’. He talked about life, work and how he ended up in Romania. Although not from Germany, he told me how his grandmother had thought him German as a child. He noticed the camera around my shoulder and asked if I would take his portrait. We moved to where the light was better and I took a few shots. But with no computer and thus, no email address to give me, I had no idea how he would ever see it again. All he gave me was a cell phone number, that I might use to find out where he is some day in the future, and send him a printed copy. Standing outside the row of Serbian apartments, the group finally came out and we began making our way to their favourite bar in the main-street of Kikinda. As we walked, Dragan or ‘Gani’, as he was called, continued. He spoke of the earlier days of excavation, when he was studying and learning to dig. He said that many of the towns he would dig near didn’t even have bars. On the way home from work they would stop by the local market or newsagent, where they could buy a bottle or can of beer. “This was the local bar”, he said. There they would sit outside in the sun, drinking beer and sharing stories with the locals. “This is where the real people were”, Dragan said. 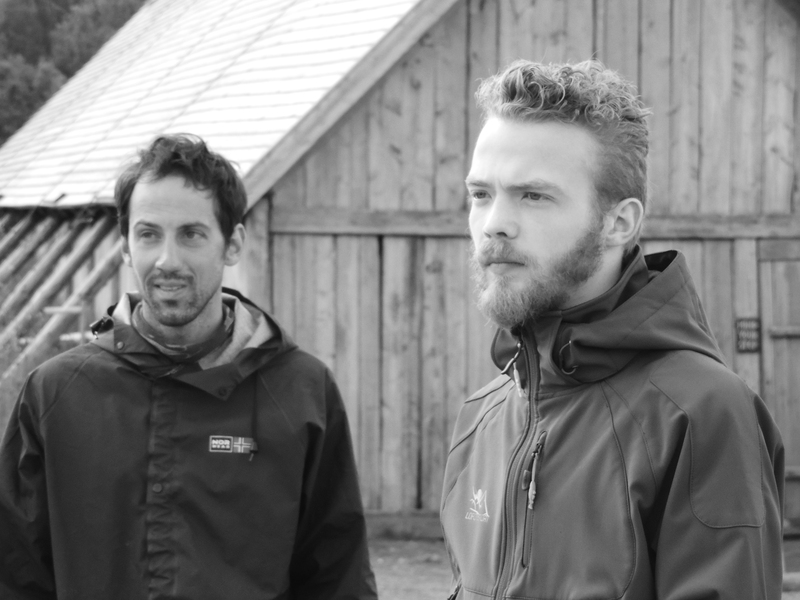 It’s a different dynamic for students today who can travel internationally to wonderful field schools such as Idjos. But in many ways, the things we take away from them are very similar. In the last week I started taking footage for a small documentary film about the dig and interviewed all of the Cardiff and UCD students who participated. When each of them were asked about ‘their favourite part’ or, ‘the things they would miss the most’, they each gave me the same answer: ‘the friendships’; ‘the people’. The few days I stayed on in the field after the students had all left were quiet and because of it, longer, hotter and harder. But beginning to simmer at the back of my mind once more, was the prospect of beginning the next leg of the journey. ‘As I write this, I am sitting in the cafe of a boat/hotel on the edge of the Danube River in Belgrade. I will be spending two nights here before heading to Crete, where I will be starting the groundwork for my next exciting project, which will be revealed in my next article. Thank you for reading, don’t forget to like, share and comment with any questions! 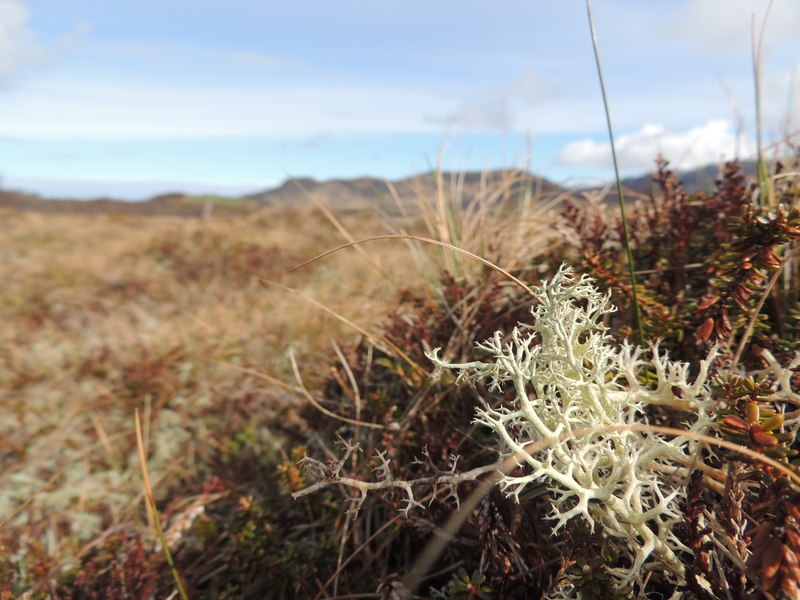 Please also ‘Follow’ or add your ‘email’ on the Homepage for the latest updates from my fieldwork! 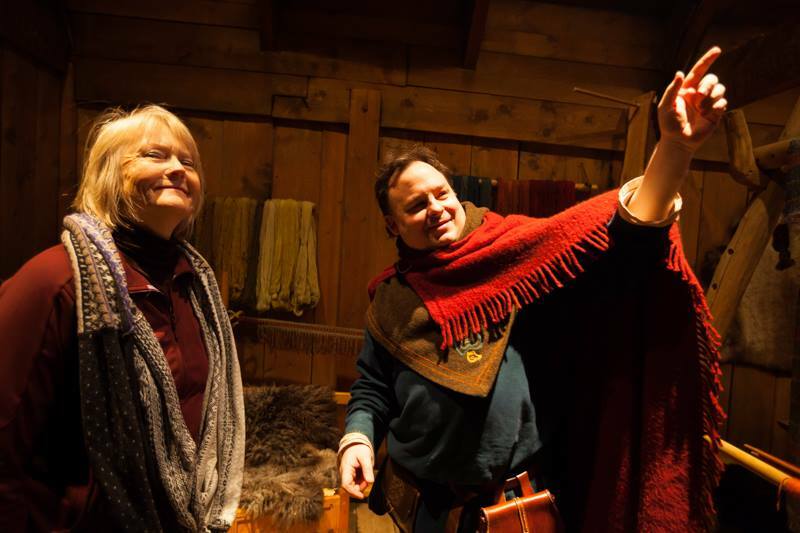 In February 2015, I was invited by Patricia Gonsalves, Archery Technician on DC’s ‘ARROW’ and director of Lykopis School of Archery, to travel to Vancouver and give a guest lecture and workshop on Viking archery and Bowmaking. 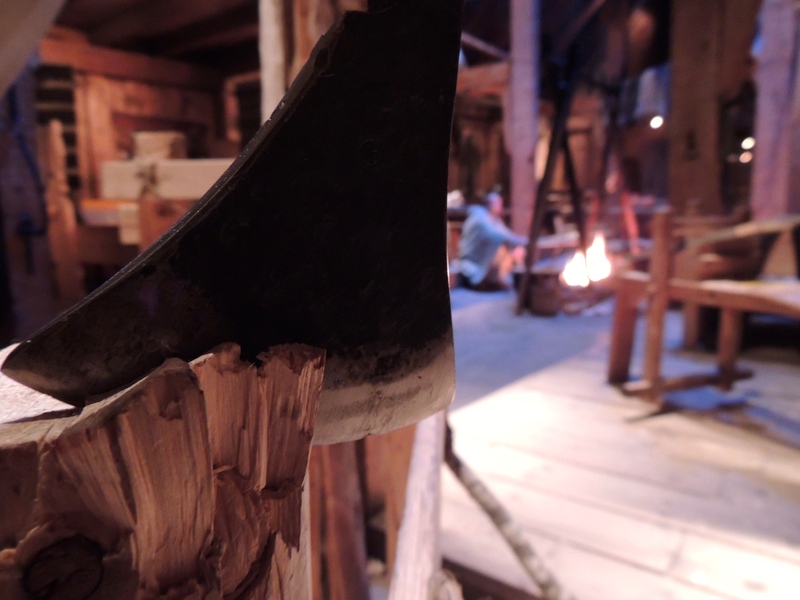 As soon as I arrived, axe handles needed to be carved out and axe heads hafted. 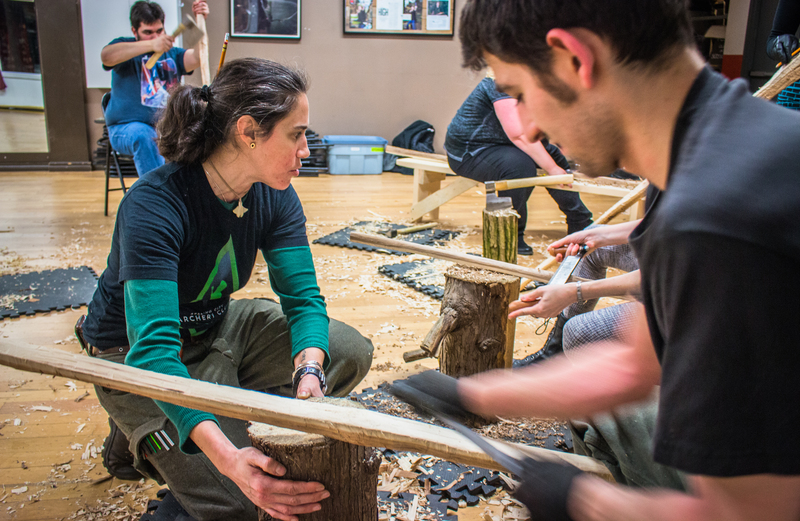 Pine chop blocks were sourced and transported to Patricia’s prestigious archery school along with pre-prepared bow staves of Elm and Osage. 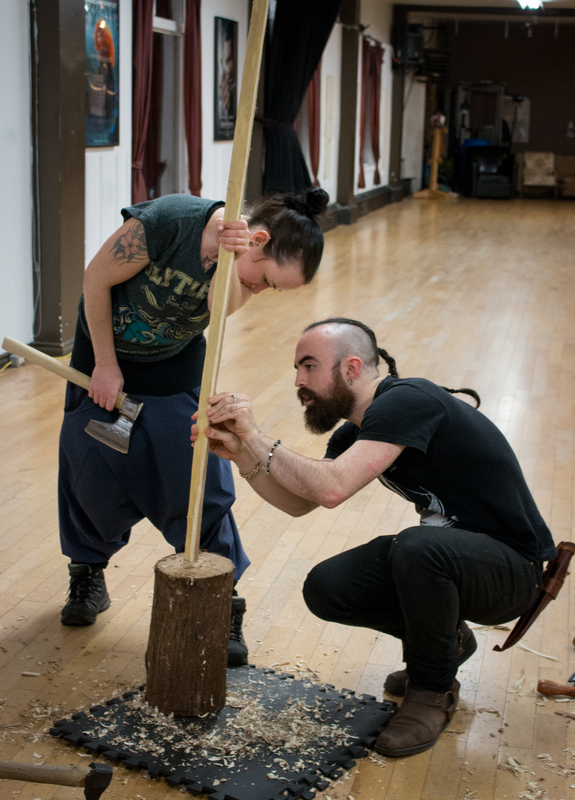 And after just two weekends of hard work and many blistered hands; two workshops, six people in each, ran simultaneously over the two weekends, twelve students in total received a highly detailed and practical introduction to Experimental Archaeology and the craft of Viking bow making. 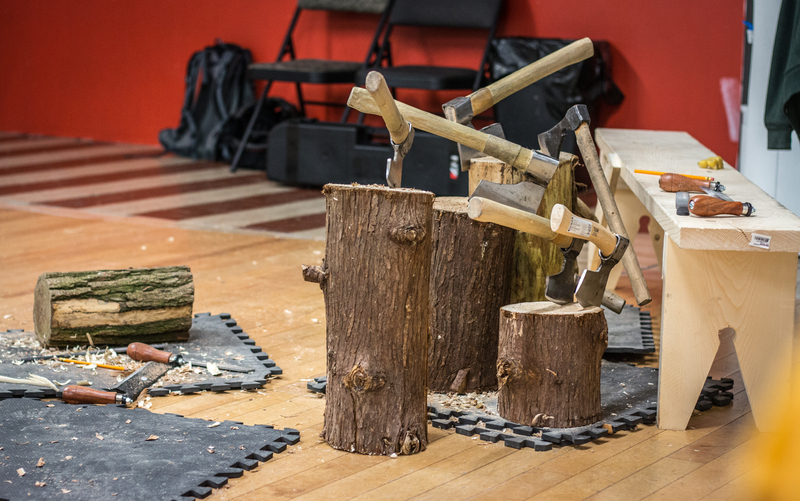 In the first workshop session, each student learned how to identify the best stave, how to split the trunk and by throwing their eyes to the grain, how to find the bow within the stave. 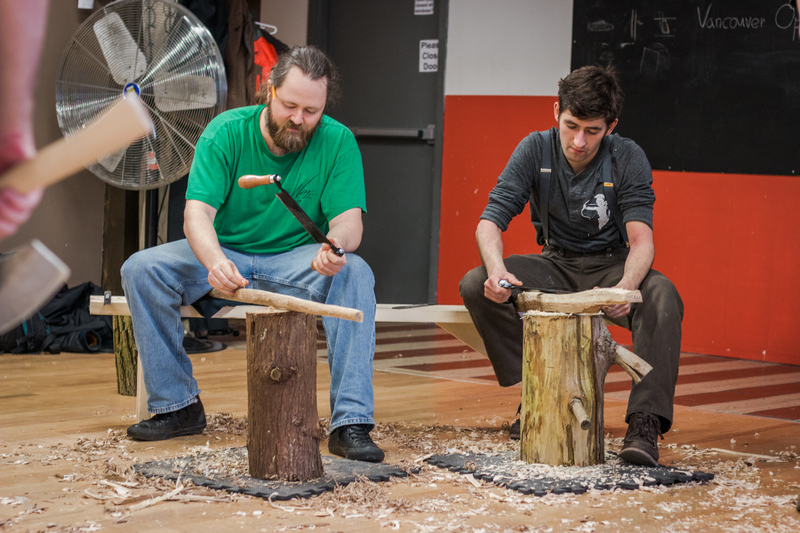 With just an axe, they then each learned to carve out a billet. 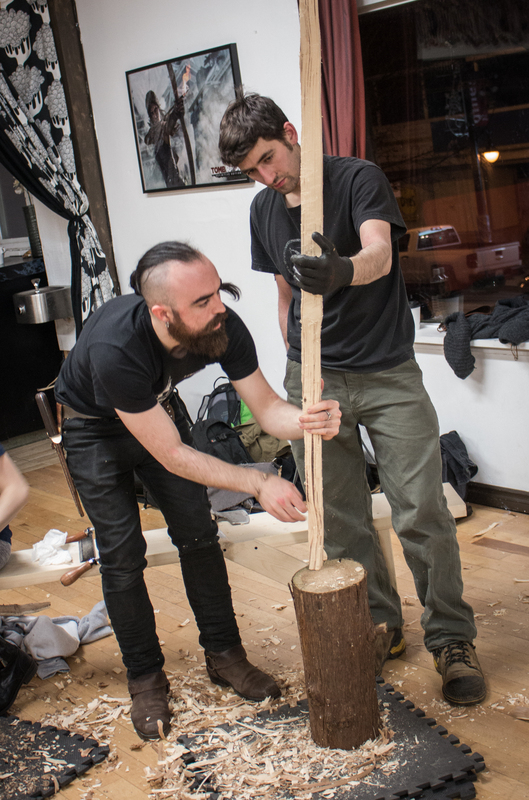 By using a draw knife and rasp, each student then roughed out the basic shape of their bow, gradually rounding the belly of the inner heartwood and then outward to two thinned and evenly tapered tips, learning the basic dynamics of how a self-bow actually works, the bending mechanism behind each shot and the dynamic of a gradual bend throughout the limbs. “Most were already talking about which type of bow they wanted to try making next; with one chap even saying that he thinks he ‘caught the bug’”. 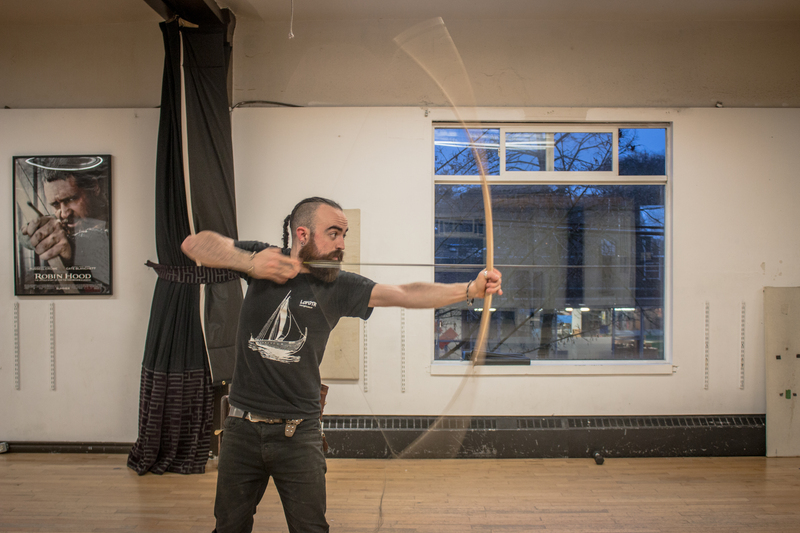 When I was asked to give a lecture to an archery school in Vancouver, I thought to myself, ‘what could I tell a bunch of experienced archers that they don’t already know?!’. 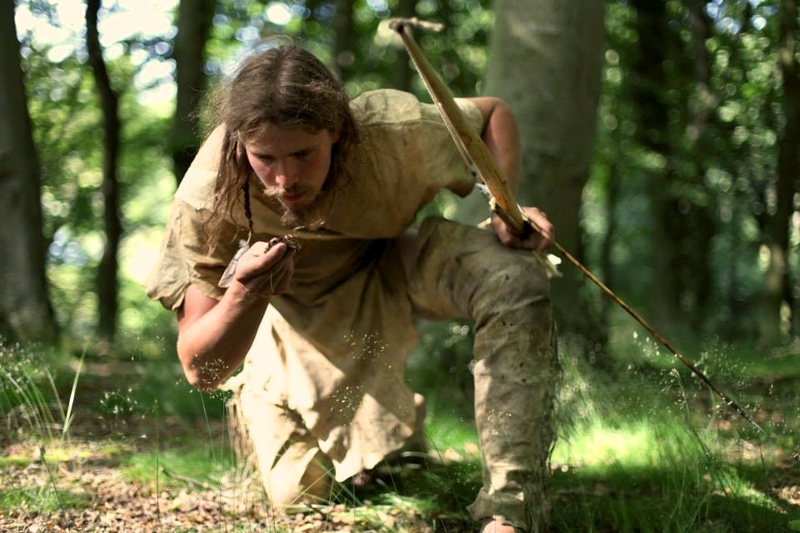 First: ‘Exactly what evidence archaeologists see when examining archery material; a sort of, ‘Intro to the Archaeology of Archery’; the preservation (or lack thereof) of bows and arrowshafts; the deceptive quality of wooden remains, realism in art; the difference between a symbol and a representation. 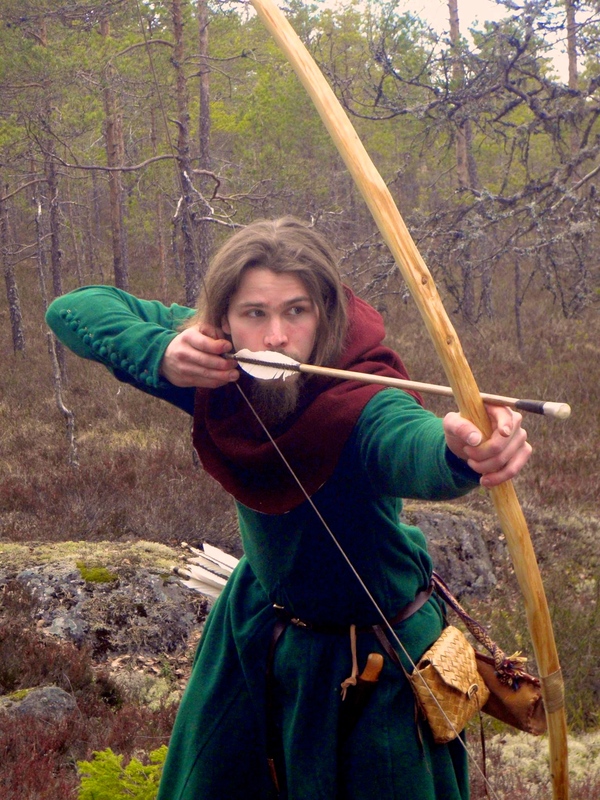 Second: ‘how these kinds of evidences have been used recently to build the image of the ‘Viking Archer‘ today; the bow and arrowhead finds from Hedeby and Nydam; archery in the saga literature and representation in later Medieval art. 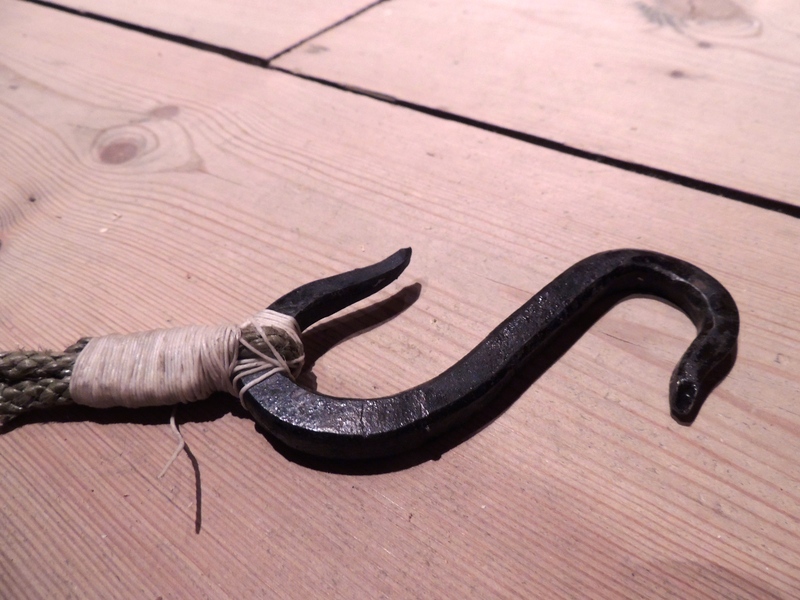 And finally, the part that tied into the workshop: ‘How to make a Viking bow’. “They can now question where the evidence comes from, separate fact from fiction and start rebuilding that knowledge into a craft”. 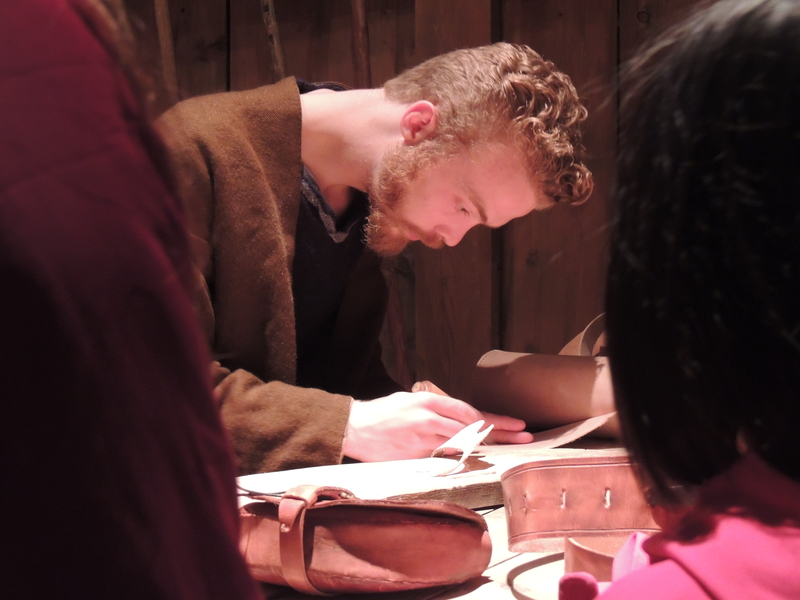 Here I could share my own experiences working at UCD Centre for Experimental Archaeology and Material Culture. 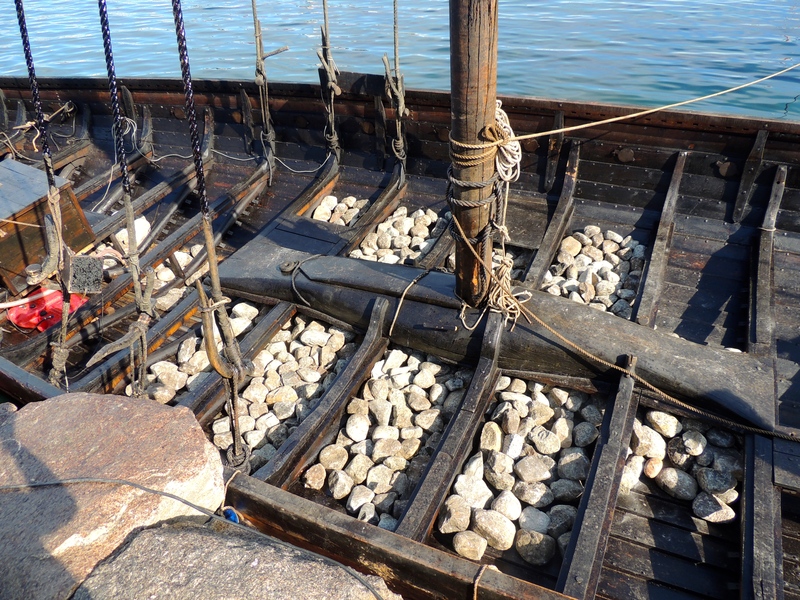 Of my experience handling the Viking bow fragments from Dublin at the National Museum of Ireland and how I learned the process of Viking bow making, a skill that I then was able take to the Lofoten Islands in Northern Norway for two summers. In this way I hoped to give them a taste of how evidence should be collected, interpreted and then used to build a picture of the past; and how sometimes, that very same evidence can also be misleading. 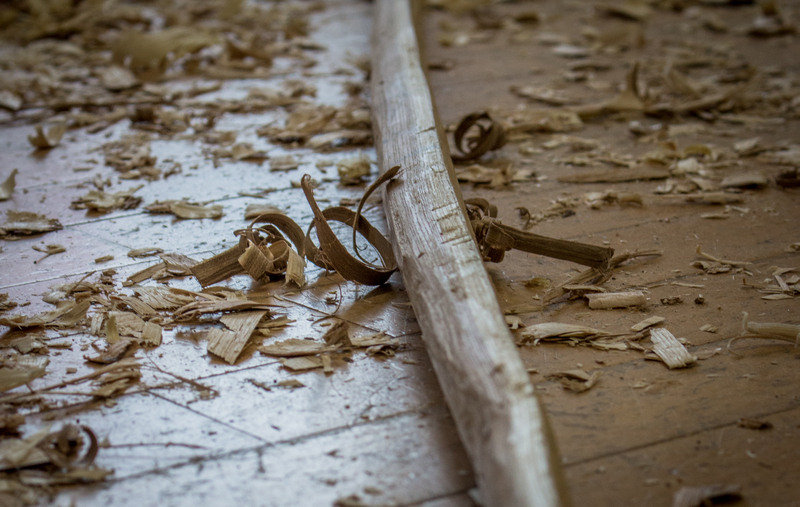 With so many people it would have been an impossible task to complete every bow, so after learning to make a bowstring from linen cordage and beeswax, each learned arguably one of the most difficult aspects to grasp, of the entire process: the ‘brace’. 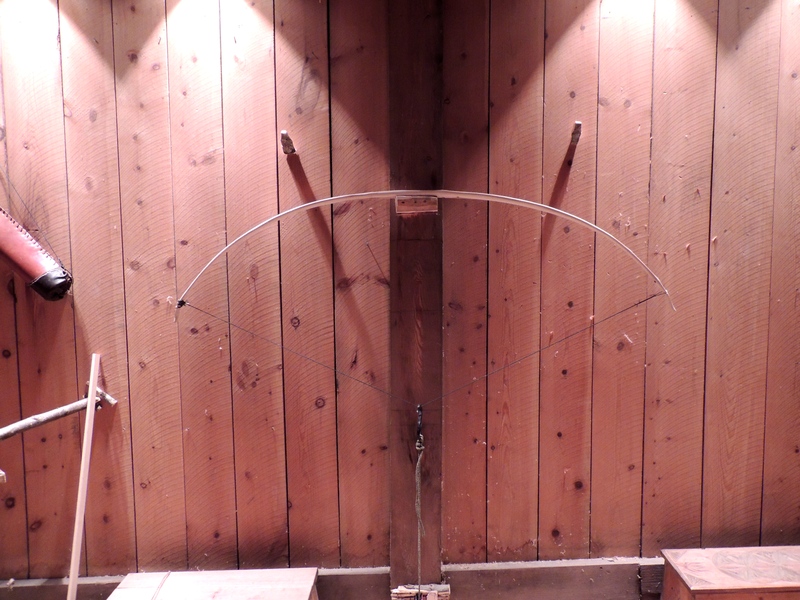 This is when the bow is first strung, which often results in a rather ‘un-bowlike’ shape, that is tedious to correct. But with guided scrapes in the right places, they each pushed on until the first bow was strung. 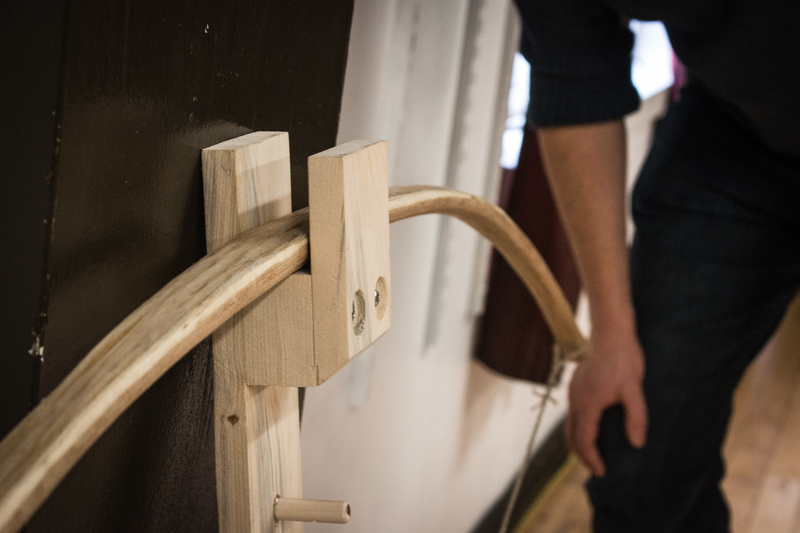 My personal goal was to get at least one bow tillered and shot by the end of each group’s overall workshop, demonstrating the entire process from start to finish; a task not usually achieved in bowmaking courses. I chose one bow from each class and tillered it while the others continued to work; stopping the class periodically, handing over my knife and letting each student experience the long process of gradually scraping the belly, drawing the bow on the string, not forcing it, but teaching the bow to bend. Overall the feedback was 100% positive. 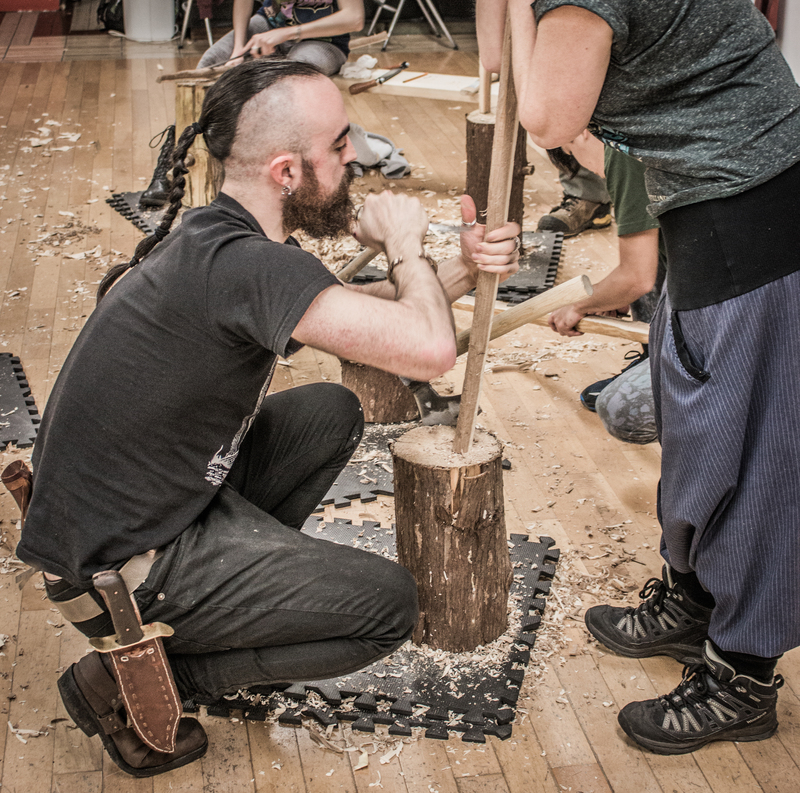 No stave broke, every bow reached the tillering phase and by the end of the the second weekend, everyone was swinging axes and drawing knives like pros! Most were already talking about which type of bow they wanted to try making next; with one chap even saying that he thinks he ‘caught the bug’. I would like to thank UCD School of Archaeology for their support in letting me take time out of my PhD to come and give this workshop. Giving these students a chance to experience the kind of research we carry out in our own Centre for Experimental Archaeology everyday, I was told, was quite inspiring. I would especially like to thank Patricia Gonsalves, director of Lykopis Archery in Vancouver for inviting me over. It has truly been an unforgettable event and one I hope to do here again some day. For more photos and articles on Stephen’s trip as well as his research and other adventures visit www.archaeofox.com , Follow or Subscribe for more! 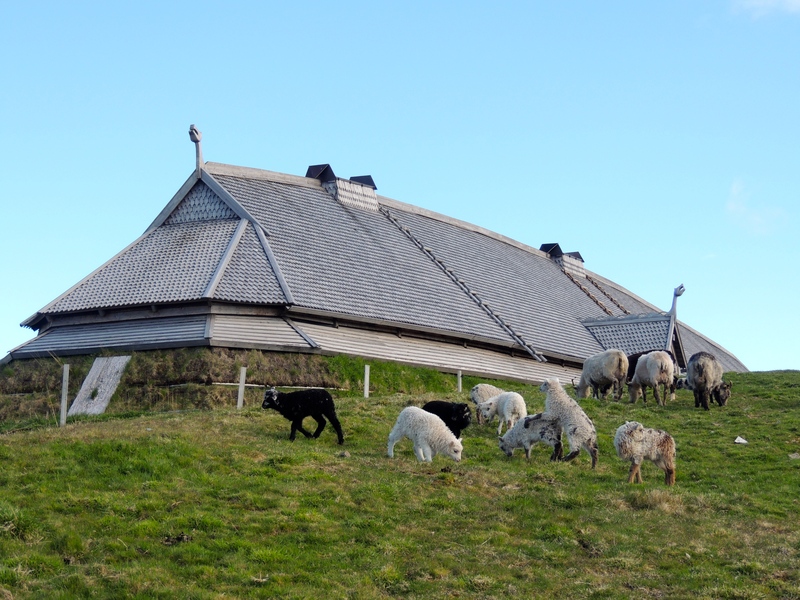 The Lofotr Viking museum has the world’s largest reconstructed longhouse. 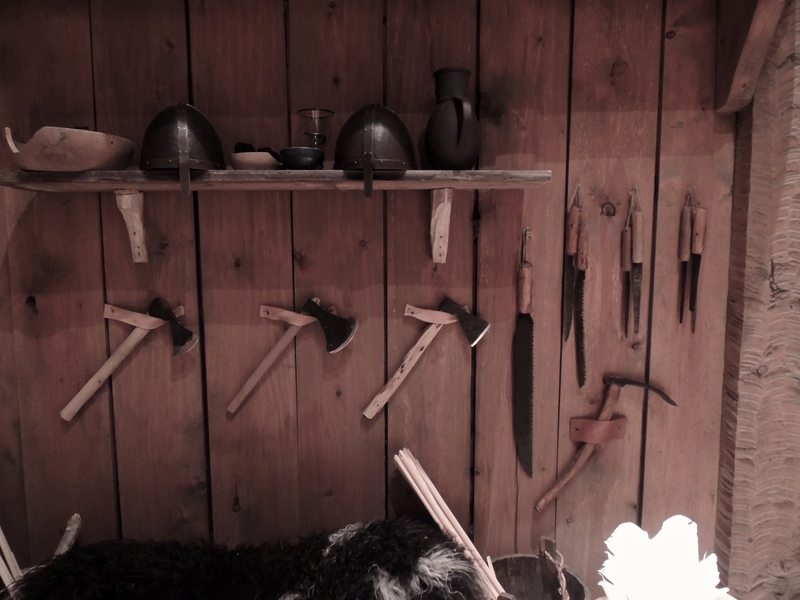 It was in the back of this longhouse, in a room known as the ‘Living Quarter’, that I built my own medieval workshop, kitted out with replica Viking Age tools and quality staves of many kinds of wood. 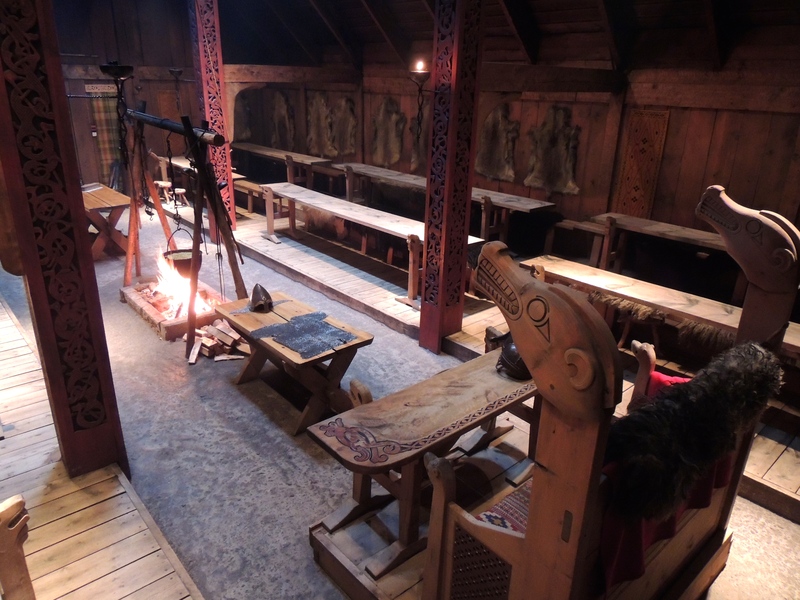 For two summers I worked in this room; hand-crafting Viking bows and arrows, demonstrating archery and teaching hundreds of visitors a week about Experimental Archaeology. 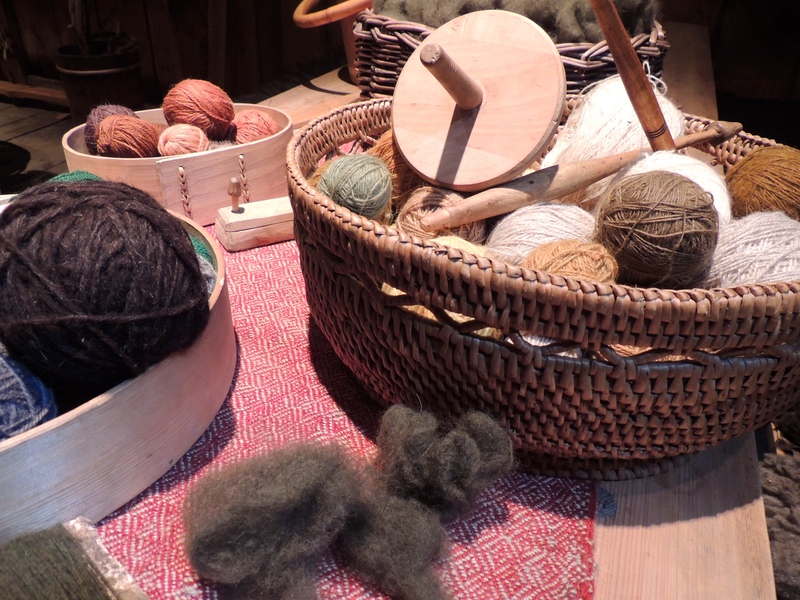 I got to work with authentic woods, with replica tools and experienced carrying out my craft within a network of activity that was created by the many other historic crafters who also worked there, including blacksmiths, wood carvers, leather workers, textile weavers and more. But worth more to me, I think, than any bow I ever made there, was that during my time I learned to sail. Not just any ship either! 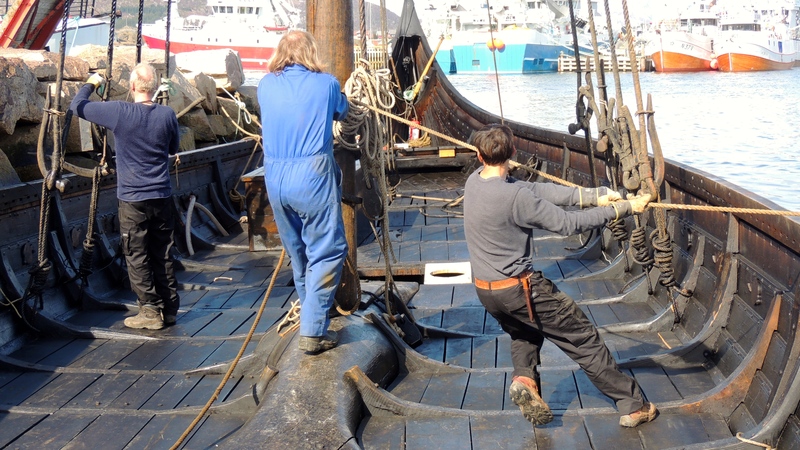 It was on the museum’s 9th century replica Viking longship ‘Lofotr’, that I literally ‘learned the ropes’. 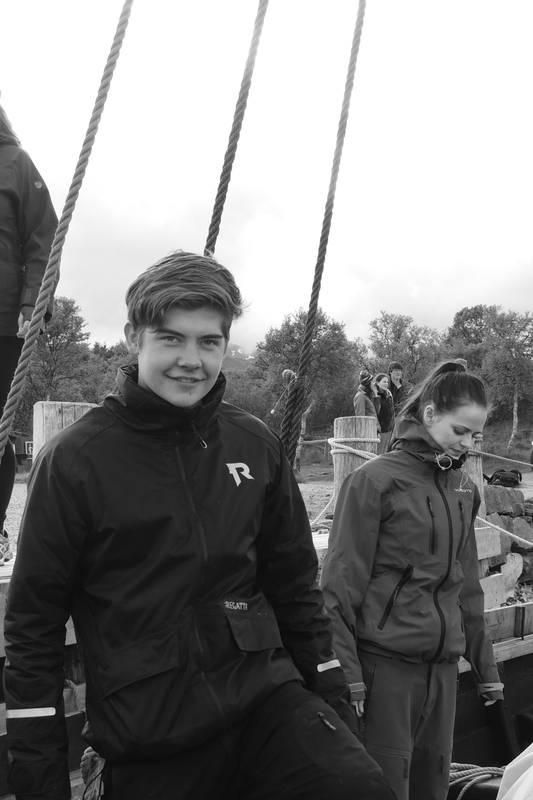 In the last week of June, we entered Lofotr in the Vestfjord Sailing Regatta. The three day trip would be my second time taking part in this regatta and the last time I would walk the deck of Lofotr, before returning to Ireland to start my PhD at UCD School of Archaeology. Many photos were taken, and when a signal could be found on my phone, I posted updates of our trip on Twitter and Facebook; of the ship, the crew, how we made it to the starting line at Nordscot; of the race and how we made it back towards Kabelvag; to the finish line. Here are the photographs I took and the stories I posted along the way. On the 26th of June, 2015, we set off from the harbour of Ballstad, one of the oldest and largest fishing villages in the Lofoten Islands. The fishermen’s cabins and red and white cafes that stood irregularly along the edge of the harbour, appeared to get smaller and smaller as we rolled slowly away from land. 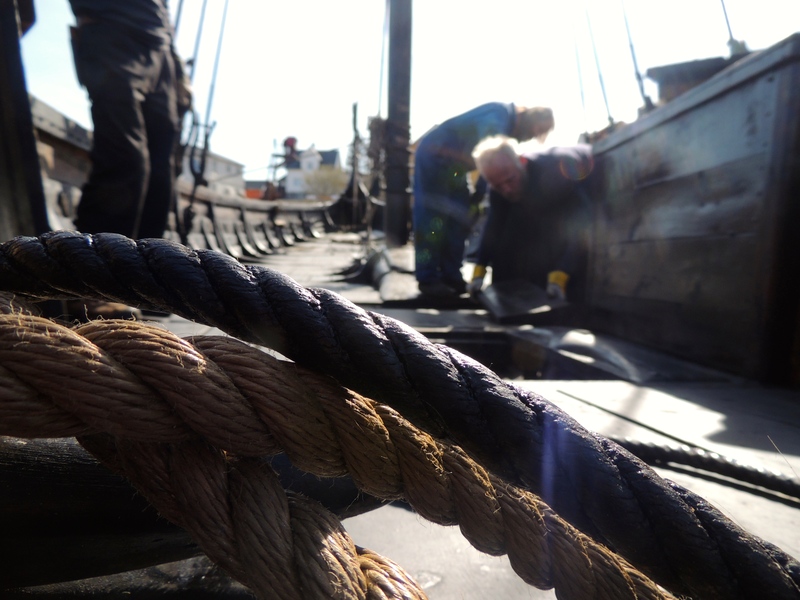 The spray of the water suited the salty sound of the capstan shanty that rang through the harbour; our song driven by the banging of wooden boxes, the clapping of wet ropes against the deck and the excitement. 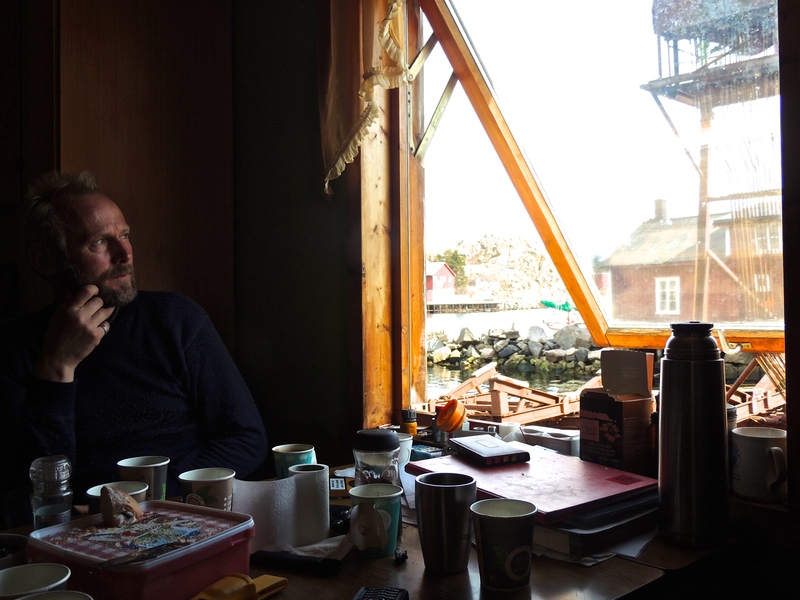 The excitement that now, after several months cooped up inside a dark longhouse, we would soon be on open waters and beginning the five hour journey that would bring us to our first destination: the starting line at Nordskott. The trip to Nordscott was long but busy. 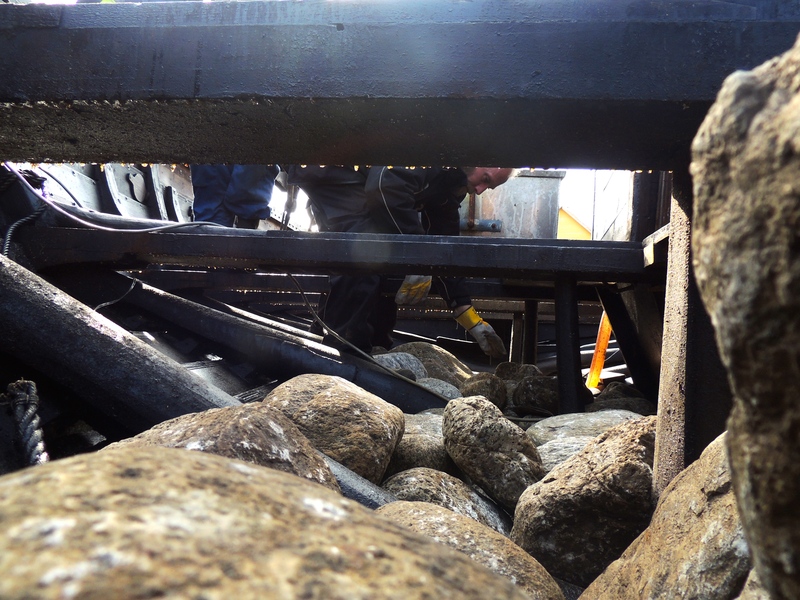 Beneath the deck, tucked away with the ballast stones and the bilge water were our bags of personal possessions, waterproof gear, life jackets, sleeping bags, crates of food, bottles of water and beer. A crisis developed within the first hour, when the cook noticed a problem with the gas stove. Before it was eventually fixed, I had to suffer the anxiety of potentially facing a three day trip onboard a tiny vessel, full of Norwegian sailors WITHOUT coffee. But with some persistent tinkering, water was soon boiling and a renewed sense of relaxation spread about the crew. After a day of fairly good winds, we began at length to slowly approach Nordskot. The twilight hue of a partially setting sun filled the ship and coated the sail in a vibrant orange as we slowly crept into the harbour. With a handsome greeting, a landing shanty was called for and so we stepped off Lofotr and into the arms of a warm party to the tune of ‘Leave her Johnny’. But reading the energy of the crew, and watching the pace and haste with which some of the younger sailors finished their chores, the Skipper promptly gave the order to “party lightly”, as we would be up early the next morning to race our ship in both the ‘Single Sail’ and ‘Traditional Ship’ categories. “… we propped an oar between the deck and our striped mass of wool, turning our sail into a tent…”. 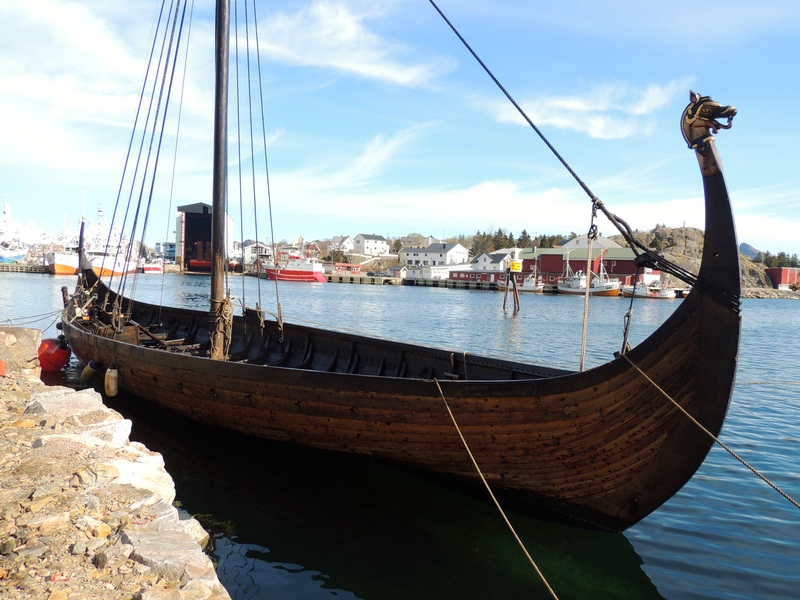 The smell of barbecued whale meat and live music filled the harbour, while many of the sailors who would race against us the next morning rowed around us curiously, examining every inch of the ship and shouting their greetings in Norwegian. 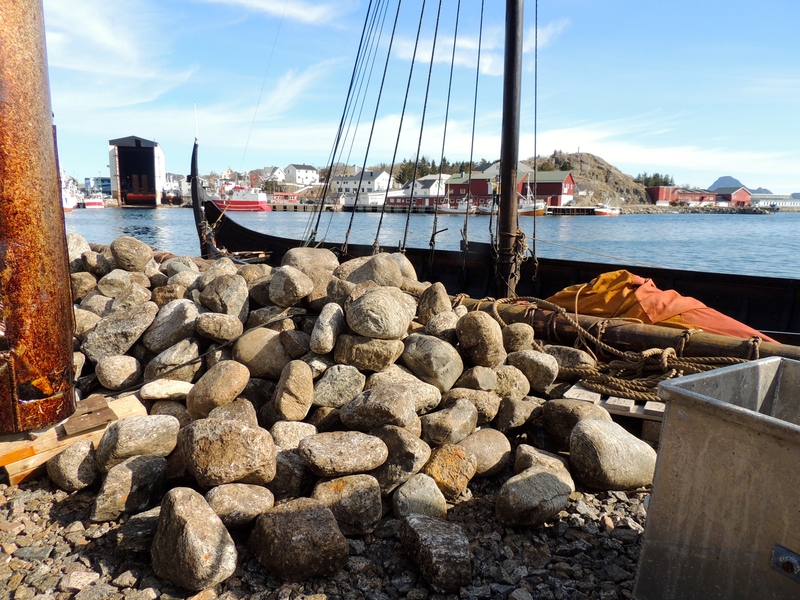 As I caught one of the ropes and tied Lofotr to the pier, there was something about the orange tinted green and grey rocks looming over the harbour, the sand, the music and the sense of party; that made me think, I felt more like a Caribbean Pirate than a Norse Viking. My imagination was all the more reinforced when one of my shipmates reached into his bag and took from it a bottle of rum, but he was ‘advised’ by the boss to save it for the following night. “Something to raise our glasses with, after we win!” he said, confidently. After a bite to eat, we propped an oar between the deck and our square and striped mass of wool, turning our sail into a tent. We threw our sleeping bags across the deck and laying down amid a symphony of snores and coughs, with a t-shirt wrapped around a sheepskin, so that it felt (and smelt) more like a pillow, I turned on one side, focussed on the ‘gluck, gluck, gluck’, of the waves that slapped rhythmically against the belly of the ship and eventually, fell asleep. We were standing at 5:30 the next morning. 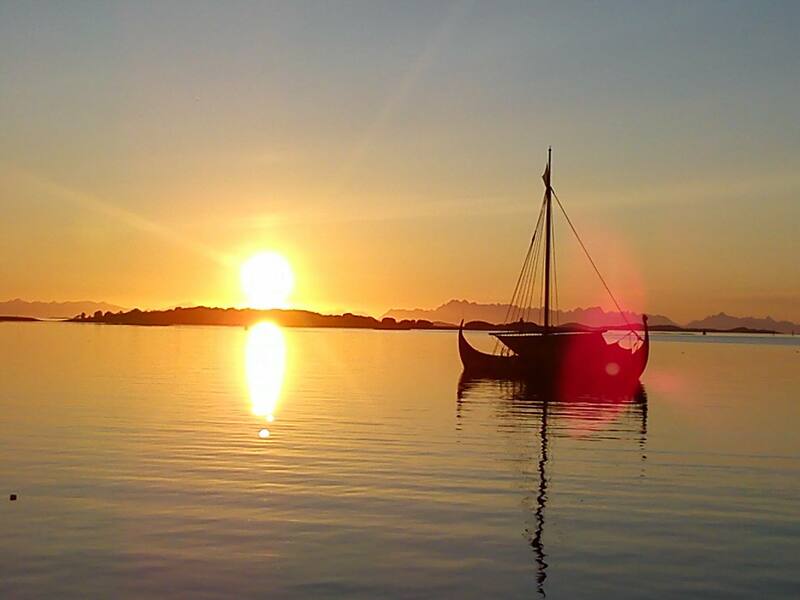 The North Norwegian sun was as bright as it was when I fell asleep; as though it had stayed up all night with the rest of the party, as it had done all summer; unable to sleep and refusing to dip below the horizon. I rose and before we could even smell the coffee, our sleeping bags needed to be rolled up and the sail back in place. Those with more sensitive heads that morning had no choice but to move as quickly as the others, for the wooden planks that formed our beds were now being pulled out to stow away the fenders. While the sheepskins that made our pillows were now being used to cover the sleeping bags being tucked away neatly behind the mast. As we approached the starting point I could see, dotted around us, the shapes of many Nurdland boats, Collin Archers and many other traditional boats I had never seen before. As we waited in relative silence, Terje pointed out each ship and told me their names individually in Norwegian and then in English. Suddenly, a fog horn marked the beginning of the race, and just as the many white, bobbing dots scattered around us did, we took out our oars and began to row. Last year, we also began by rowing, but the persistent lack of wind left us with no choice but to forfeit and turn around. Lofotr is a very heavy ship and takes a lot of power to row. But with the right winds it can also be an exceptionally fast ship, reaching up to 17 knots in good conditions. With rowing spirits lifted only by the smell of brewing coffee, I began to hear murmurs of ‘winds’ circulating among the crew. The more experienced ones looked back and forth between the sail and the surface of the water, scanning for any signs of a lift in the breeze. Then, after forty minutes or so of rowing in turns, a gust of wind suddenly came around us and filled the sail, carrying Lofotr with it. With a safe pace our captain gave the order for a few shanties. 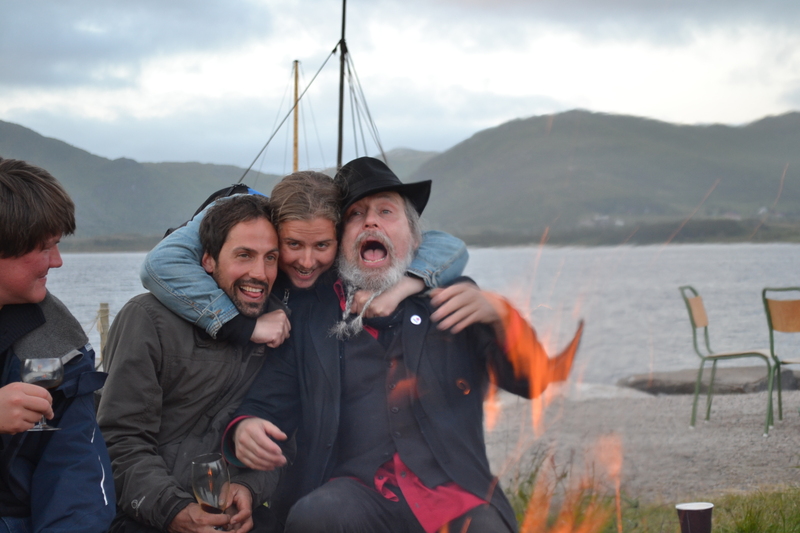 I whipped out the guitar and we helped ourselves to a Norwegian lunch of liver pasted crackers and caviar, dried cod fish, some local brown cheese and of course a warm serving of wild boar that had been prepared in the Chieftain’s Longhouse back home in Lofoten. After eight hours, Kabbelvag was in site, we rushed to grab the fenders and though we must have looked to locals and tourists like a band of Vikings, with nothing but plunder on our minds, I can confirm without a margin of error that the single thought on everyone’s mind was the inside of the bar in Kabbelvag square and the taste of the local beer. As we sailed into Kabelwag at quite a fast pace, there were so many other ships from so many different categories there already, that there was no way of knowing in what place Lofotr had come. But it didn’t seem to bother any of the crew. We each stepped off the ship and made our way to the bar, where we were met by a young man who refused us entry at the door unless we were willing to part with what seemed like quite an unreasonable entry fee. In the spirit of the Viking clothes we were wearing and having arrived in a Norse vessel that absolutely dominated the harbour, we unanimously decided that the image would be best preserved if we were to instead, borrow a smaller rowing boat, and enter through the back, where the bar opens out onto the water. On our way back from the bar we could smell the other ships preparing food. 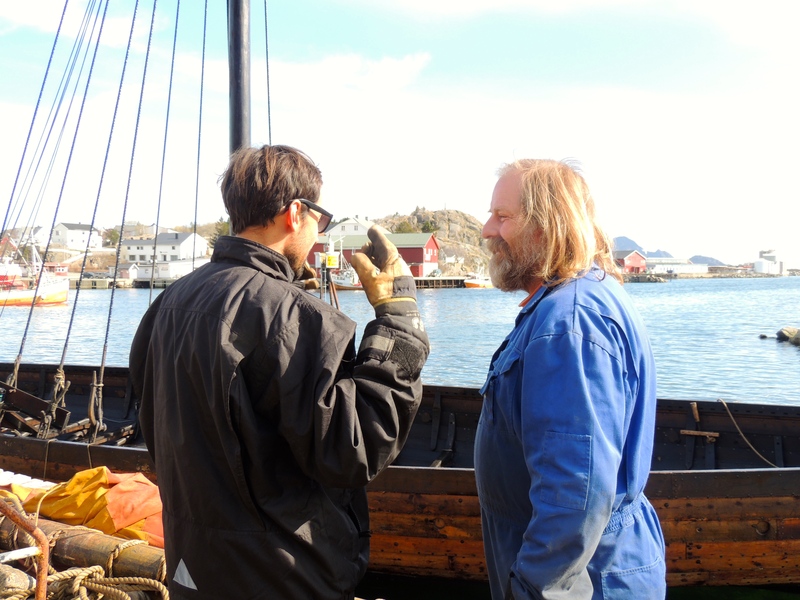 We stepped onboard again and saw Terje, chatting with the other sailors who had tied their boats to our’s. “Whale!”, the cook shouted back, noticing me take a guitar out of a carrier bag. “Ohhh, are you going to sing some songs? !” he asked. “Maybe”, I said in return, “if my friends here can sample some of your cooking?”, I said in return. “Stephen is a shanty man who has come all the way from Ireland”, Terje added, with confidence in ‘sealing the deal’. “Sounds like a fair deal!”. Terje dished out the samples as I sang a few songs. By now, the crew knew the words to my usual repertoire, and sang along with me. An announcement was then made that a representative of each ship was to go and hear the results. 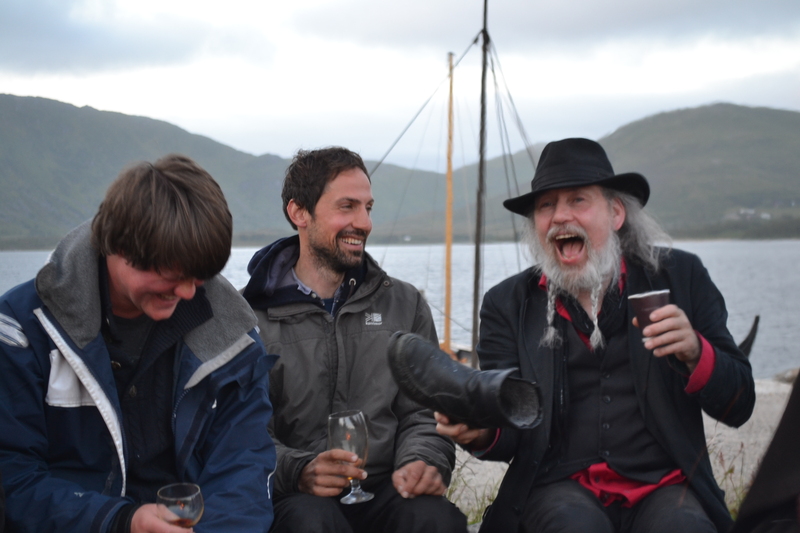 On his return, it was with great pride that Terje removed the lid of the rum we had saved the night before, and on handing out glass after glass until the bottle was empty, he raised his own and announced that our longship had come first in both our categories. Terje was always happiest when telling stories of old successes or delivering news of new ones. A look comes over his face every time he sees a win; the head tips forward, the chin down in a cheeky grin. It’s the same look he had when he first invited me to sail with Lofotr, and a look I hope see when I return to sail here again. “Come on Mr. Fox,”, he said, raising his glass once more, “I think it’s time for another song!”. Thank you for reading this article and taking the time to look at my photographs! If you enjoyed reading please do ‘Follow’ and add your email to the homepage for updates on my latest articles! Thanks again and watch out for more updates from ArchaeoFox! “Objects have stories, lives, biographies”. From their makers to breakers, their takers and then re-remakers, the stuff that once decorated a much older and different world from ours had owners. Owners that gave them a purpose. They were used, traded or passed on until they became broken, lost or discarded. And when an archaeologist finally takes it from the earth, these things enter a second life. One with a very different purpose, destined to fulfilling a modern curiosity and displayed in ways that would perplex their makers. Since I was a boy I have often found myself in a stifling museum; my coat hanging across one arm, eagerly peering into some glass case and standing back only to let the condensation before my nose dissipate. ‘what are you?’, I would ask. ‘who made you?’, and ‘Why’? Often, you can see what an object was made from; stone, metal, wood or clay. 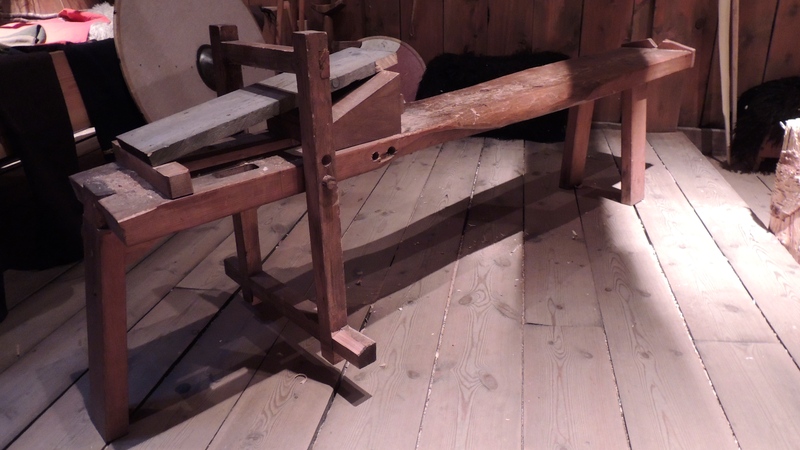 From its shape and style we can guess its function or even how it was used. What you can’t do, is touch it. Feel it. Own it and know it, inside out. The senses we have in common with our ancestors are now our most useful tools. And vital to an holistic understanding of the past. In September 2015 a small group of students at University College Dublin, had the opportunity to explore the ancient past in a way that right now other archaeology students simply cannot. 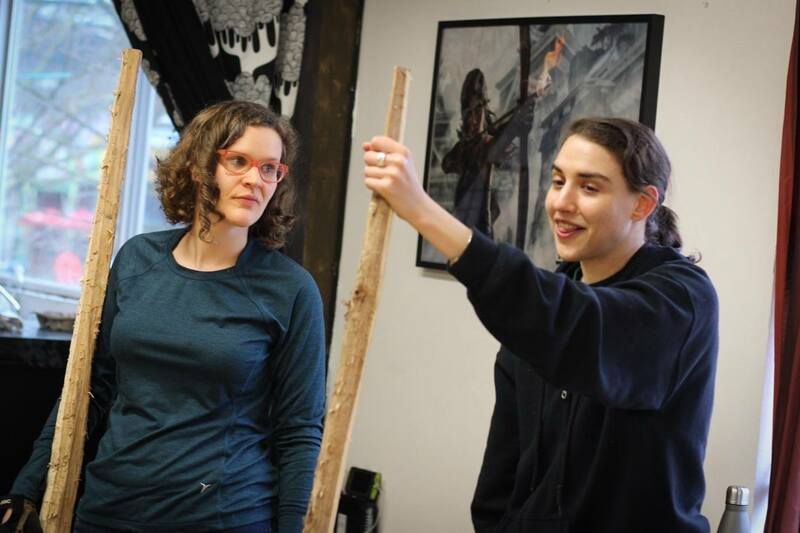 Over the course of two weeks, at our Centre for Experimental Archaeology and Ancient Technologies located on campus, these few students went on a journey through craft and technology; from stone to clay, fire, wood and textiles. 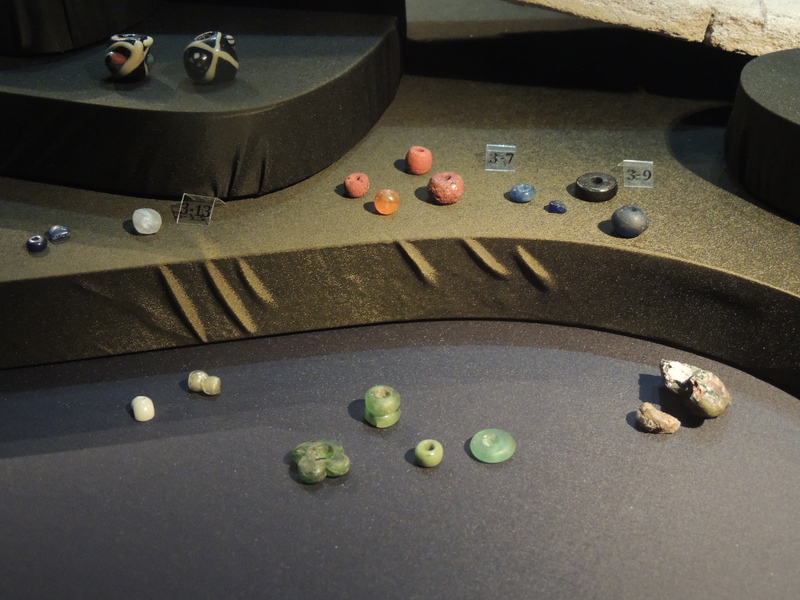 In what was once described in ExArc Journal as a ‘whirlwind of activity’, I saw for myself the museum glass being slowly removed and replaced by ownership and understanding; stepping into the display case and experiencing each hidden element of every little life. Our Professors here understand more than any, that Experimental Archaeology means getting your feet dirty! The base of a clay oven in production. First time turning clay in the hands. lining the base of a clay oven with stones. Even when when not excavating, some relationships remain strong! After taking over 3,000 images this semester, I can’t find a single photo where someone is not smiling! Appreciation for the final touches, delicately present themselves only after each student takes a pride in a pot they made; not something you get at an average museum. A view of my apartment block on Campus at UCD, with a full view of the experimental centre. With every touch, we slowly bridge the gap; removing that museum display case glass to touch the very matter of ancient worlds. It seems everything needed to build a ceramic workshop is right at our feet! The Mesolithic house watches the girls through the trees as they retrieve the grass we will use to make a clay oven. A Student shapes a piece of clay for the first time, connecting with the past through his hands. An old exam table still gets used in our centre, some souls die hard. 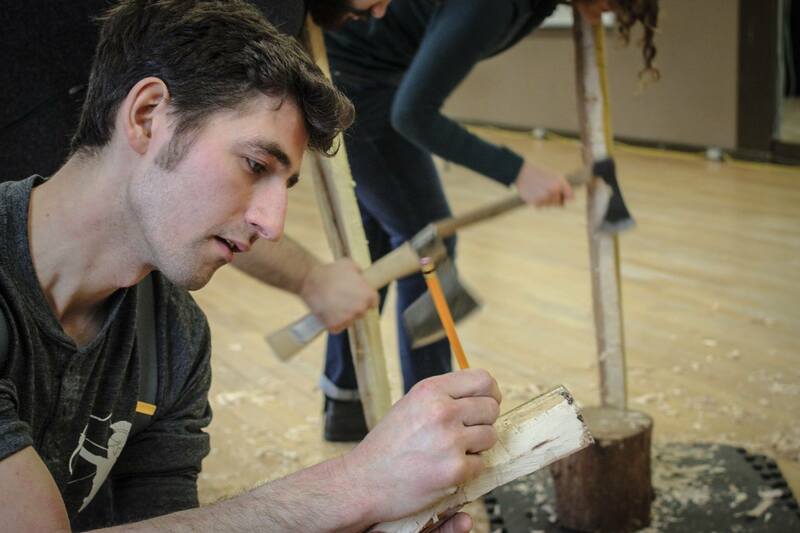 PhD Scholar Bernard Gilhooly shows the difference between steel, bronze and stone when chopping wood. Through the window of my room, in the little white house at the foot the museum, I sit at my desk; a broken, white chip-board drawer, refashioned into a writing table and decorated with a purple sheet, to hide the screws. 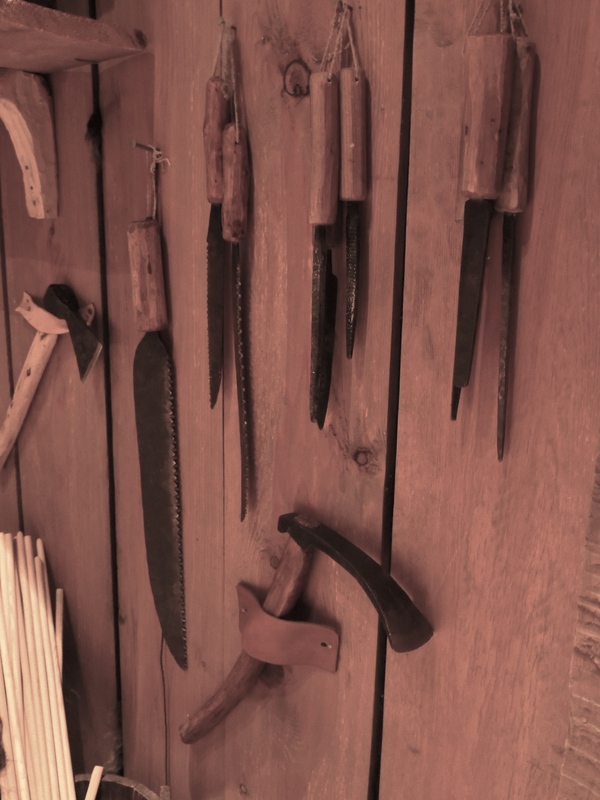 ‘Axes’, ‘Chisels’, ‘Rasps’ and ‘Awls’; ‘Adzes’, ‘drill-bits’, ‘timber’ and ‘Bronze’. If there is a finite number of times one can repeat a set of words before they all start to blend, then surely I am about to approach it. 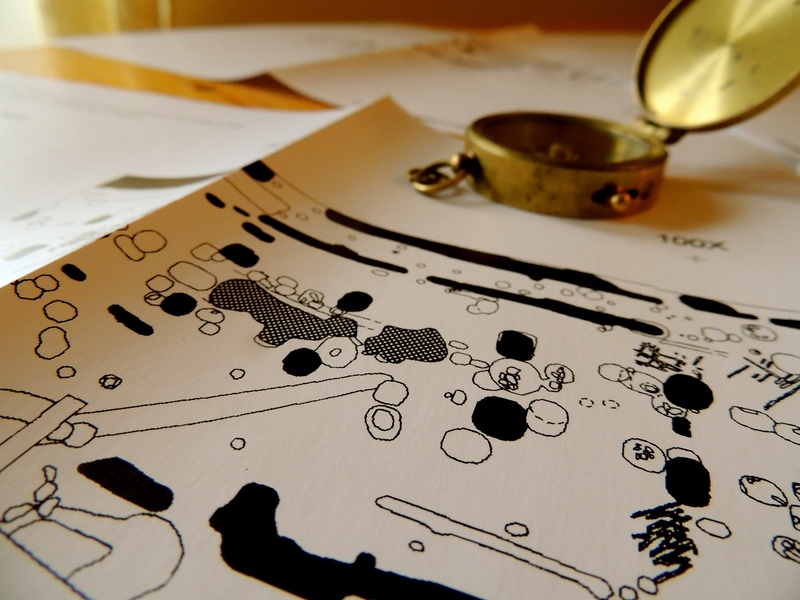 But I know myself – by tomorrow, I will be stapling the edges of a PhD proposal I had been working on since Christmas and posting it back home, to UCD School of Archaeology. 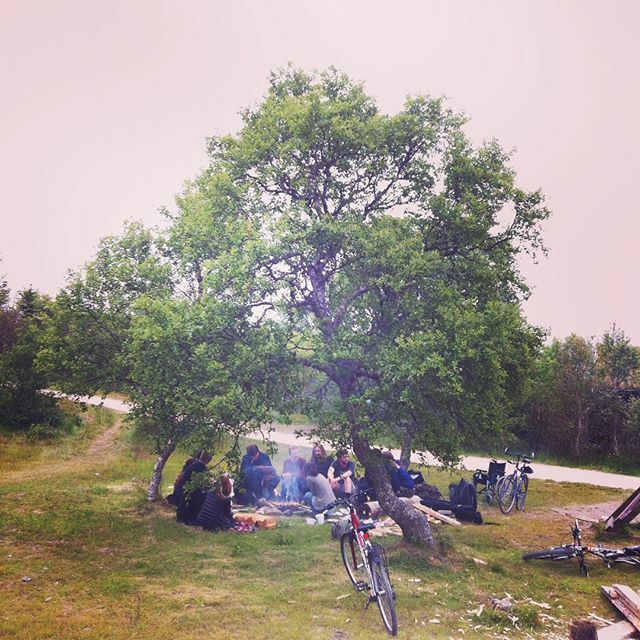 “The all too Norwegian smells of overly strong coffee and tobacco drifted in behind the music, while the chicken and pork below barbecued and beckoned me to join the party.”. I pull my face away from the laptop screen, resting my eyes for a moment; noticing where I am. Beyond the cups on the ledge, a road stretches along a row of Norwegian houses – the occasional truck roaring past a wave of blues, yellows and reds that move away towards the next town. While alongside them, telephone wires slouch between the heads of each street lamp like the lines on a stave of music – only drooping, as they wrap around the foot of every mountain. 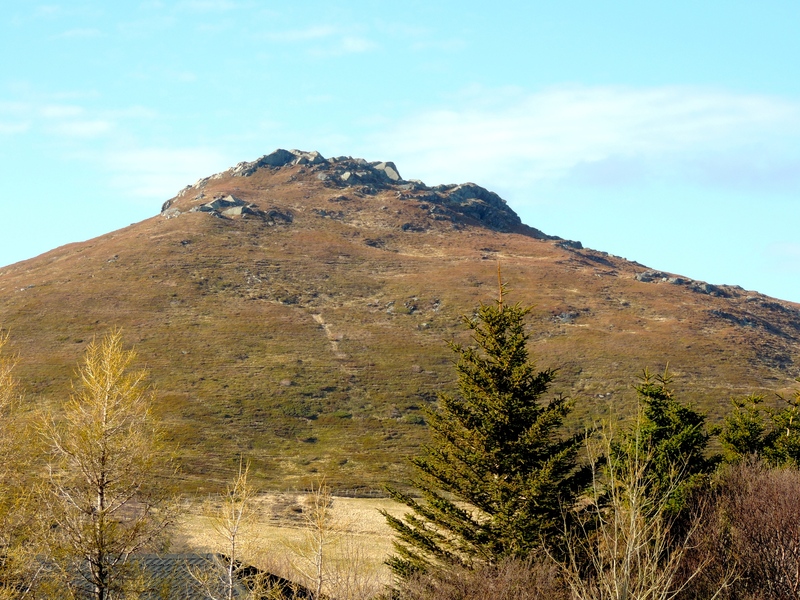 Not a single cloud could be seen beneath our sleepless summer sun in Lofoten and just as I imagined what my housemates were doing with their day, the tinny sound of a tiny Bluetooth speaker crept through the open window. It was the first rainless day we’d had in weeks and my housemates – all seven of them – wasted no time in making use of it. 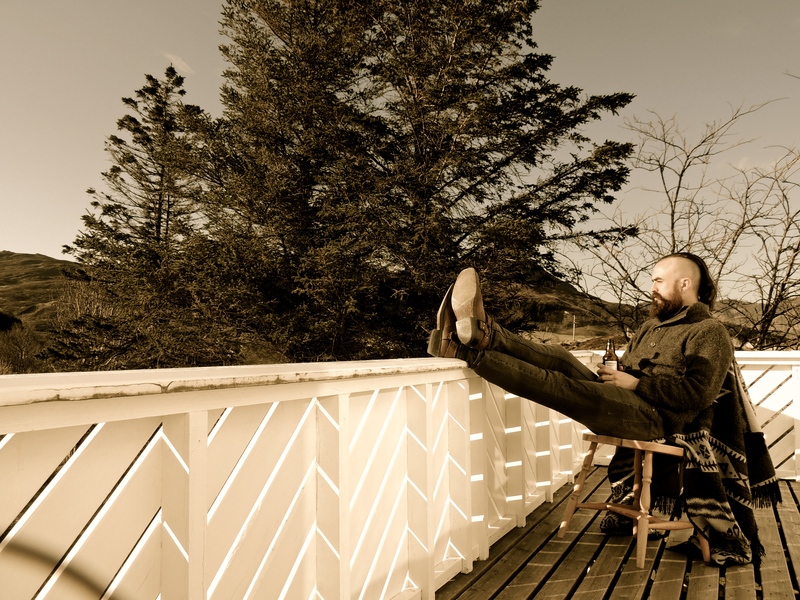 They sat on the veranda connecting their phones in turns; crackling a compilation of hip-hop, reggae and unforgivably what sounded like Norwegian rap. While their voices blended in a muffle of Norwegian, Dutch, Italian, Spanish and English – talking over each other in different dialects but all laughing in the same language. The all too Norwegian smells of overly strong coffee and tobacco drifted in behind the music, while the chicken and pork below barbecued and beckoned me to join the party. Such life, is what gives a house character. Without it, a place like the Chieftain’s longhouse at Borg, is merely a box of decoratively carved walls. Though magnificent, they are empty without the droppers of the things in the ground. The walls of our house were by now accustomed to the voices of Tom, a leather worker and graphics designer from Holland; the first to arrive after me. 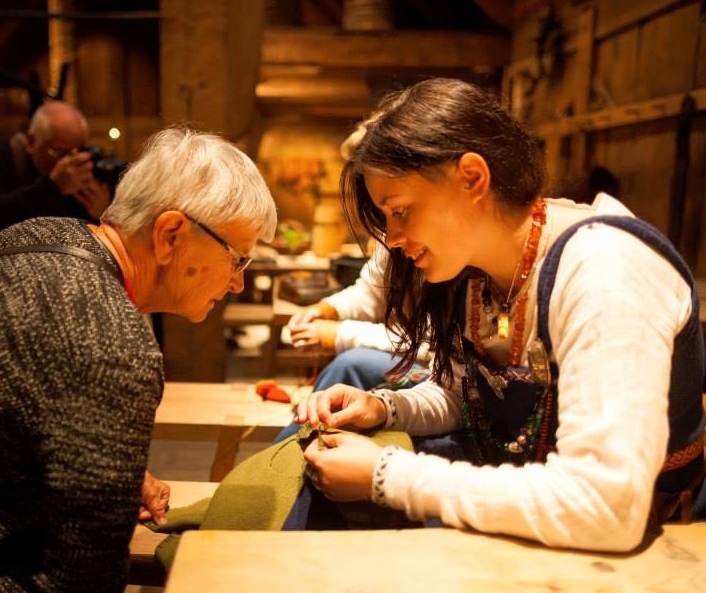 He was followed by Hanne, a Norwegian Media Studies student who had driven several hours from the South of Norway to spend her summer guiding in the longhouse. 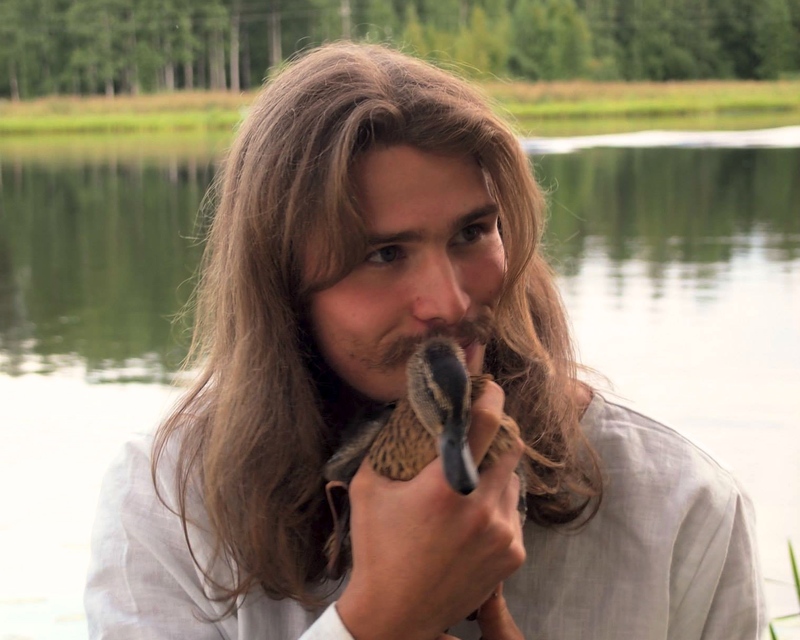 Filling the back seats of her car were the several musical instruments of Goran, an archaeology student from the University of Trondheim – who had, not only a passion for Viking Archaeology and a knack for medieval music – owned as much viking clothes and jewellery as I did knives and tools. Using a database of maps and satellite images, Goran and I hunt for local archaeological features in the area. Espen turns sharply, as the second group gains on us. Espen, a good friend and sailor, arrived a day or two before Goran. He was shortly followed by Bernhard, whose height made me feel more like a Hobbit than a Viking, and who’s head in an inadvertent tribute to the book, never truly forgave the chandelier in the hallway. 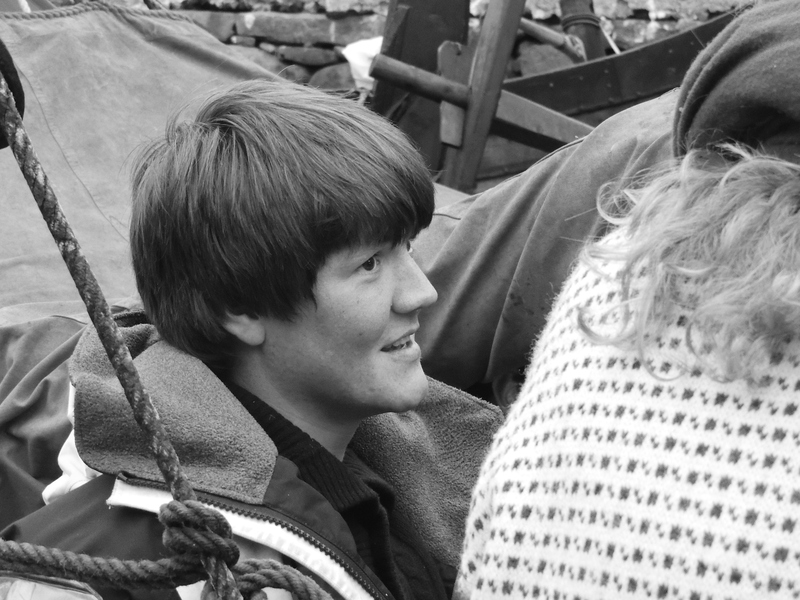 Both of them had studied sailing at the Fosen Folkehøgskole and would now spend their summer on the lake, lifting sails and rowing tourists about in our miniature Gokstad ship. “On a rainier afternoon the HDMI cable is our source of entertainment – that and the collective pot of movies that circulates between those with external hard-drives; the currency of a world without wi-fi”. Niek tells the one where Thor loses his hammer. 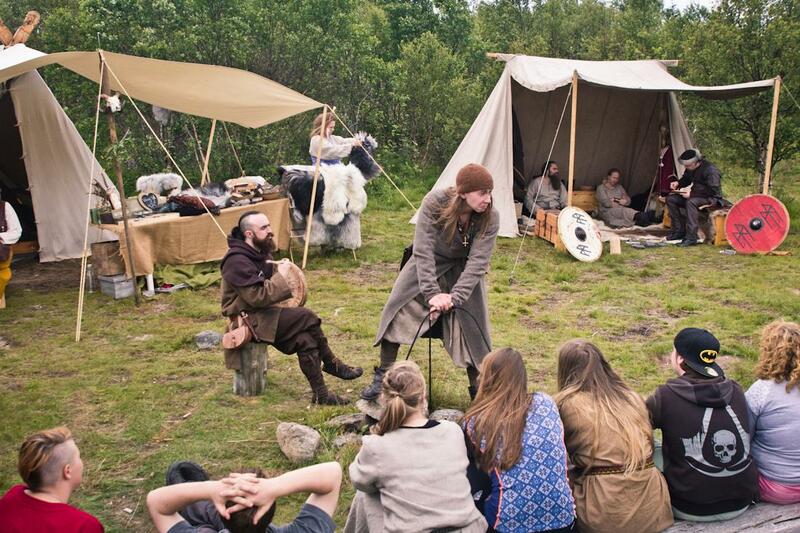 As the summer came in, it brought with it the few remaining stragglers; like Johanne, a trainee nurse who would work in the cafe, and Niek another archaeology student from Holland – who was good at fight reenactment but would also discover this year a flair for Norse storytelling. A dull moment never occurs in a house of such concentrated interests; though, on a rainier afternoon the HDMI cable is our source of entertainment. That and the collective pot of movies that circulates between those with external hard-drives; the currency of a world without wi-fi. Movie night at the white house! A nicer evening is usually spent hiking, driving or sailing. Though nothing creates a gathering quicker than a sizzling pan of barbecued food. And in the end, a guitar is usually heard and Jared can always be seen somewhere in the back, reaching into his blue, waterproof sailing bag and handing out a few bottles of home brewed beer; a hefe-weisse or a dark ale, but occasionally some of his more unique brands of chilli, coffee, and even seaweed beer. 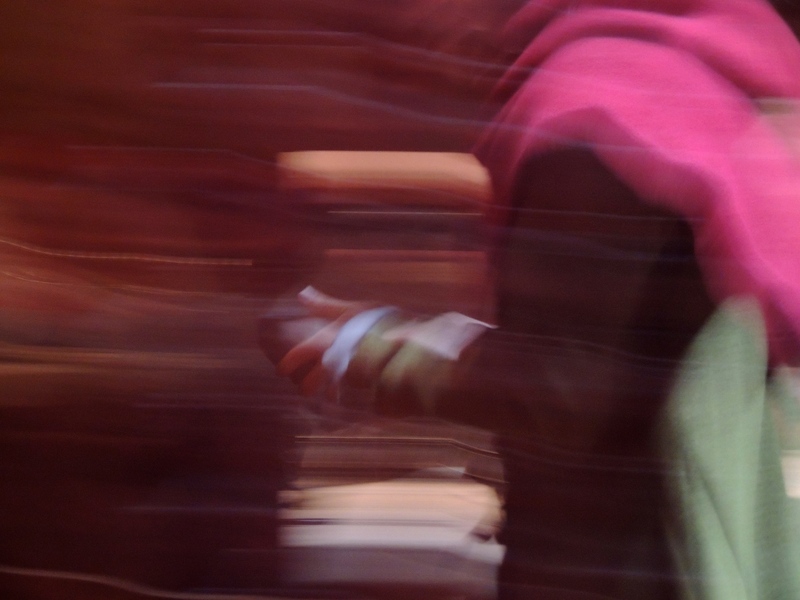 After a few months, faces and voices became familiar, routines became synchronised and rituals blended. So much so, that our little White House barely even resembled the empty, quiet shack it was when I first moved in. 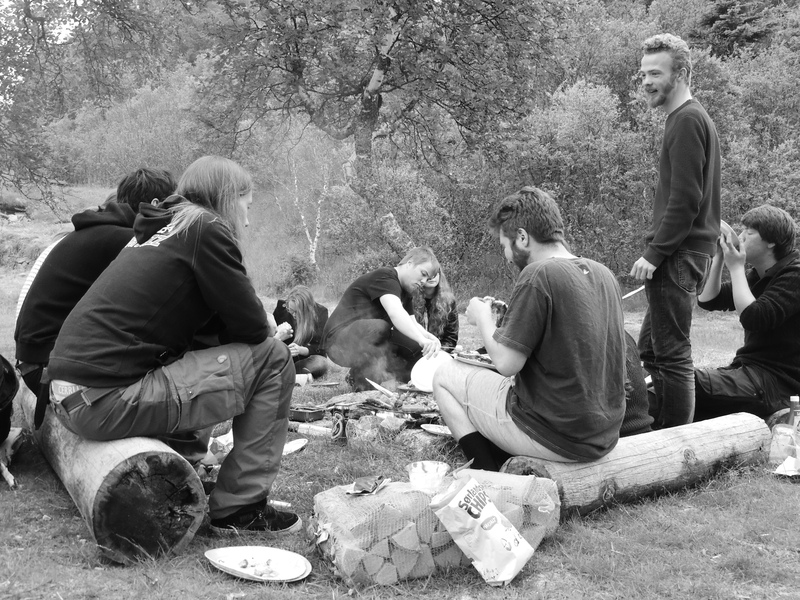 “… nothing creates a gathering quicker than a sizzling pan of barbecued food”. 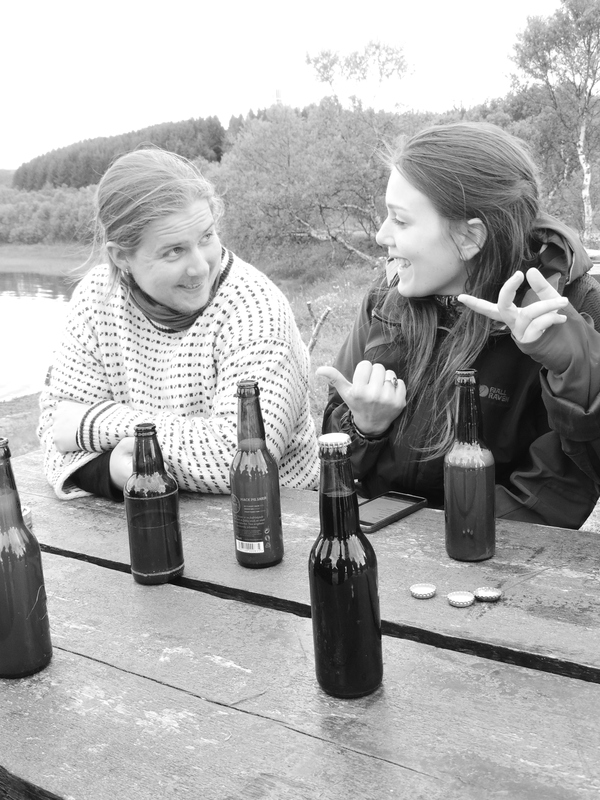 Espen and Hanne, during a tasting of Jared’s beer. 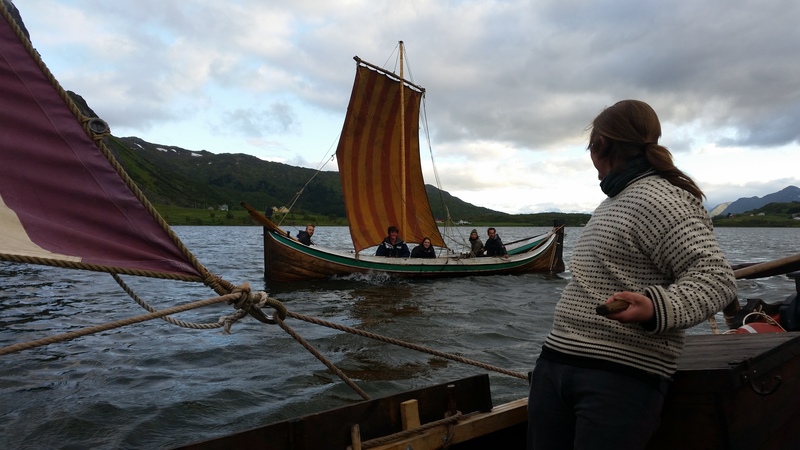 Gaute boards our smaller Viking ship for an evening race around the lake. “… their voices blended in a muffle of Norwegian, Dutch, Italian, Spanish and English – talking over each other in dialects but all laughing in the same language”. 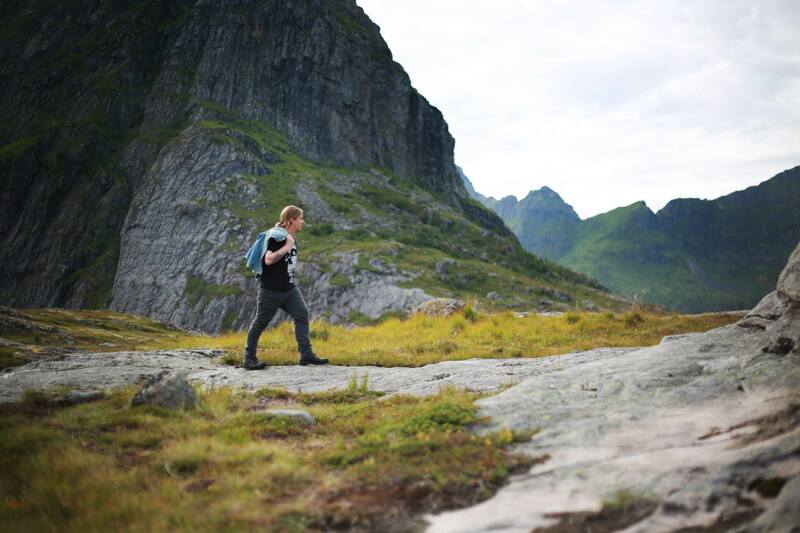 Espen throws his coat over his shoulder, as we hike over the hills of Å; photo by Karianne Kaas. 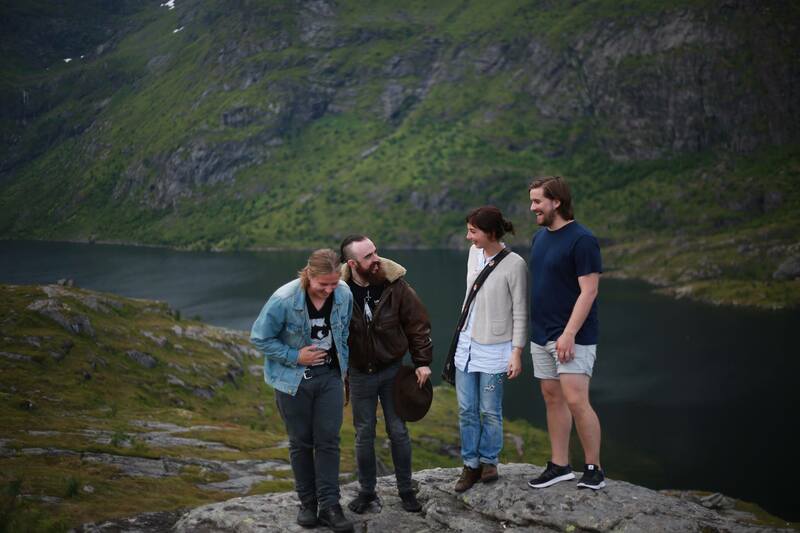 From Left to right; Espen, Stephen, Laura, Sivert (Espen’s Brother); Photo by Karianne Kaas. 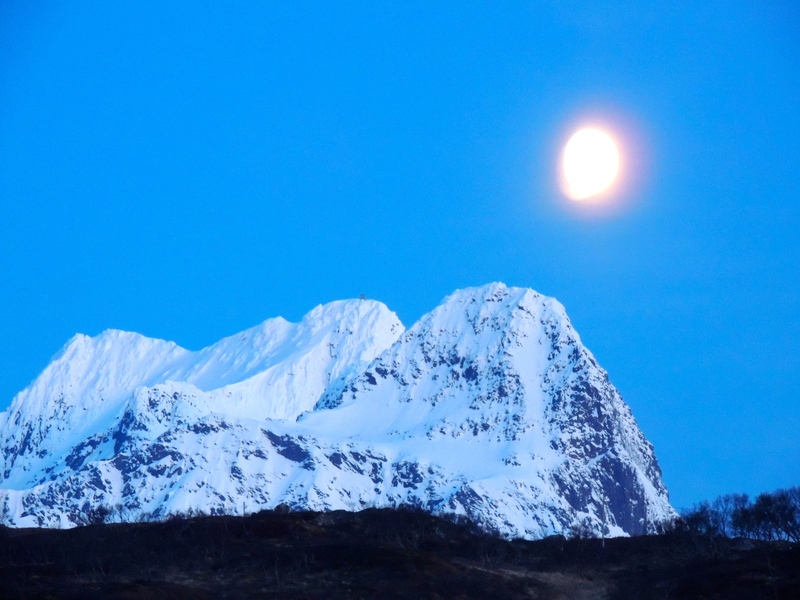 It was the end of April and the last dark sky of winter had passed over Lofoten. Terje unlocked the door and handed me the key. “You are the first to arrive” he said, popping his head in on front of me. The old family had just moved out and it was so soon after the museum’s purchase that he hadn’t even been inside yet. “We had to buy it” he said, “Each year brings more crafters and guides and many can only work here if they have a place to stay’. Settling in with a cold one on the balcony. We inspected each room together; the kitchen, basement, bedrooms and bathrooms. We then stepped into a wide living room that had a tv and on its wooden floor, a leather couch that wrapped around the half the room. A framed picture of the house, marked with the year 1985 stood on a coffee table at one end of the room. While on every wall, hung the collected decorations of an older generation. Terje found the remote to the air conditioner. “If it’s cold, just turn up the heat like this”, he said, pressing a button that offered no response. Knitting his brow, he tried again before handing the device over to me, smiling. “It’s ok, there’s some firewood down by the boathouse you can use”, he said gesturing to an old wood burner that was fixed in the corner of the room. With a handshake at the hallway, he was gone. But no sooner had the door banged behind him, did I have my boots back on and was making my way down towards the boathouse, where, after a few minutes, I could see appearing through a slight fog over the hill, the shape of the Chieftain’s longhouse. A figure stood out in the middle of the road. It was tall and dressed in medieval clothes; standing in front of a wide open gate and waving his hands at an enormous white tour bus, guiding it into the car park like a Boeing 747 on a runway. It was Manfred, a German guide who worked with me the previous year. He smiled at the bag of birch logs I was carrying on one shoulder and gave a hearty wave, before jumping aside; narrowly avoiding the flow of tourists that spilled out of the bus doors and into the car park. I returned the wave and continued down the long winding road; flanked by grassy fields that seemed to surround Borg like it was sitting in a rocky bowl of green milk. The front door of the house closed behind me. I kicked off my boots, opened the wood burner and in a few minutes the room was glowing; orange, with the crackle of kindling. 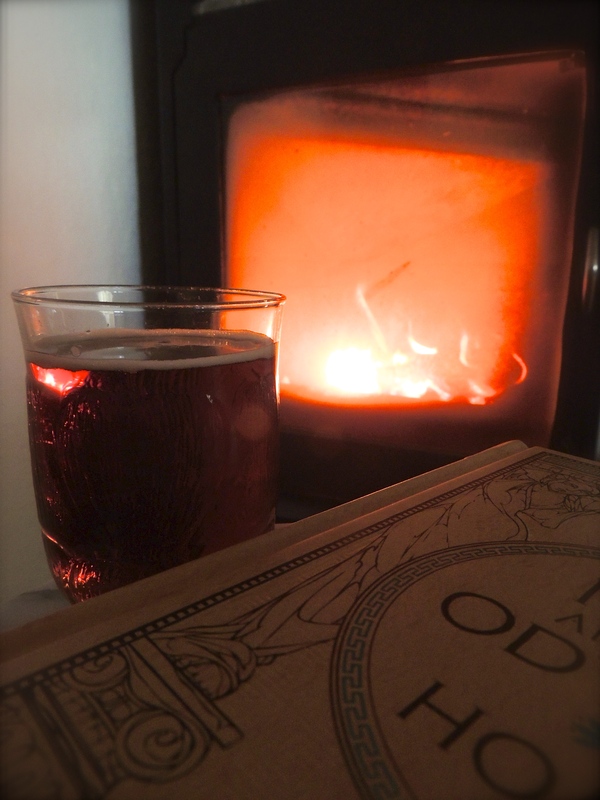 “I kicked off my boots, opened the wood burner in the living room and in a few minutes the room began glowing; orange, with the crackles of kindling”. Like a snail who carries his house on his back, I had once again overpacked. In anticipation of the limited amount of internet, I had brought many books that I knew I would need for my studies, as well as an arsenal of comics on my iPad, several 3DS video games and a violin to combat the boardroom. 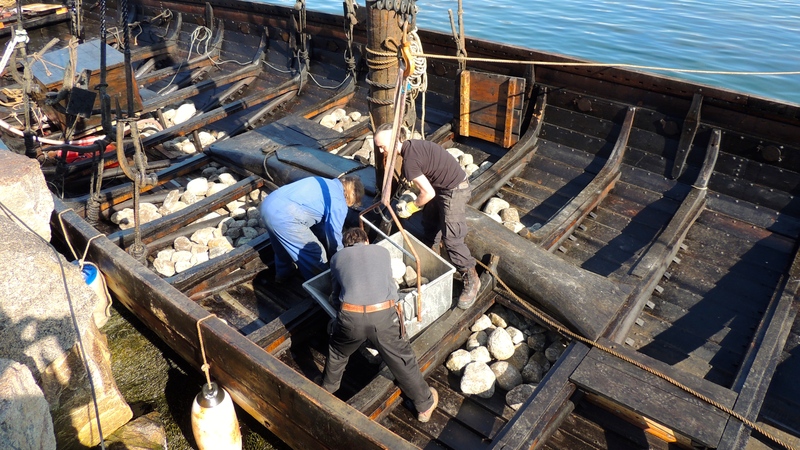 I had started a different PhD proposal over a year ago, which focussed on the archaeology Early-Medieval and Viking-Age Ireland; however, by Christmas last year, I had changed my ideas, pushing my focus back to around 3,000 BC, examining the carpenters of Bronze-Age Greece and the Eastern Mediterranean. To pass the time last year, I survived purely on the Viking history and archaeology books they sold at the museum gift-shop. But now, although the books in my suitcase were wrapped in the robes of a 9th century Viking bow-maker, their contents, as with my thoughts, were far away in ancient Egypt and Greece; peering over the shoulders of Howard Carter, as he pries open the doors of the child pharaoh’s tomb; or beside Menelaus and Paris as they slug it out by the gates of Troy. At the centre of a circle of stuff on the floor, I heard a banging in the hallway; but it was’t the rap of a fist. Where no-one uses their house keys, a knock on the door is replaced by the sound of a visitor kicking off their shoes. 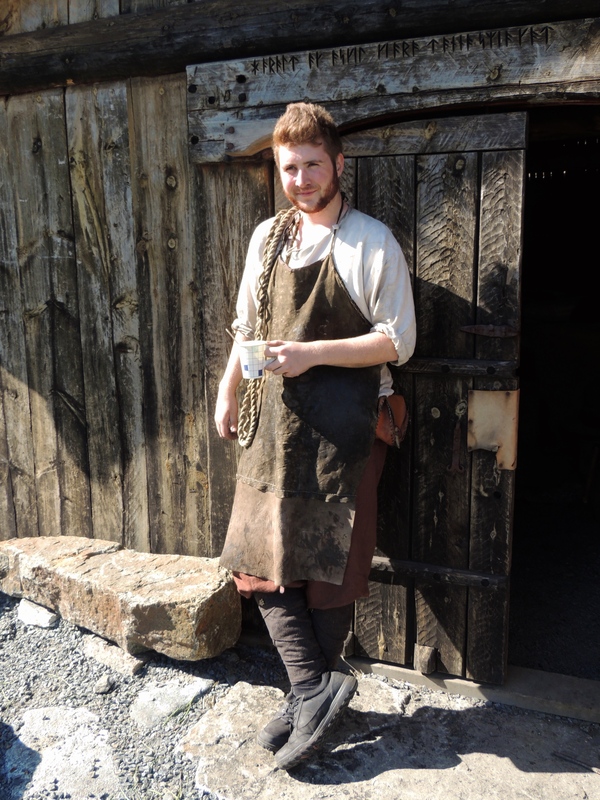 It was Brage, the apprentice blacksmith and a friend from last year. He was a bit taller and broader than me, and although his red tinged hair was thick and dark, his ocean-blue eyes always gave him away as a Scandinavian. “Hei, Hei!, Lenge siden sist!”, he said with a smile after we embraced; to which I drew a blank. “You still haven’t learned any Norwegian yet?” he asked laughing. “How’s your Irish”, I said in defence. “I only remember the one word you thought me” he answered, “When you couldn’t remember my name at first, you said you would think of the Irish word for ‘shoes’ ”. “Oh yeah!” I laughed, remembering; “Bróga!”. An apt name for someone who has a passion for walking and he certainly used his ‘brógs’ since I’de last seen him. We sat on the leather couch and he told me all about his bartending course in Barcelona; of the people he met, the laughs (and troubles) he had gotten himself into. He told me then, of how he walked across Spain on one meal a day. He listening to audiobooks on his phone on a pilgrimage from hostel to hostel, where eventually, he met a Norwegian family who offered him work on their farm in Northern Italy. “How about you?” he asked. “Where did you go?” he asked, selecting a book from a pile on the middle floor. “Wow”, I said, “I went to North Italy too, but my trip wasn’t that adventurous – It was for family and research – I spent ‘New Years Eve’ in Bolzano, a city in the Alps where my girlfriend’s parents live.” I said, “But every time I go, I stick in a visit to Ötzi, the 5,000 year old Iceman that was found in the nearby mountain”. “It’s just a coincidence they happen to share the same town”, I added ironically. “It was meant to be”, Brage said with a laugh, selecting a book on Egyptology from the pile at the centre of the room. “I stayed for about ten days, but later that week her parents drove us to the Torino Museum of Egyptology” I said, continuing. 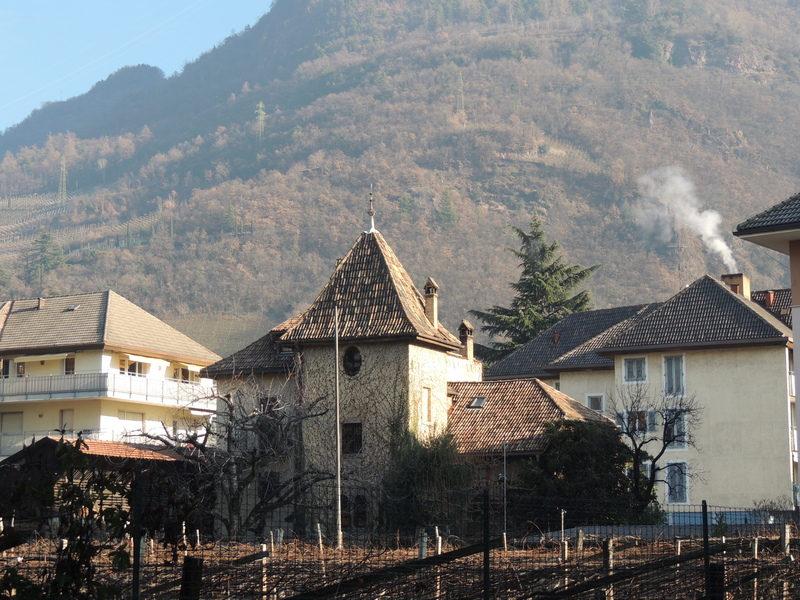 A view of the mountainous backdrop that surrounds the South Tyrolean city of Bolzano. “You wouldn’t believe the preservation of the wooden objects there!”. “Inspiring?” he said, placing the book back down and spotting the violin in the corner. “Well, it made me rethink my whole project!”. “And your Girlfriend, Elisa, she is still studying Canada?” he asked. 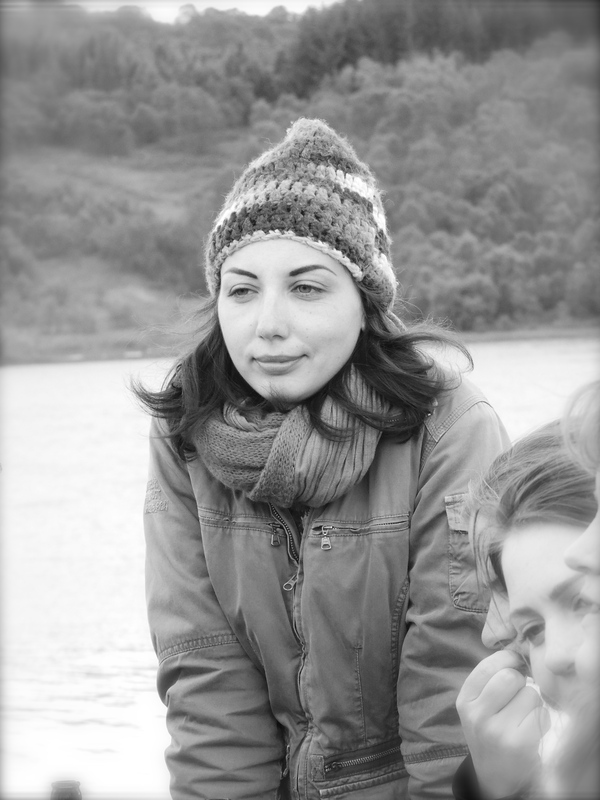 “Yes”, I said, “She’s halfway through her PhD; three more years in Tissue Engineering’. He picked up the violin. “You’re learning to play?” he asked, plucking a string to his ear. “I tried twice before, but I always gave up”. I said, “But this time, I pushed through the ‘sounding like a bag of cats’ phase; I’ve actually started to play some real pieces. “I’ll wait a little before you give me a demonstration then” he said with a laugh, turning the grain in the light. “Where did you get it” he asked? “It’s my cousin’s” I said, “I took my brother to see the British Museum in London and the Ashmolean and Pitt Rivers museums in Oxford in Febuary”. 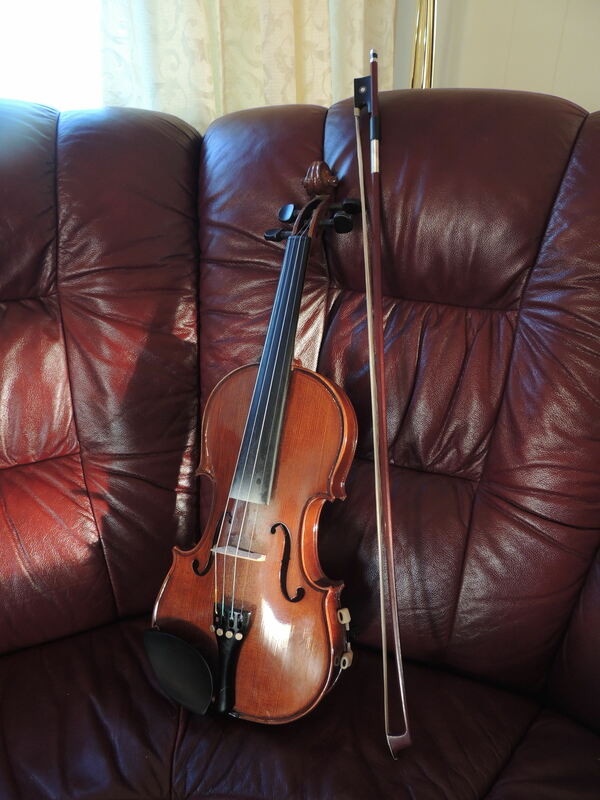 “We stayed with family in Reading where; my cousin Nina, let me try her violin; she said she hadn’t played it in over a year, and so, gave to me”. 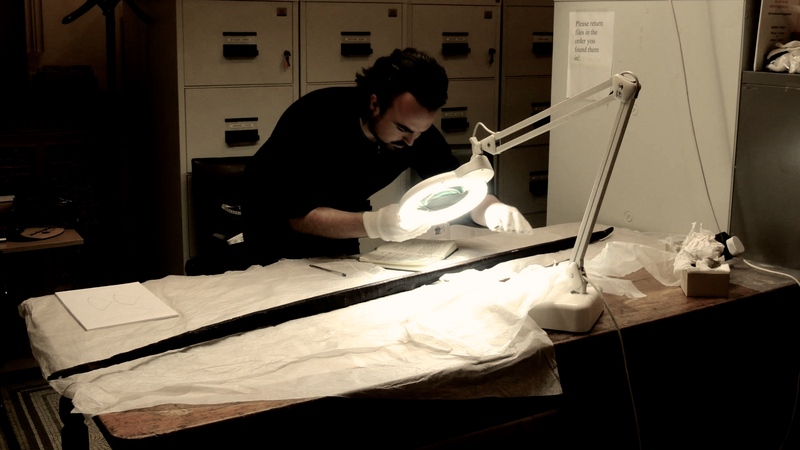 “I love it” I continued; “Maple body, ebony fretboard – you can still see the chisel marks on the headstock – There was a museum in Oxford had a few 18th century violins on display; it must be an amazing feeling to make one!”. “Have you thought about what we’re going to make this year?” he then asked. This, I was most looking forward too. 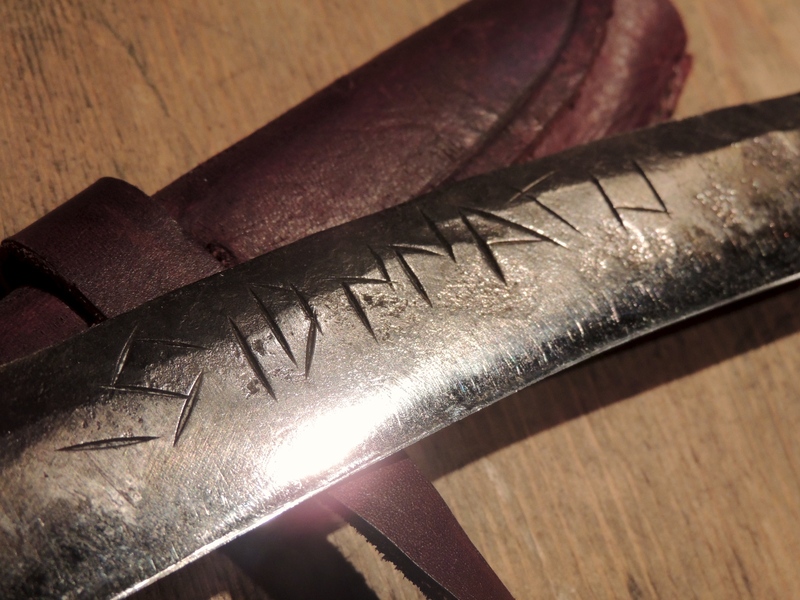 Several weeks last summer were spent in the smithy, forging a Norwegian Sami Knife. We never got it fully finished and burnt the steel a few times. But it got the ball rolling for a challenging tradition and the project this year was a good one. 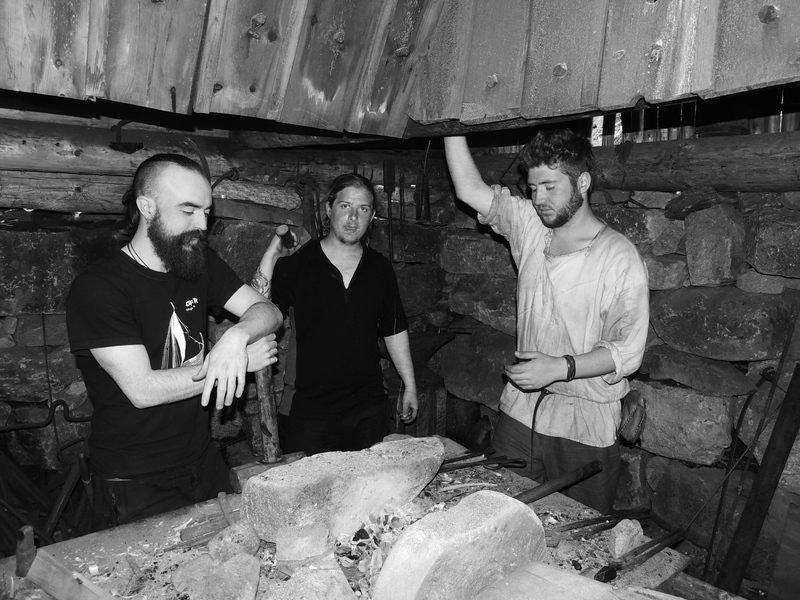 Espen, Brage and I, working away together in the Smithy. “Since I was small, I had always wanted to see a dinosaur skeleton,” I said, “So, while at the Museum, hoping to indulge my inner child, I stumbled upon an exhibition that was dedicated to the ‘First Peoples’ of Canada that had a wide collection of Native American objects; that’s when I saw these”, I said, turning the Macbook around; revealing a selection of 18th -19th Century Western Bowie knives. “You want to try to make one?” he said. “Do you think we can?”, I asked. “Well”, he answered, “We have the forge; I can’t think of a better place to try” he added with a grin. I saw Brage everyday during the rest of the summer and over the next few months, my empty hallway began gradually filling with shoes. 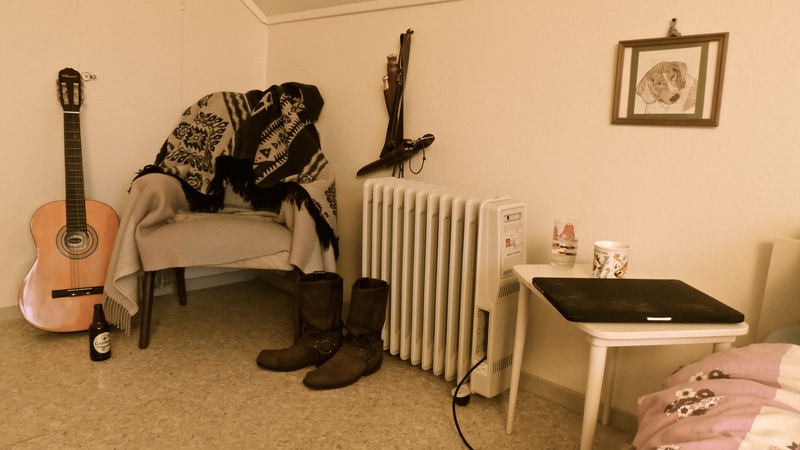 The tables and chairs of the little white house by the foot the museum began slowly accumulating jumpers and coats; while my toothbrush in the glass above the bathroom sink, one-by-one, gradually gained several new companions. The firewood by the burner eventually lost its use, while the windy rattle of the walls was replaced by the banter of housemates. It was 2:30 AM at my white chipboard writing-desk and the party downstairs was in full swing. I read the title of my proposal once more. In less than a year I had discovered whole a new direction and designed a whole new project; I wondered how many things would change again before the end. But first step was compete. I squinted at a sun that now rose from behind the mountain, filling my room with new light. 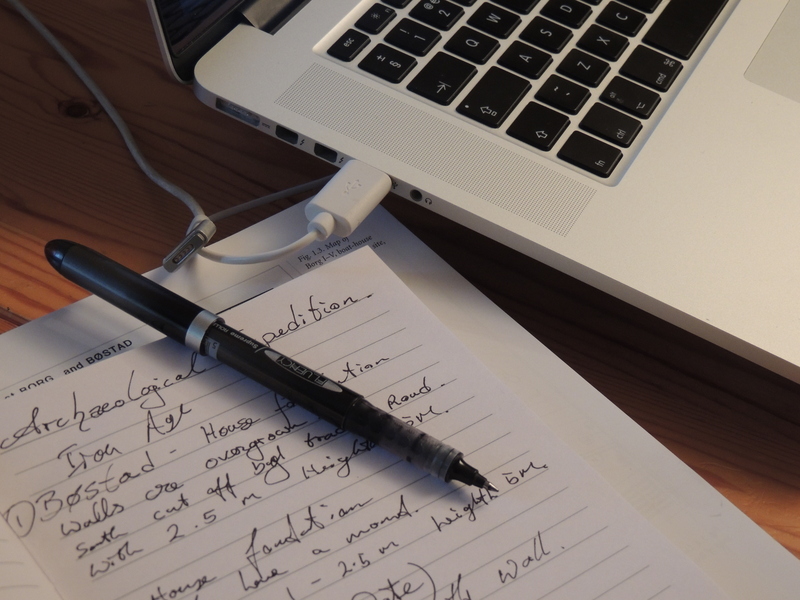 A new project – A new challenge. I attached the document to an email, addressed it to ‘UCD School of Archaeology’ and hit ‘send’. I wouldn’t hear back from them until mid August, but I had the whole summer to forget about it. In the meantime, I needed to fill our little white house with stories; like the time Stephen finally closed his bloody computer, came down and joined the party. 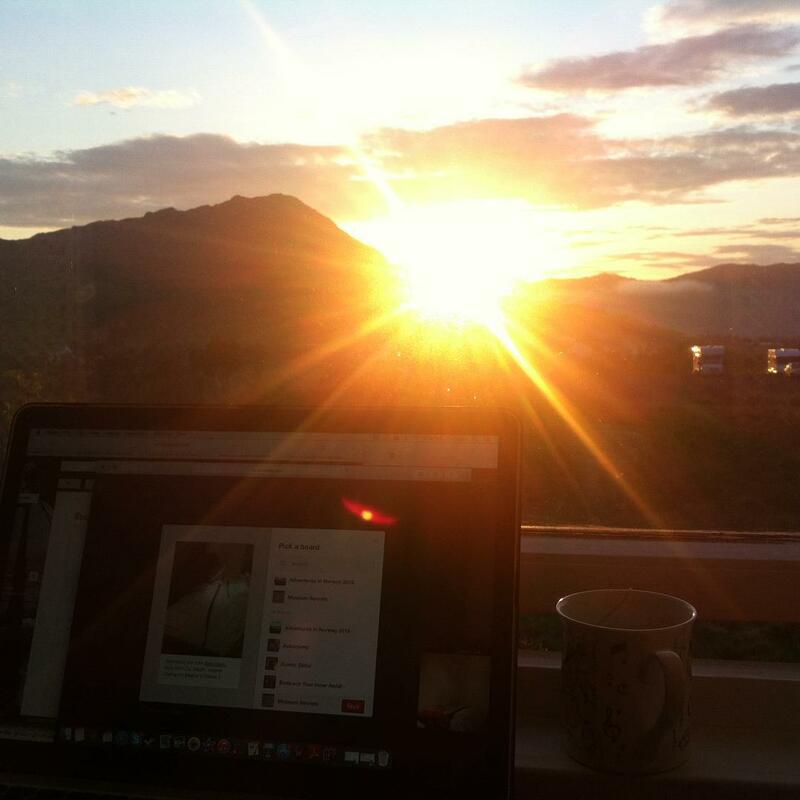 The midnight sun slowly creeps over the mountain outside my window, moments after I submit my proposal. I stood outside the barn and with both hands, pressed against its enormous red doors; the flakes of paint coming off and sticking to my fingers as I entered. 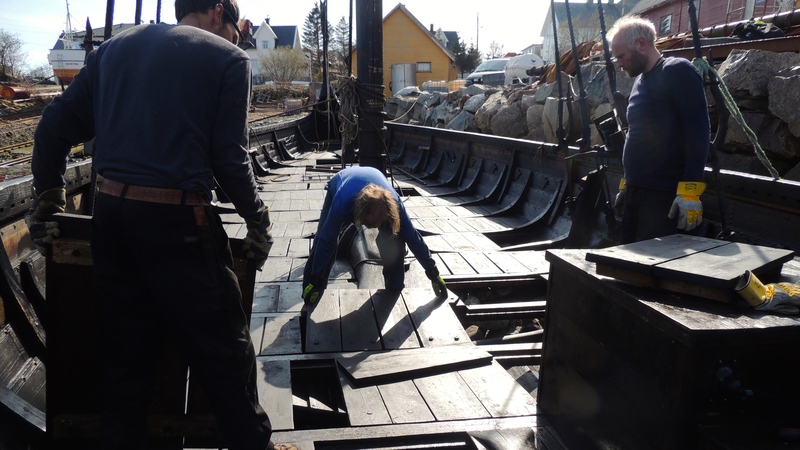 The bow staves we ordered the previous year had arrived the day before I left Lofoten, but I was assured that they were now safely tucked away somewhere in the barn; ‘somewhere’. I walked inside, but the year had made me forget how big it was. Filled in every corner of its wooden walls were the artefacts of a museum’s long history. Many tar stained ropes looked down at me as I stepped over a couple of old rowing oars. They were leaning against a crooked table that was neatly set with rusty tools, a half closed bucket of paint and a Coke bottle, oranged from the linseed oil. I spotted the shape of a large, straw archery target that stood out from the shadows in the back; tattered and beaten through from use. While the smell of the horses in the stable below, crept up through the cracks in the floorboards and mixed with the sweet musk of tar that filled the air. “I walked closer and saw, protruding from one end of the box, as though it was gasping for air, the yellow and amber glow of the Yew tree”. 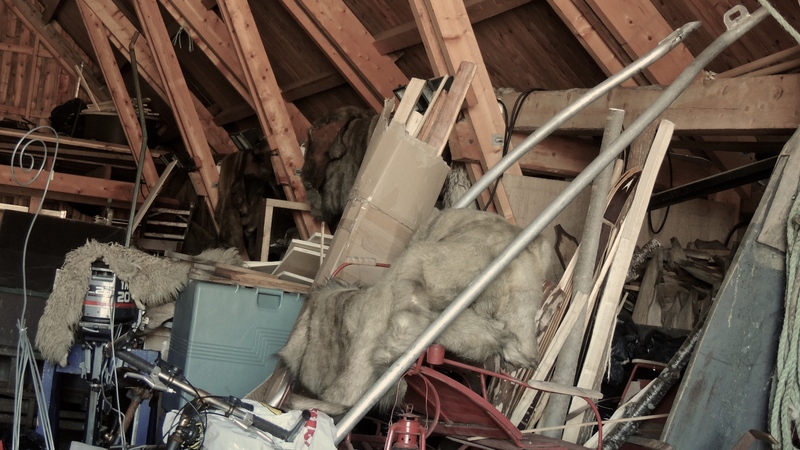 Amid these relics of activity, seemingly collected with as much love as those that are usually kept behind glass, I could see a long, brown box that was taped shut and wrapped in a pelt. I walked closer and saw, protruding from one end, as though it was gasping for air, the yellow and amber glow of the Yew tree. At length, I lugged my parcel back to the longhouse and threw it in the middle of the workshop. I knelt down, and making use of a small incision I made the year before, ran my knife along its corners; carefully, so as not to cut too deep. 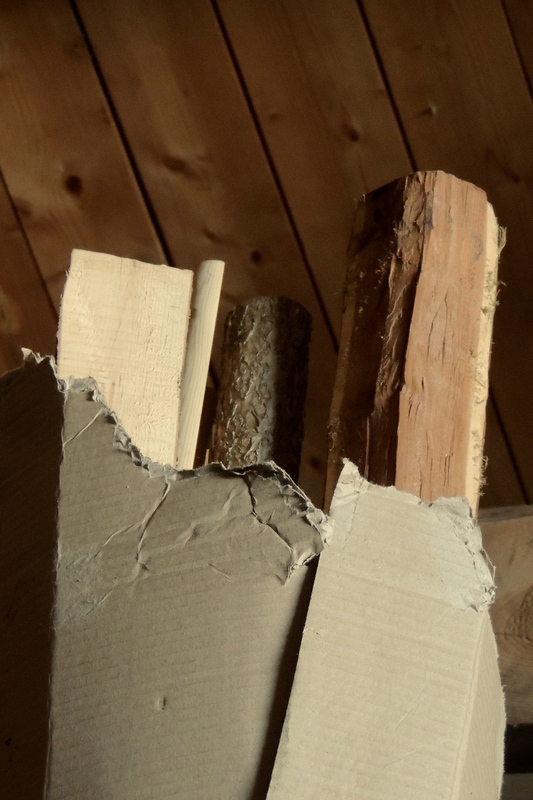 The box came apart to reveal a collection of sticks that only a bow-maker would appreciate. One such bow-maker, Daniel Talarud, had prepared this selection of staves for me. And scrolled on the ends of each limb, over a sealing of beeswax and white paint, were the names of each species in black ink: Hazel, Rowan, Ash, Hickory and, the two most important species of Viking Age archery: Yew and Elm. “Never before have I had the opportunity to work with so many different kinds of materials”. 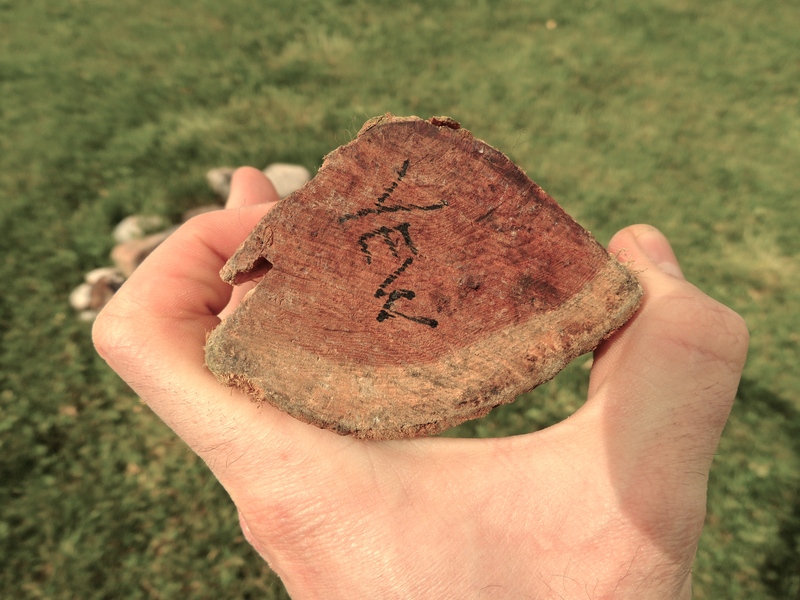 The grain of the Ash is straight, but not as tight as Yew. Never before have I had the opportunity to work with so many different kinds of materials. So too, do the public rarely get a chance to witness such a diverse use of woods in an ancient context. 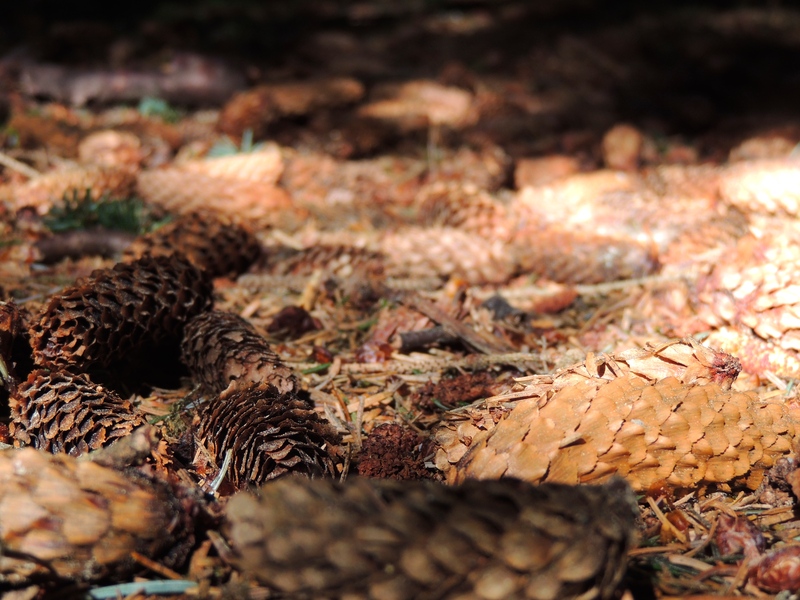 It comes as a surprise, that of the woods that were once such a common site in the past, many people today do not recognise their grains or have ever even seen beneath their bark. But for every hundred or so encounters like this, there are those few gems who spot them immediately. They are usually the older guys who grew up near some sort of lake or cabin in the woods; having worked in saw mills or travelled around in ships as carpenters. They even pick up some of my replica ‘Viking-Age’ tools and reminisce about using ones of a similar shape in their time. Having grown up in the city, I regret that I will never have the same traditional connection with the woods that they have. It certainly feels Ironic, dressing up like an ancient craftsman and talking about tools to men who are probably the last of the very line I am trying to reenact. 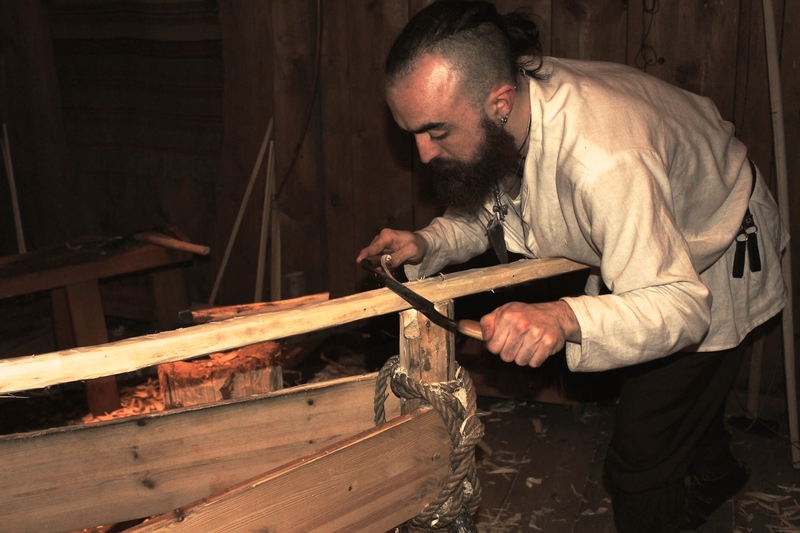 However, Experimental Archaeology certainly does allow us to see where their woodworking heritage once came from, and this is something they are proud to hear and fascinated by. Not only does my research allow me talk about the wood species of bows and arrows in the Viking-Age, through experience, I am able to discuss with them the craftsmanship behind bow-making; of the choices of shape and dimension; length and width; how they chose between different tools at each phase of production and how each bow-maker read the grain of the wood, shaped and bent the bow through feeling; acting through his muscle without measurements. 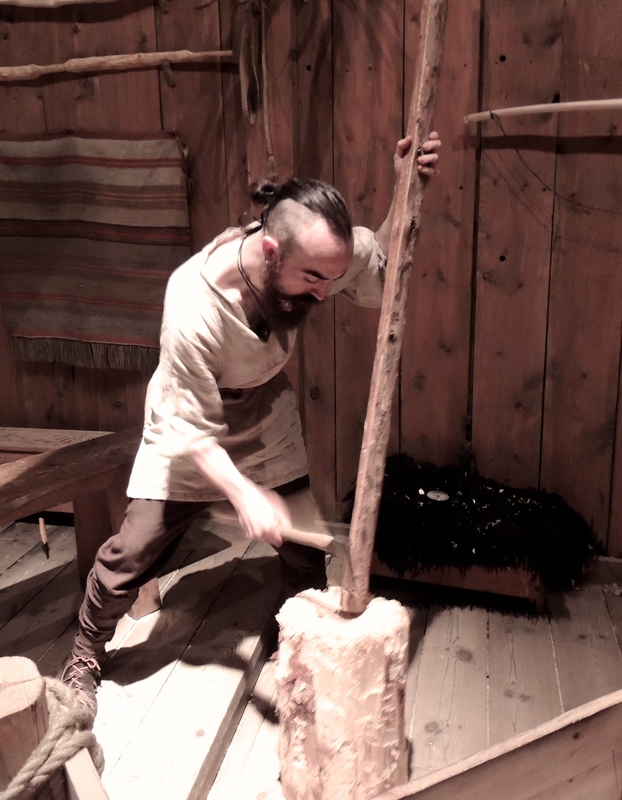 “However, Experimental Archaeology does allow us to see where their woodworking heritage once came from…”. My job is to talk about my craft, but more accurately, I aim to evoke a thought, that provokes a question. Though many are interested in the story of the bow, an equal number are just as interested in how I came to work here. A woman today asked me about my arrows. She was bouncing a small baby in a sling on her front, rushing my answer slightly, fearing the child may erupt at any moment. I offered her one of my arrows and she let go of her boys’ two feet to take it. As it moved past his face, the eyes of the child grew as wide as two golf balls, and just as the feathers were clenched and crushed between his little fingers, his mother pried it from his hands before it made a break for his mouth. “I’m sorry!” She said, handing it back. “That’s ok!” I laughed, running the fletchings through my hand, rejuvenating them. “I’m sure it’s not the first time in a thousand years a child has tried to destroy something nice in this house”. “But where did you learn to do all this?”, she asked, continuing to distract the baby with his own mitten. This story I actually have hidden, like an easter egg, in a corner of my workshop. Hanging on the wall behind me, I have an old and tattered textile. To all who pass it, it remains merely a rag of atmospheric decoration; but for those who ask the right questions; I walk over, pull back the textile and reveal what’s behind it. “…for those who ask the right questions: I walk over, pull back the textile and reveal what’s behind it”. 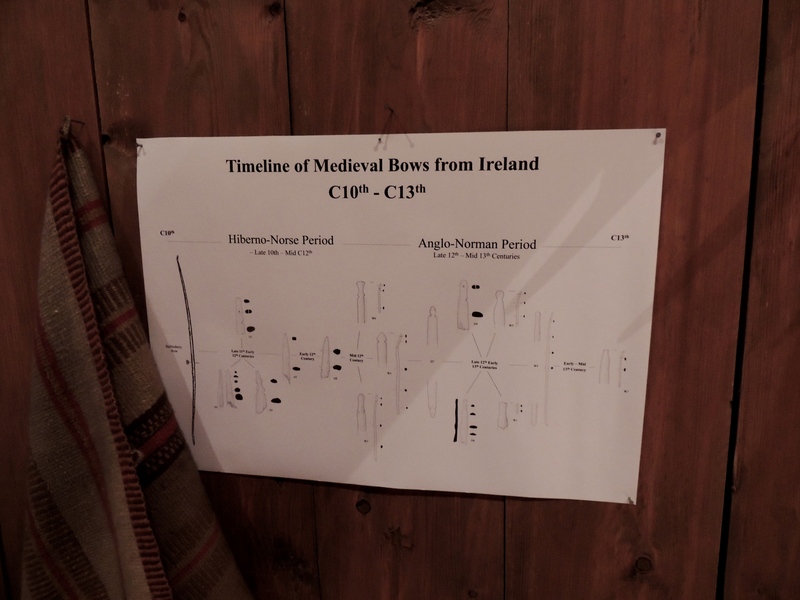 It is the poster that I submitted with my Master’s thesis; a time-line that shows all the bows we have excavated in Ireland, dating between the 10th and 13th centuries. When cities like Dublin and Waterford were, in their infancies, merely settlements of mud and wood, bows that were once half- worked and discarded after breaking, were simply cast aside and forgotten about. Some ended up in a rubbish heap or condemned to the fire. Others were reworked and used in the wattled walls of Early Medieval houses. 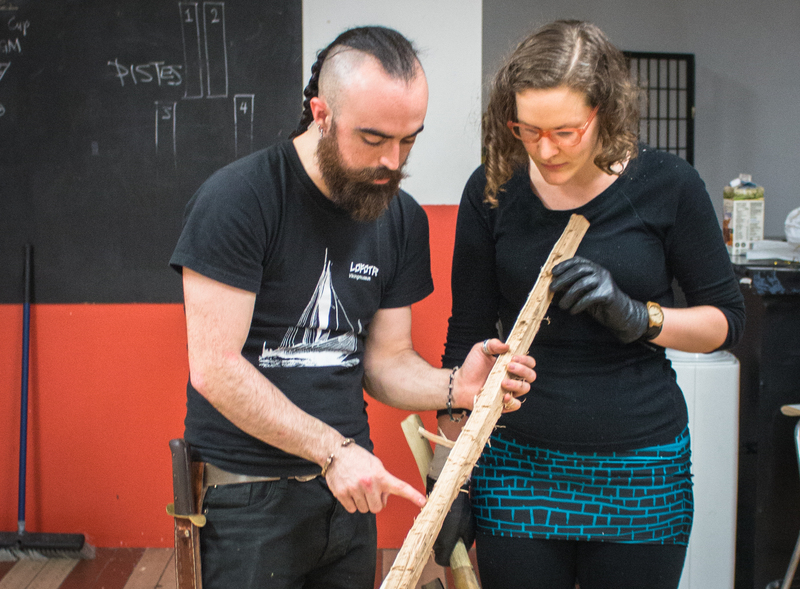 Examining the 10th Century Ballinderry Bow, at the National Museum of Ireland. I have studied them in detail, and by using the poster, each visitor can see for themselves my own thought process when piecing together the methods through which each of these fragments were made. However, there are many tricks and techniques that cannot be read from objects alone. I owe a lot of what I learned in the beginning to a very good friend of mine, Mikke Reinikainen. Nearly seven years ago, before I ever discovered archaeology, I met Mikke at a music festival in Northern Germany. He and a friend of his had set up a blacksmith’s forge in the Rathaus Square in Kiel, right outside the little Irish pub I was singing in; their hammers rhythmically ‘clinking’ along to the chorus of ‘Whiskey in the Jar’. During my break, I brought them each a cold pint of Guinness. He showed me his work, they came to our gig that evening and a friendship was forged. “He and a friend of his had set up a blacksmith’s forge… their hammers rhythmically ‘clinking’ along to the chorus of ‘Whiskey in the Jar”. Two years later, I completed my first bow; an eyesore that in my excitement, I just couldn’t resist posting on Facebook. 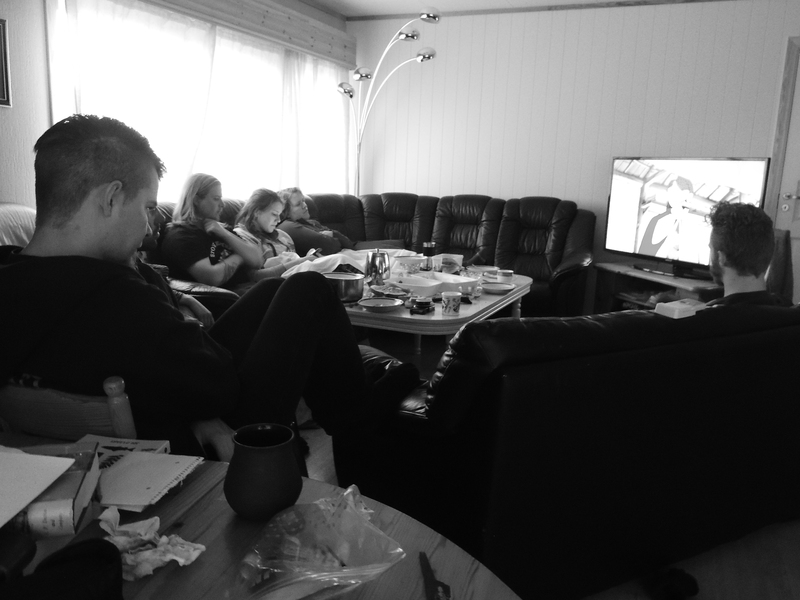 ‘Bwa-doop!’, an instant message came from Mikke. “Why didn’t you say you were making bows? !” he asked. “Yes, but I’ve been making bows for years!!!”. Later that year the deadline for my thesis was looming. The yew trees I cut had been drying in the sun that beat down relentlessly over Dublin that summer. I was standing in my garden with my tools placed around me, while my dog lay by my feet, rolling in a slowly growing pile of wood shavings. 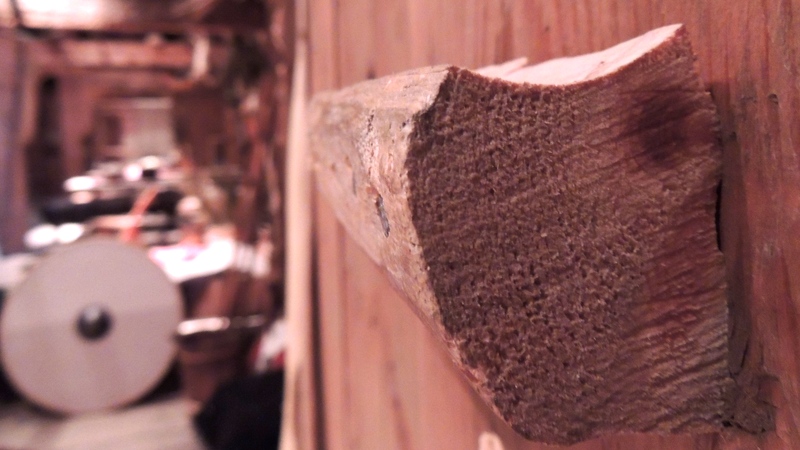 A yew bow was on the wall. In my right hand, was the rope of the tiller, and in my left, was Mikke, peering through the screen of my laptop, examining my bow as I bent it carefully back and forth. It was the first time I experienced why, as early as bows were being carved with stone, prehistoric people have been making their bows from yew. A yew tree can live for many hundreds of years. Because it grows at such a slow rate, the grain is incredibly tight. It can also get very straight if it has gown in the shadows, partially starved of sunlight. 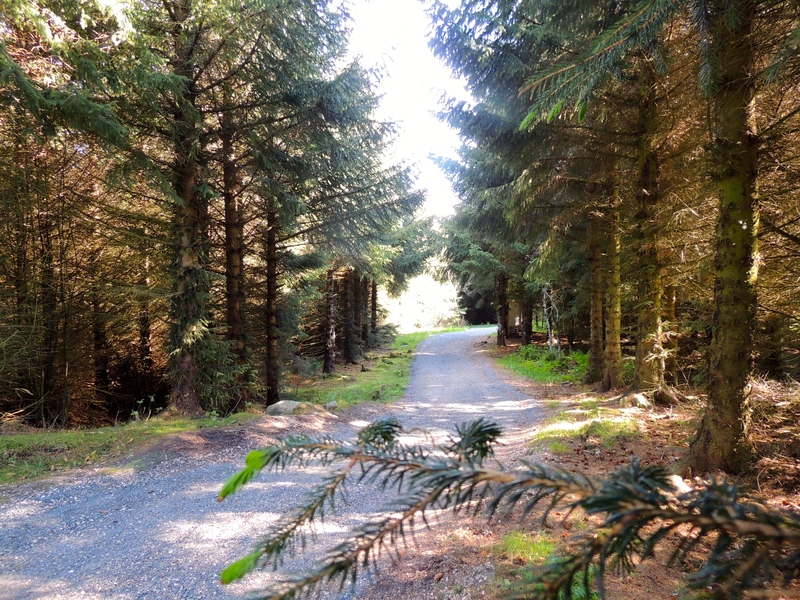 Unlike other younger and carefree woods, who’s branches grow about in every direction, the yew doesn’t waste any time. It can’t afford to. So it grows straight up, saving its branches for the sunlight. And if another fool hearted species gets in its way, it turns at a right angle, bypasses it and continues again on its original route. 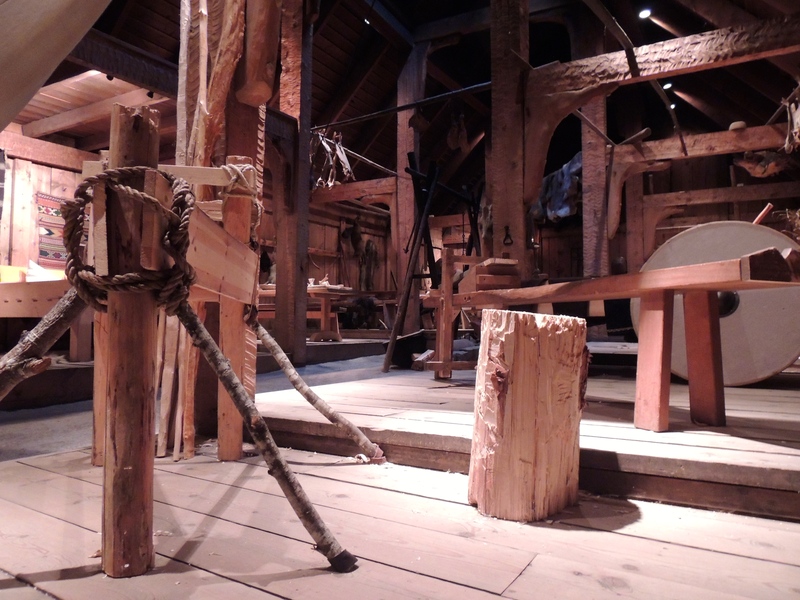 “…as early as bows were being carved with stone, prehistoric people have been making their bows from yew”. 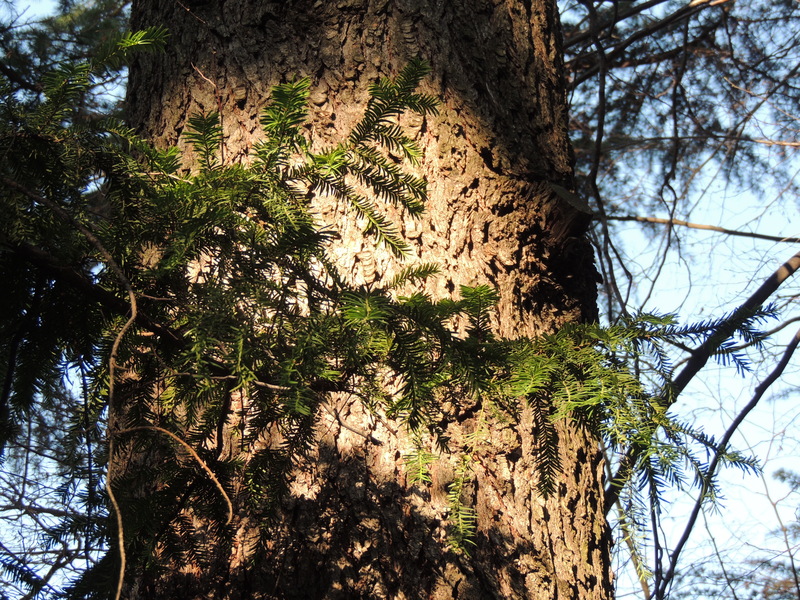 Close up of Italian Yew, taken in the mountains near Bolzano, Northern Italy. Some become so tall, I often need to use a monocular to identify its pins. When the yew is split, you can see two colours: a pink inner heartwood that turns to amber when it dries, and a lighter, more supple sapwood that rests just beneath the bark. This inner heartwood becomes dense and strong, while the outer sapwood remains flexible. 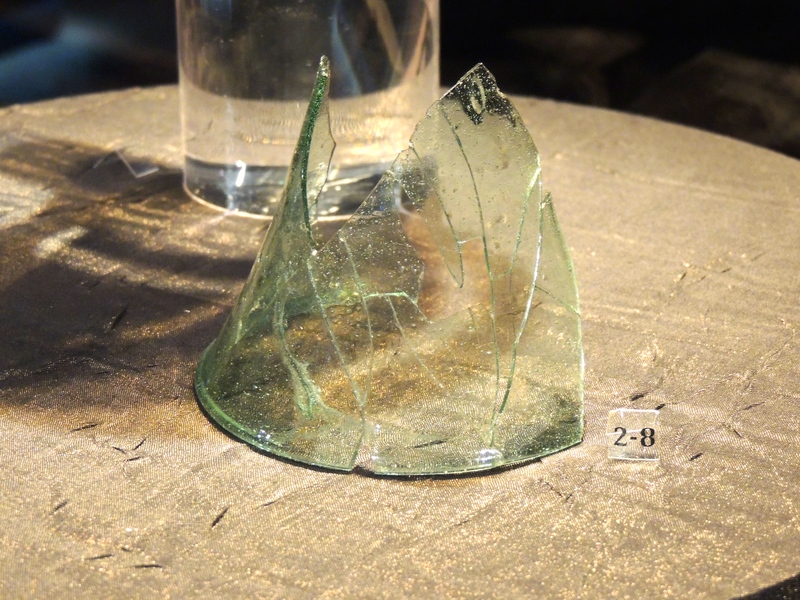 When you look at each of the Viking bow fragments from Ireland under a magnifying glass, you can see the dividing line between these two natural layers. 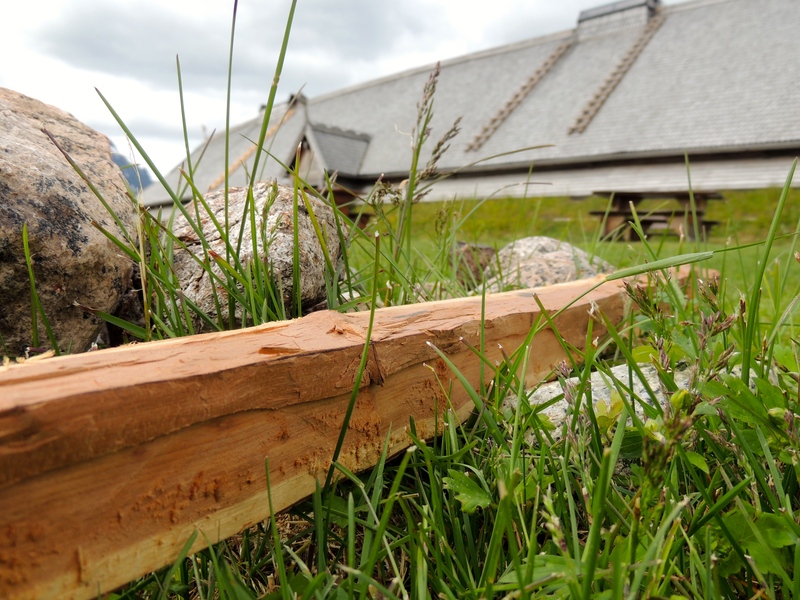 By the early Iron-Age, people in Northern Europe had learned to combine both of these natural laminating qualities, making their yew bows both strong, and flexible. Detail of where the bow sits in the yew tree; the sapwood in the back of the bow, the heartwood in the belly. 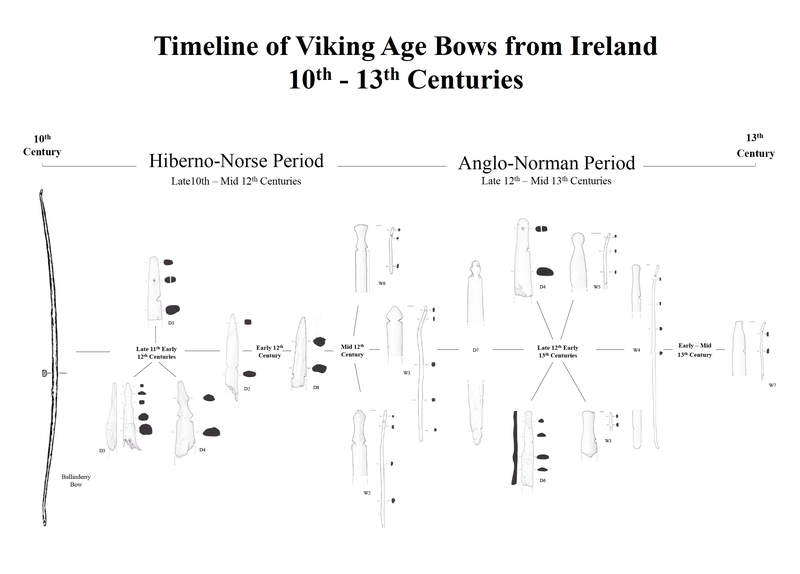 It’s no surprise then, why ninety percent of the bow fragments we have from the Viking Age are of Yew (Halpin 1997; Halpin 2008, Henken 1935-7). 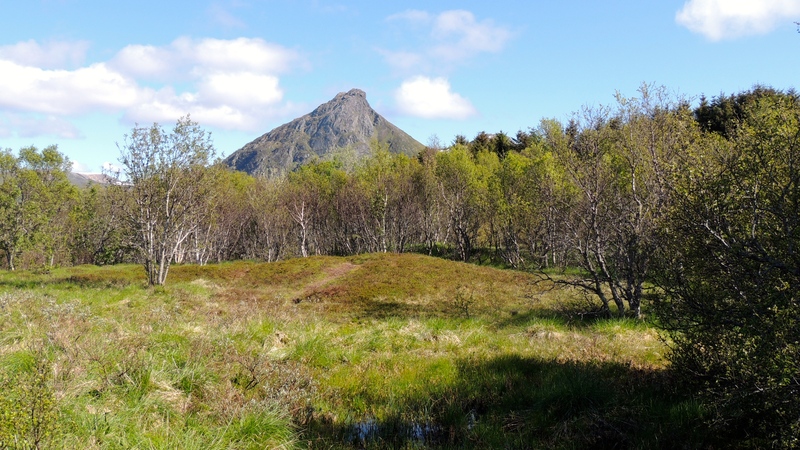 But such trees today are rare and even nonexistent in places like Lofoten, the common woods here being Birch, Willow and Rowan; with exception to the American pines that were introduced in the 1950’s. 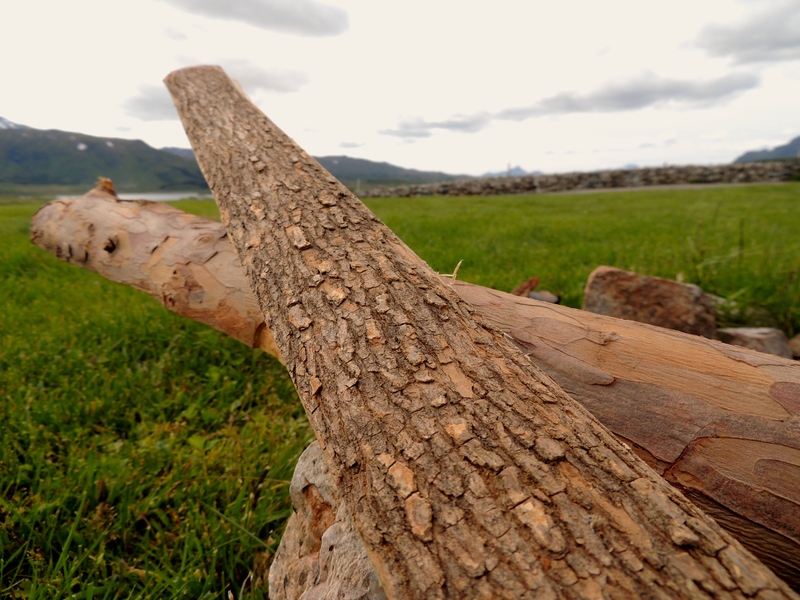 On one archery forum, a fellow bow-maker referred to me as working in the ‘Barren Lands’ of Norway. 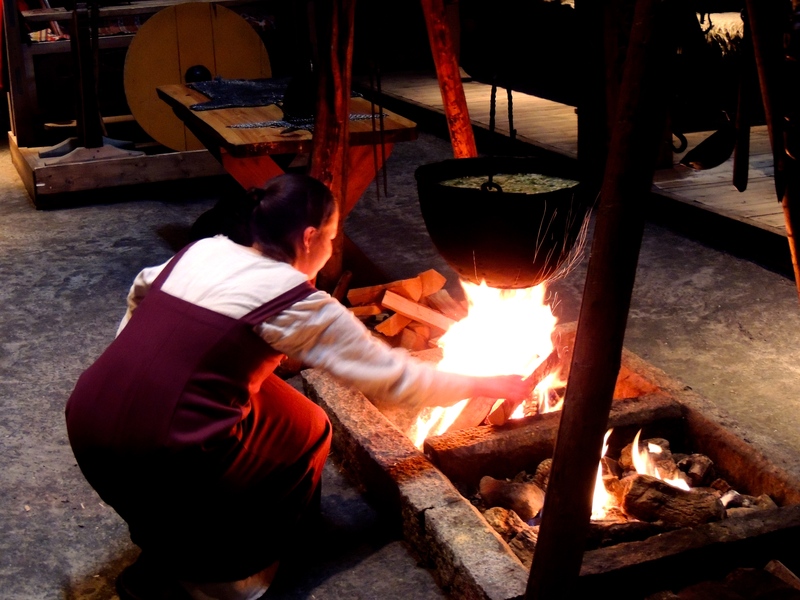 Environmental analysis of the hearths in the Chieftain’s Longhouse at Borg I, tells us that it was not much different here in the Viking Age than today, with charcoal remains identified as mostly birch and willow (Hansonn 2003). This perhaps explains why in over 400 years of settlement, only one arrowhead was ever found in the Chieftain’s Longhouse, in Borg I. Compare this to the hundreds of Viking arrowheads uncovered during the excavations of Waterford and Dublin (Halpin 1997), and you begin to wonder about the bow the Borg Arrow was made for. Below: A burial mound near Borg I, the birch and Willow grow wildly around it. 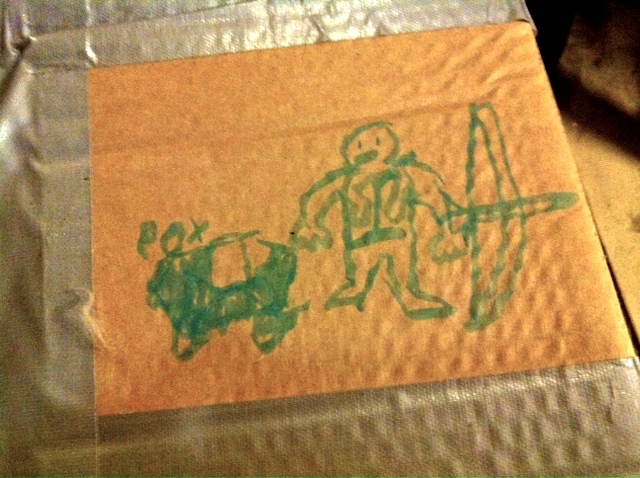 My things were not so well hidden to Pedar, the son of Terje Boe; who tagged my box for me while I was gone. 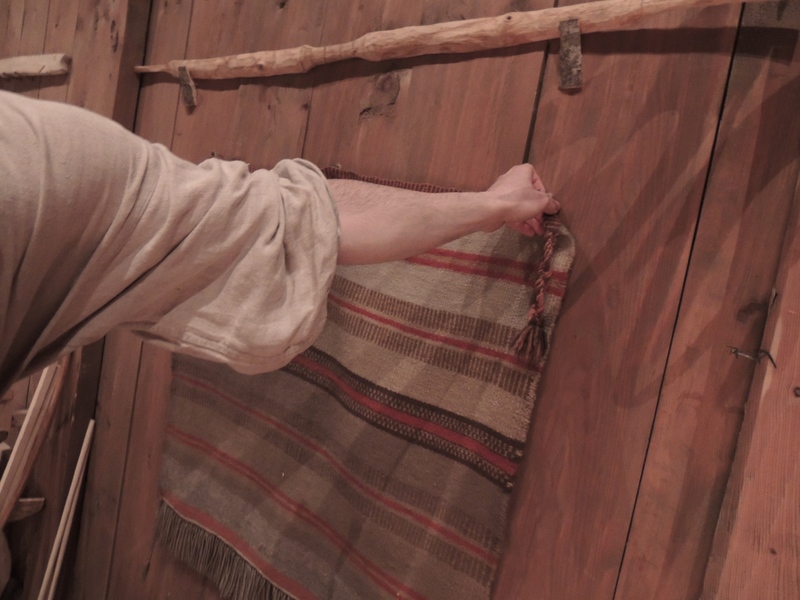 Standing in the reconstructed living quarter near the place where that arrowhead was found, I leaned my modern Yew and Elm staves against the wall. I then placed a couple of Ash and Hazel staves beneath one of the beds and went to see about my tools, which for a year, I had left hidden around different parts of the longhouse; archaeologists find medieval ‘hoards’ for a reason! I took a box from the upper section in the roof and another I had stashed in the walls of the house. 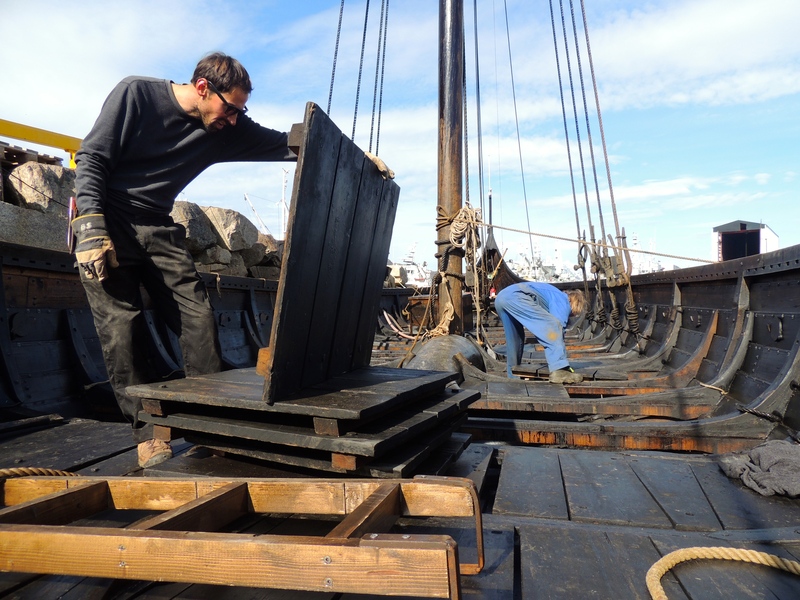 “Together in these boxes were the pieces of the first blacksmith who worked here over twenty years ago; a handful of beautifully forged replica Iron-Age tools”. Together in these boxes, were the creations of the first blacksmith who worked here over twenty years ago; a handful of beautifully forged replica Iron-Age tools. Out of those they have on display, I use the ones he copied from the Mastemyr tool chest, a rare and valuable hoard of woodworking and blacksmithing tools that were found in a bog in Gotland, Sweden. At eye level, three axes now hang under a shelf of pots filled with feathers and bowls of beeswax. Next to the axes, there is a brutal looking saw, affectionately known around the house as ‘Bear’, for the ‘whooshing’ growl it makes when it bites into the wood. Every knot is a near weak point and every splinter is a potential fracture. “Make sure the back of that bow is as smooth as a baby’s @*$#!! !”, I hear Mikke saying, constantly in the back of my mind. To do this we use a file, a useful tool in a world that has no place for sandpaper. 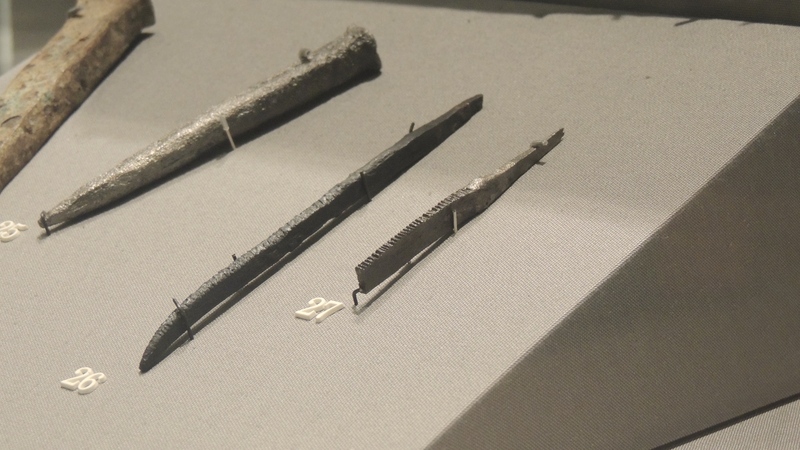 They too are copies from the Gotland tool chest, but they are almost identical to those on display in the National Museum in Ireland. The older tools feel different to the ones I am used to today. But after a while you figure out how to use them more efficiently. 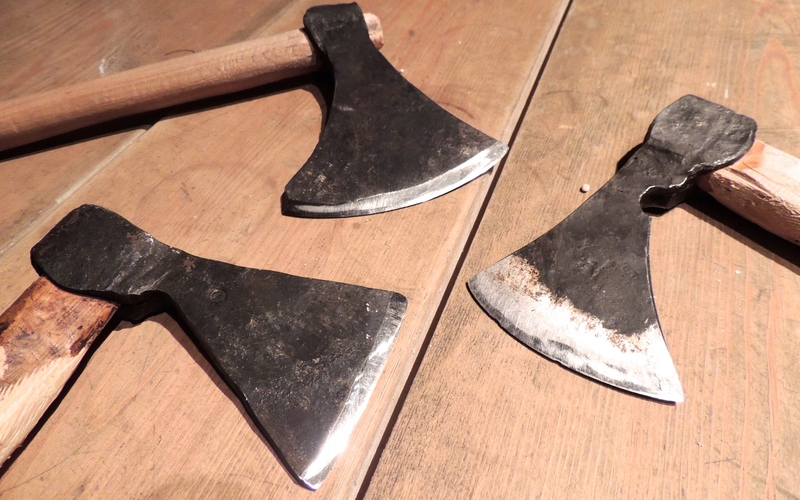 Woodworking hand axes today are made from a high carbon steel, they hold an edge longer, but they are really heavy to compensate for the fragility of high amounts of carbon. 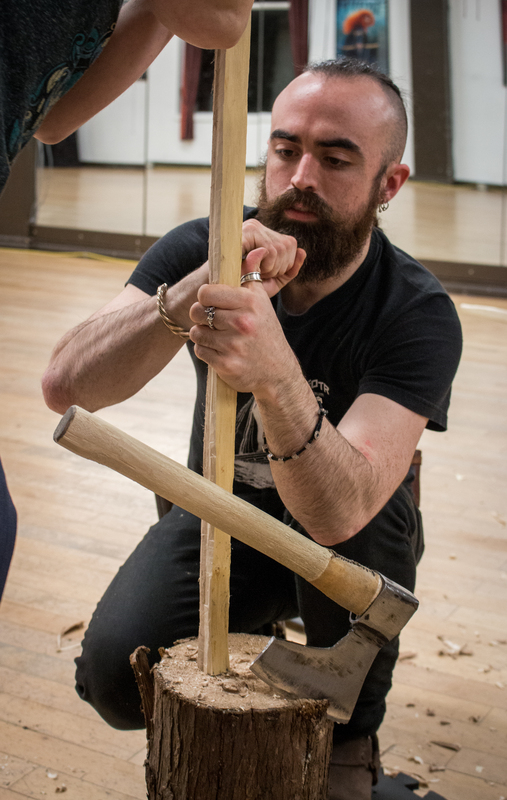 These axes are thinner and lighter, and rather than bringing the axe down over my head repeatedly, with a flick of the wrist with these, I can chop for hours without feeling that strain my forearm is so used to. Of all the tools I get to play with here, there is one I treasure the most. 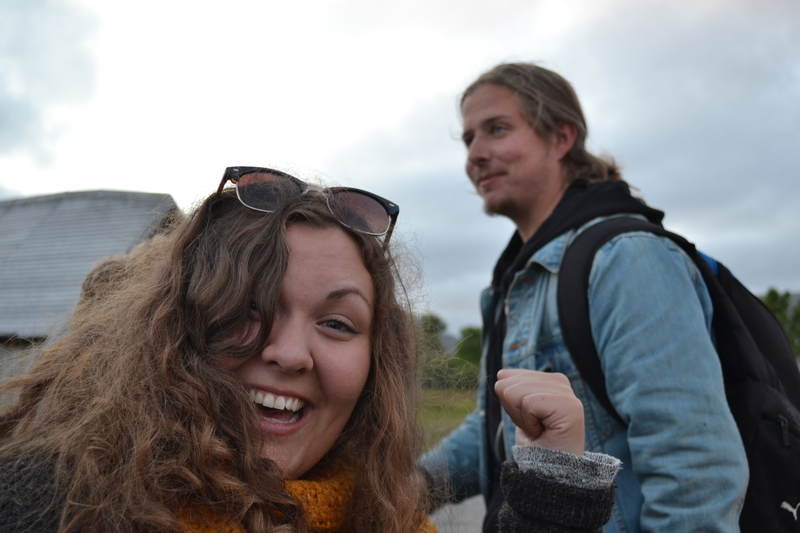 It was during my first month working at the Lofotr Viking Museum that received a text from the main office, to go down and collect a package that was addressed to me. 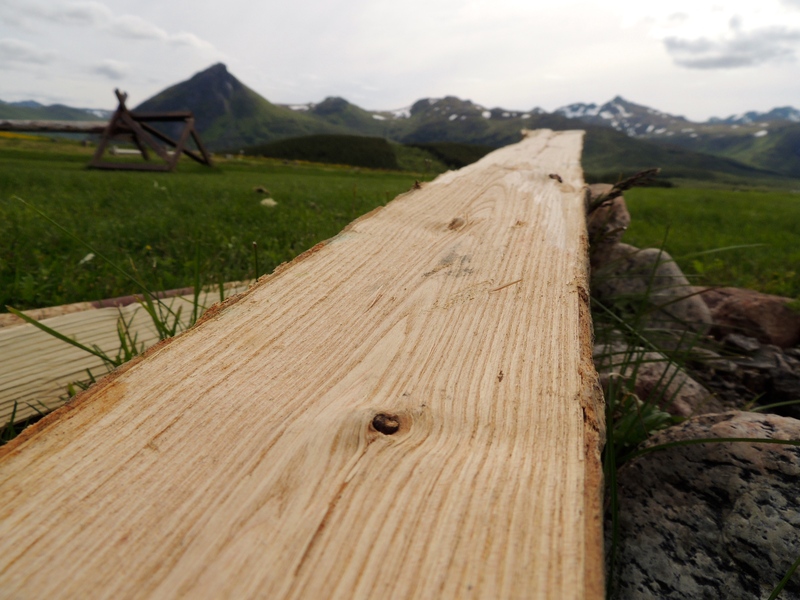 As I entered the white wooden building at the administration, Gauta, one of the younger Norwegian porters, was on his way out with a long, cardboard parcel under his arm; a sharp piece of steel jutting out the end. “Be careful of that!”, he said laughing as he handed it to me, “It looks like a nail or something!”. But I knew what it was. 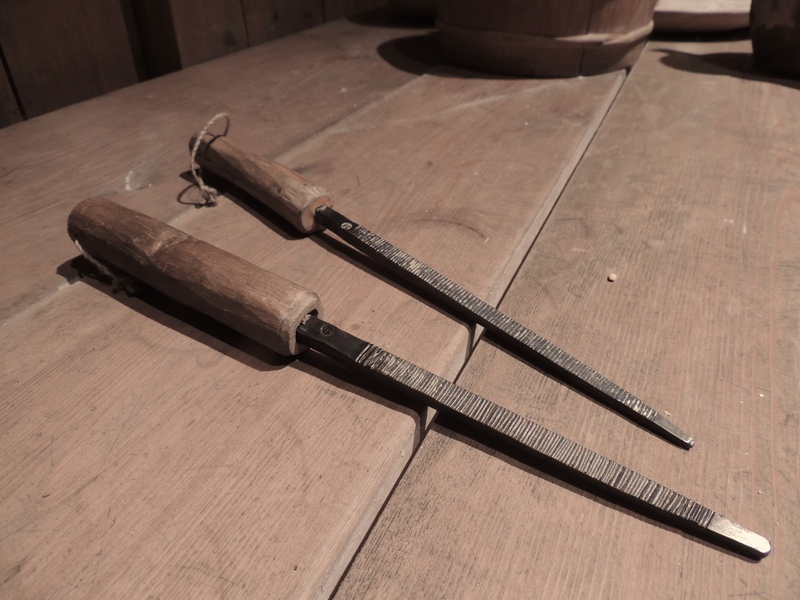 I carefully opened the parcel and inside I saw three beautifully fletched medieval arrows, and resting on top of them, was my own custom made, bow-maker’s draw knife; hand forged by Mikke. 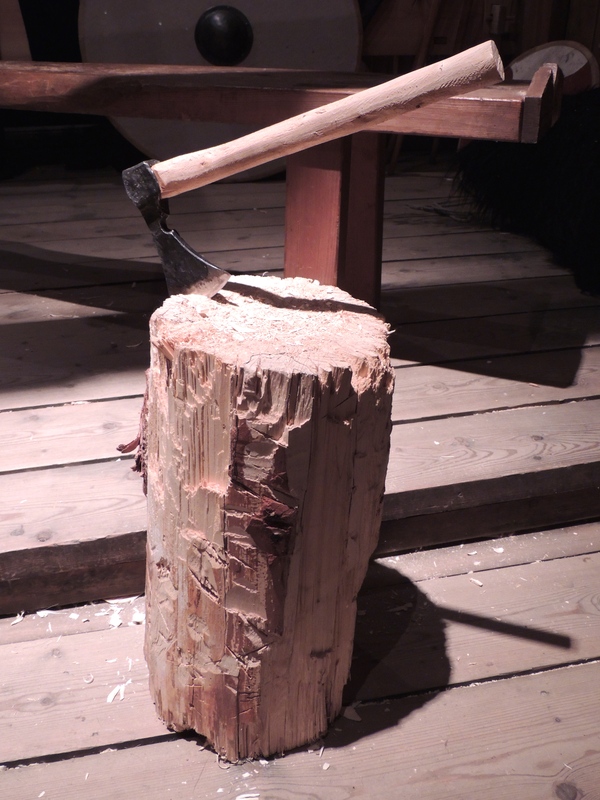 In awe at how light it was, when I held it felt like my drawknife. Then I laughed when I noticed he made the handles out of Yew. It almost glowed as I removed it from its wine-red, leather cover. Then I noticed a detail that really brought a smile to my face. So I picked up the parcel, headed back to the longhouse and I began carving a bow. Halpin, A. (1997) ‘Military Archery in Medieval Ireland: Archaeology and History’. In: Europe. Brugge. Conference 11. Halpin, A. (2008) Weapons and Warfare in Viking and Medieval Dublin. Dublin: National Museum of Ireland. 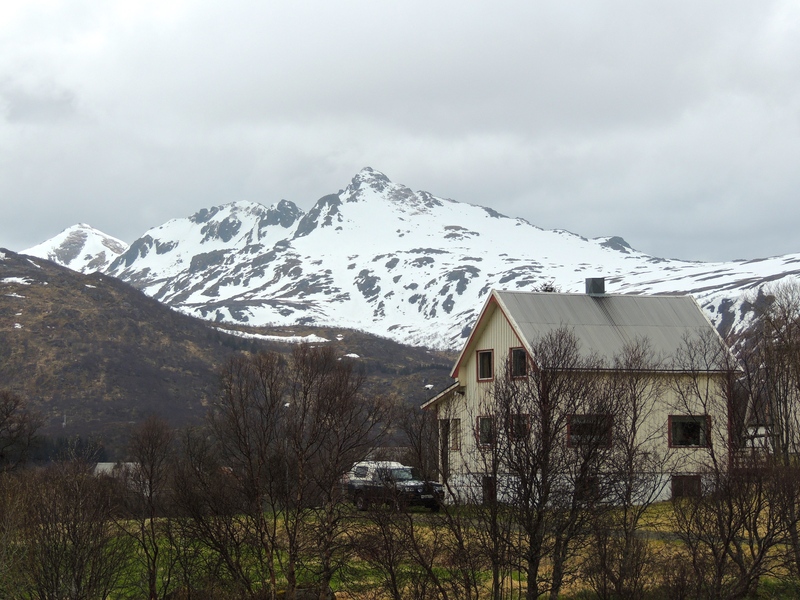 Hansonn, A. M. (2003) ‘Plant Remains from Borg I: 1’ In: Munch, G. S., Johanson, O. S. and Roesdahl, E. (eds) (2008) Borg in Lofoten: A Chieftains’s Farm in North Norway. Trondheim: Tapir Academic Press. Henken, M. (1935-7) ‘Ballinderry Crannog No. 1’. Proceedings of the Royal Irish Academy. “I think we gotta go”, Tom said, taking my camera as I climbed back down an old stone wall, feeling blindly for any gaps with my feet. “Are they leaving?” I asked. “Yeah I think they’re already in the car” he said. He placed my camera in its carrier bag and handed it back to me after I’de jumped down. 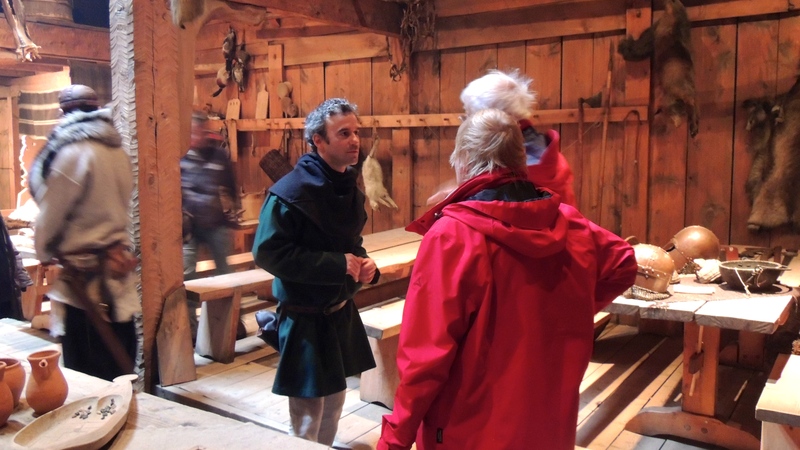 Tom and I worked together in the longhouse. He’s really handy with leather; belts, bags, shoes and those sorts of things. And, when he’s not melting a hot pot of beeswax over the fire he occasionally guides Dutch groups through the longhouse. We’ve spent most of our workdays so far dressed in the garments of a less modern age; myself, in an outfit of brown and white linens and Tom, in a blue shirt and a pair of red and green-striped linen pants; the bright red sash around his waist giving him the slightest look of a pirate. Right now though, all of us walked out of the truck and blended in with the other tourists so perfectly that we felt like just another group of sun-hunters, standing and shivering a bit at the shore of Eggum. Those who brought camper vans filled the car-park with collapsable tables and chairs while others in tents, wrapped themselves in blankets and drank beer and hot coffee while they waited. 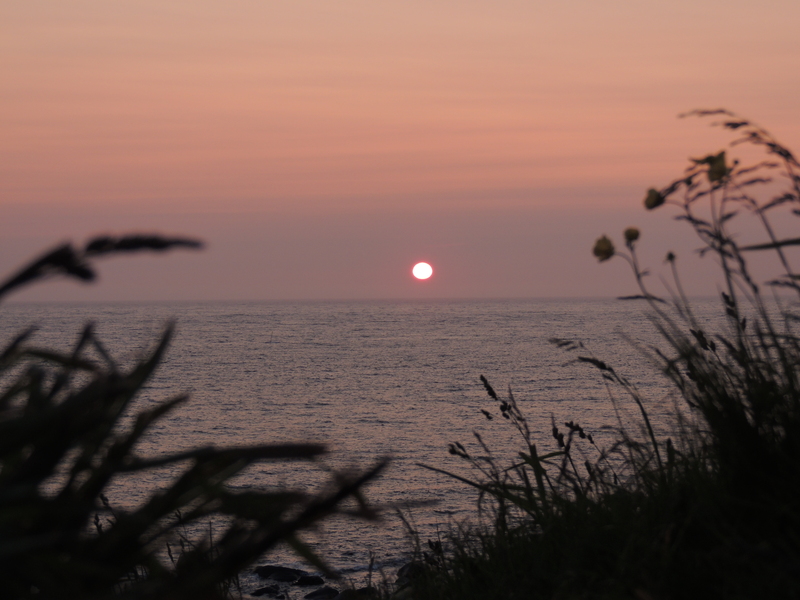 If you’ve ever had the pleasure of seeing a sunset, or woken early enough to catch it as it rises, then you will understand the meaning of a ‘fleeting moment’. But where the twilight lasts only a few seconds in most places, the sun here reaches its lowest point at around 1:00 am; suspended in an orange glow for about an hour, only then to go right back up again. We had planned on hiking to the top of a nearby mountain, simply for an epic vantage point. 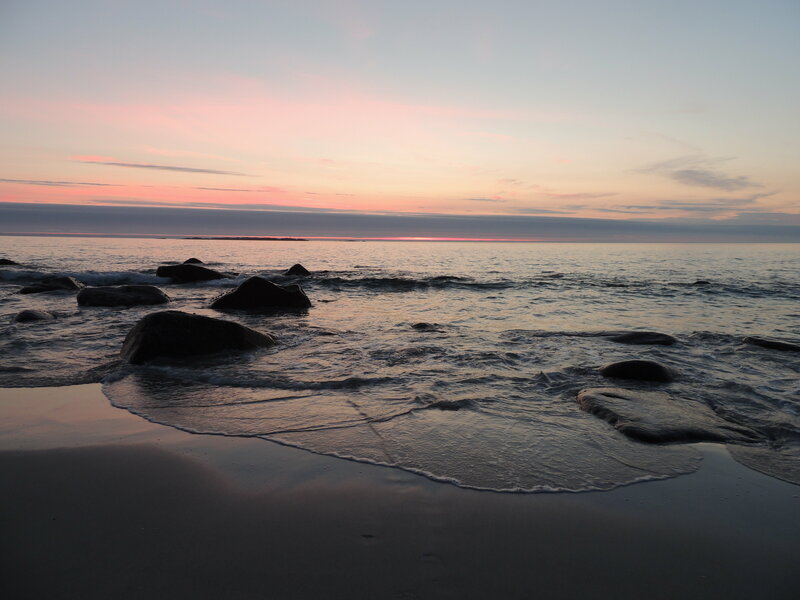 But with the weeklong forecast of clouds and the sun’s final days approaching, my housemates and I took our chances and finally drove to Eggum, an old fishing village just North of Borg. 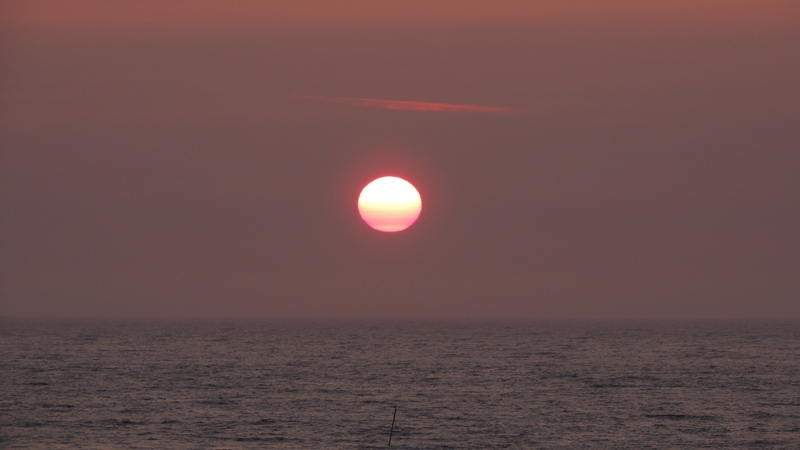 I had only one other memory of the midnight-sun. 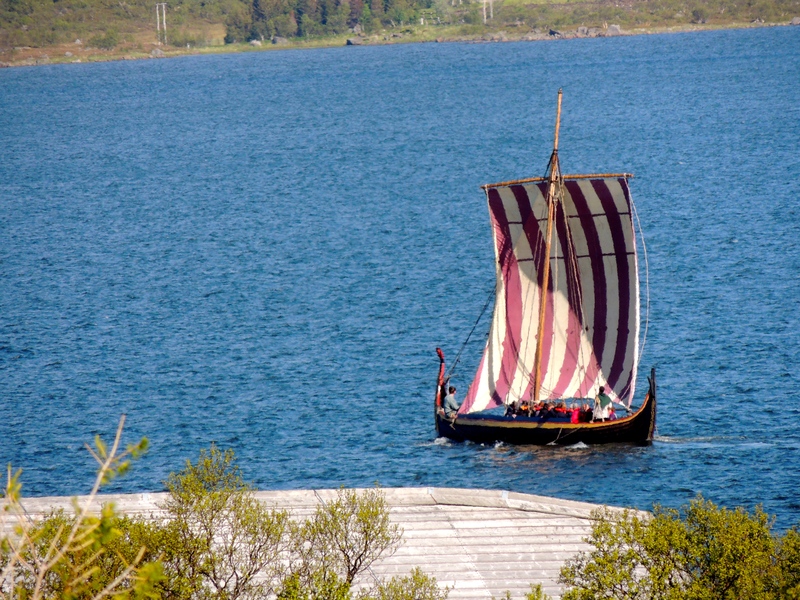 It was from my last summer when Terje Boe, the skipper of the museum’s replica Viking ship had organised a crew of around thirteen sailors, including me, to take part in a regatta. The evening before the race, we anchored outside the harbour of Nordskott. We turned our sail into a tent, lay sleeping bags out on the deck and I fell asleep to the sounds of the water; ‘gluck’, ‘gluck’, ‘gluck’, slapping against the belly of the ship beneath our heads. Right before drifting off, I noticed the glow of a slow, dipping sun, bouncing a light show of bright and orange ripples from the water’s surface up onto the underneath of our sail. “But the sun that night was nothing like this”. 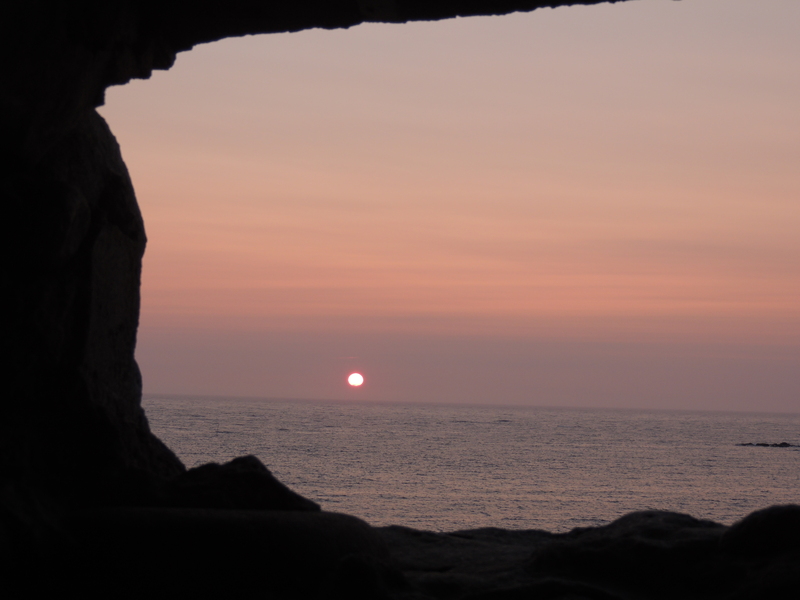 I handed Tom my camera, and before making my way back down the inside of the stone tower, I took one last look up, wondering when I’de ever see it like this again; our grand disk of copper; wobbling over the ocean like a bright, round mango. 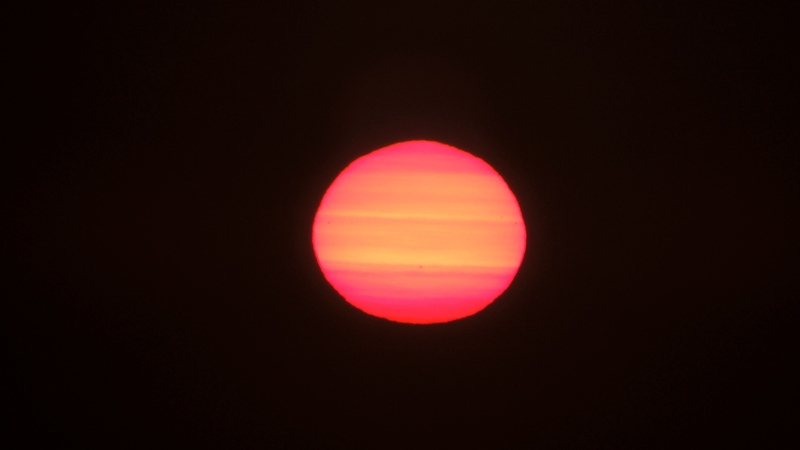 The midnight sun at Eggum, a sunspot forms at its centre; ready to erupt in a flare. 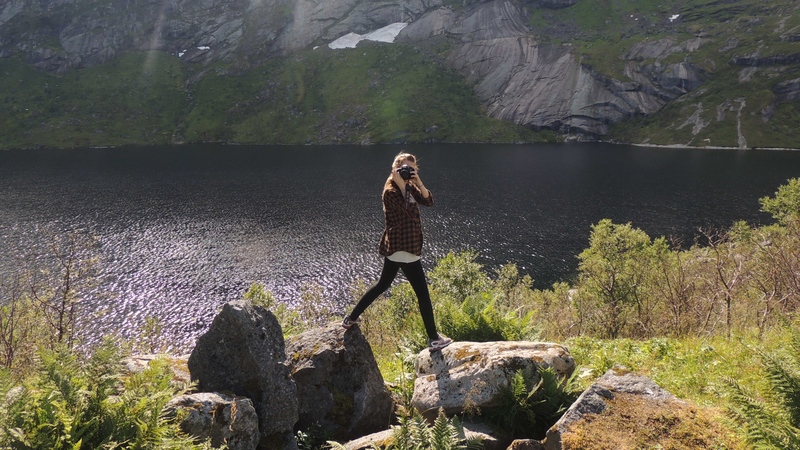 If you enjoyed reading this post then please ‘Follow’ my blog on wordpress or by adding your email at the bottom of the homepage, and read more about my summer adventures in Lofoten, Northern Norway. 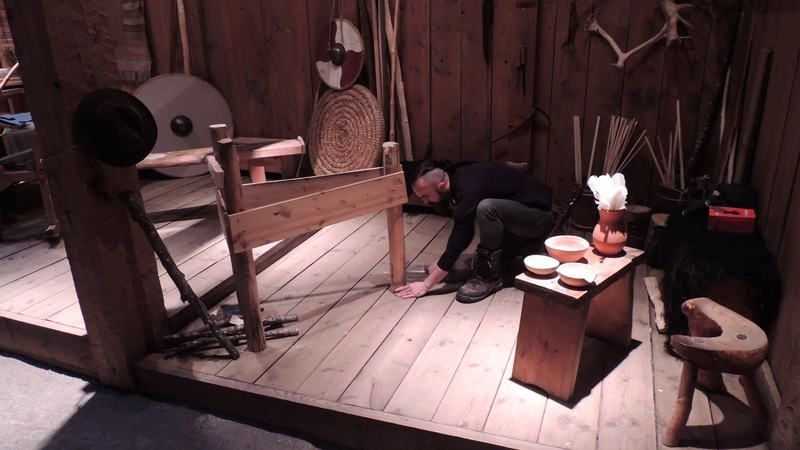 The Lofotr Viking Museum’s conservator and I stood back and inspected the new bow-making station; an assortment of wooden benches and iron tools displayed in the far corner of a long and wide room at the farthest end of chieftains’s longhouse. “Do you think it will hold?” he asked as I drove my last nail through the leg of a workbench and into the wooden floor. “Should do”, I said, giving it a sturdy wiggle. “Good, because its staying there,” he said with a grin; “indefinitely”. Not a year has passed since that conversation and already my entire workshop is being moved, along with all its fixtures, to the entire opposite end of the Chieftain’s Longhouse; to the room where an excavation in the 1980’s revealed around a large deposit of charcoal, several signs of domestic work, cooking, eating and sleeping; to the room we call the ‘Living Quarter’. Change is often inevitable. With every new season, there comes an invasion of new interns and employees, and with them, a wave of new ideas and skills. One girl in particular this year; a french student of Museology, is constructing in 360 degrees, a celebration of Viking Age sailing in oil on canvas. On my first day she approached me and asked quite apologetically, if I would be so kind as to, well; “Move?”, she said, “I’m really sorry”, she continued; “But i’de like to start as soon as possible”. “No, that’s fantastic!” I returned, “It makes much more sense to be in the living quarter, that’s where all the activity is; where it all was too, by all accounts”. And so with a wrench and twist of a hammer, the final nail that sealed my last workshop became the first to go. Nailing the shave-brake to the ground. 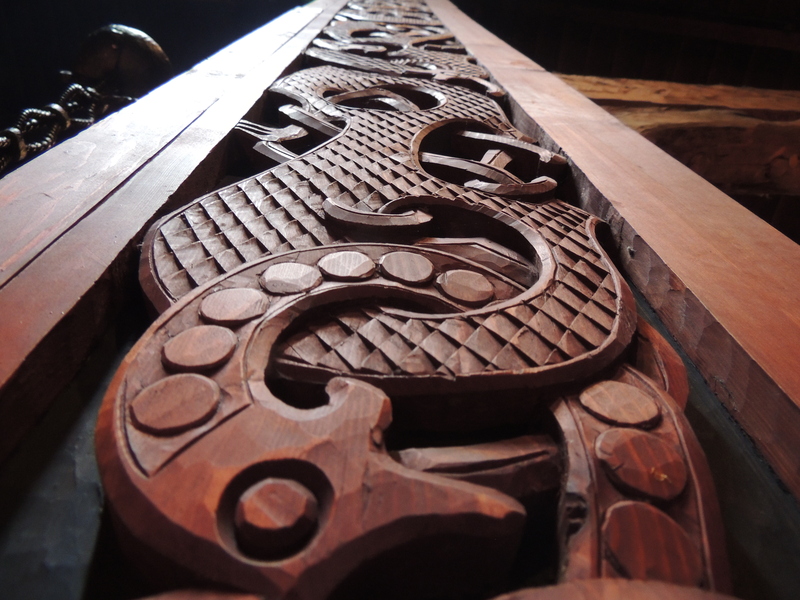 Detail of the carved pillars in the ‘Feast Hall’ inspired by the carvings on the Oseberg ship. And so with a wrench and twist of a hammer, the final nail that sealed my last workshop became the first to go. I first carried my chopping-block from the back of the house through the feast-hall; a splendid room lined with tables and chairs for banquets. Ornately carved pillars support the roof with almost the splendour of a cathedral, while an open hearth burns away at the centre of the hall; an iron cauldron of stew swings above it; blackened and bubbling. Leaving the feast hall, I came to the door of the Living Room, and with a foot, opened it with a long and crawling creak, revealing from the smokey shadow, a wide and dark room; the contents of which, either living or material, all appear to revolve around yet another central hearth and fire. The living Quarter is somewhat darker than the other rooms and even with the aid of some artificial light, the glow of the fire still illuminates with a flicker, the faces of anything that stands in its line of light. 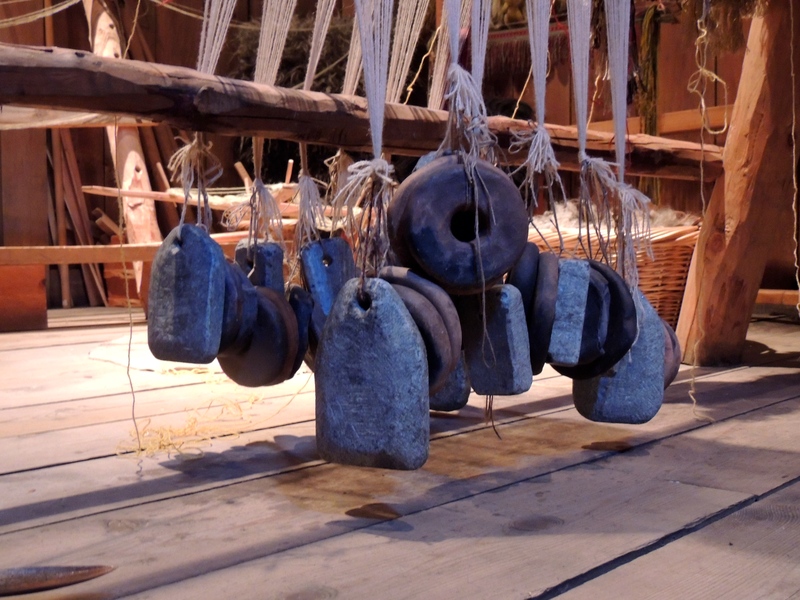 To both sides of the room there are laid out some everyday objects; what one may find in a such a house; some baskets of dyed wool and string, loom-swords, spinning weights and spindle whirls. 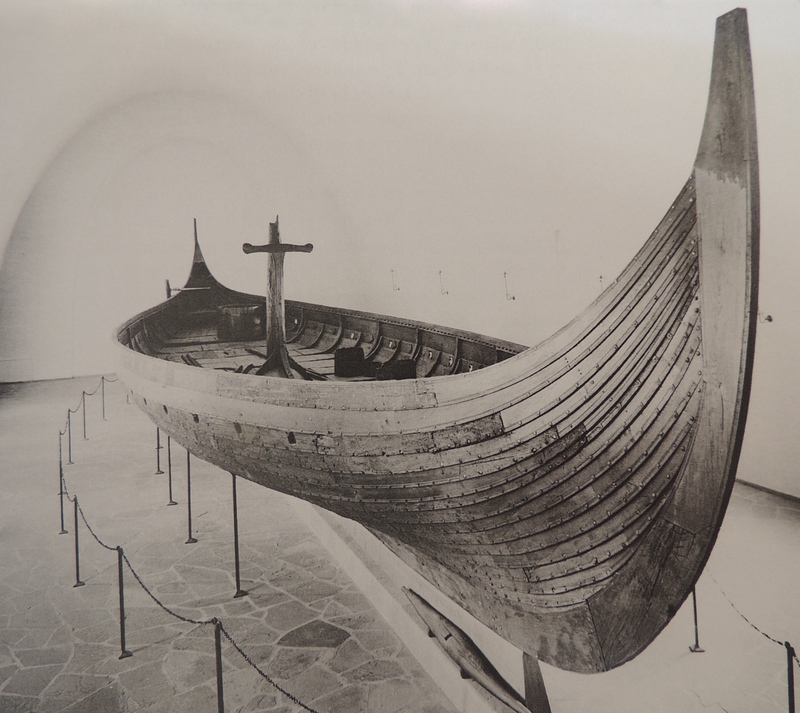 Two beautifully carved beds lie at the end of the room; copies form the Oseberg and Gokstad ships. 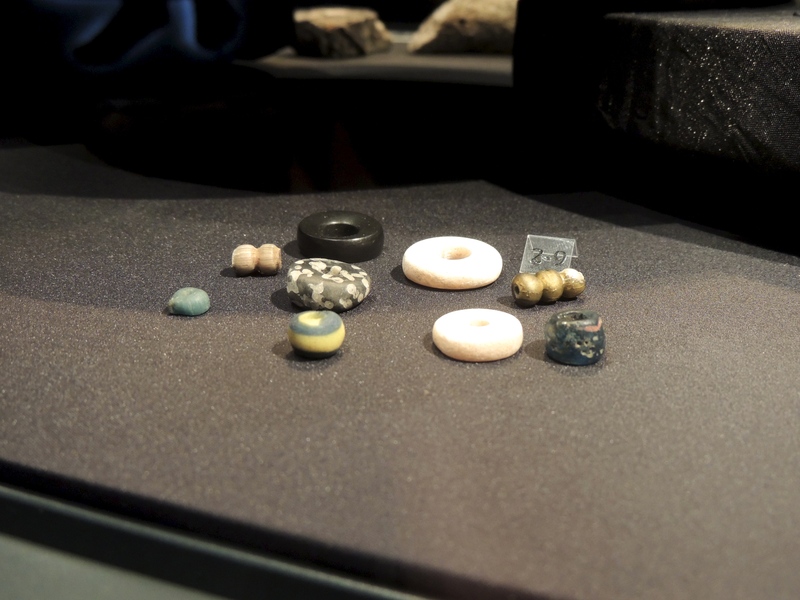 They stand firmly beside a few tables and benches that are strewn with small objects and curiosities of an ancient time: bowls of dried meats and vegetables, glass beakers and Viking cutlery. Some gaming boards with clay pieces, sit on a table in the middle of the room. Tafl games they are called; not so different to the game that was found at the Ballinderry crannog. 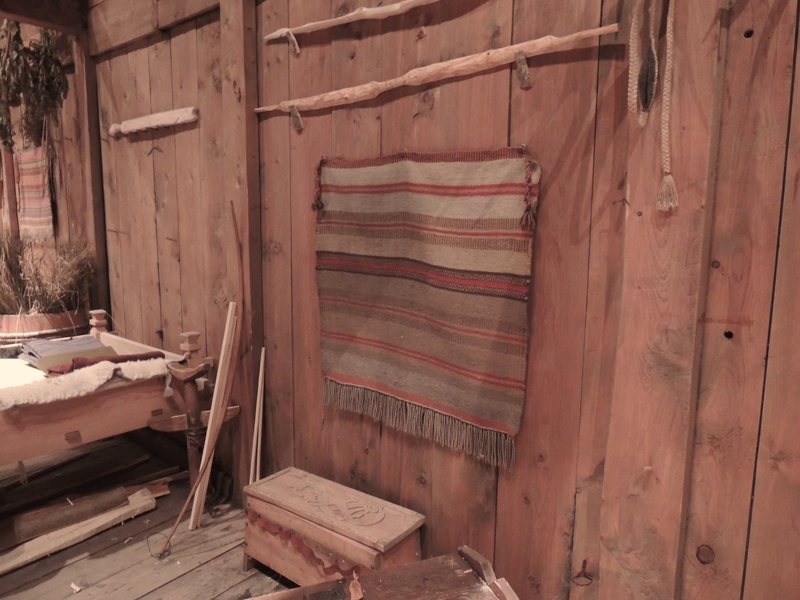 Directly over these, many grey and white reindeer pelts are draped majestically over a wooden cross-beam, such hides we believe would have been most likely hunted by the Sami and traded during the Viking Age in Northern Norway. 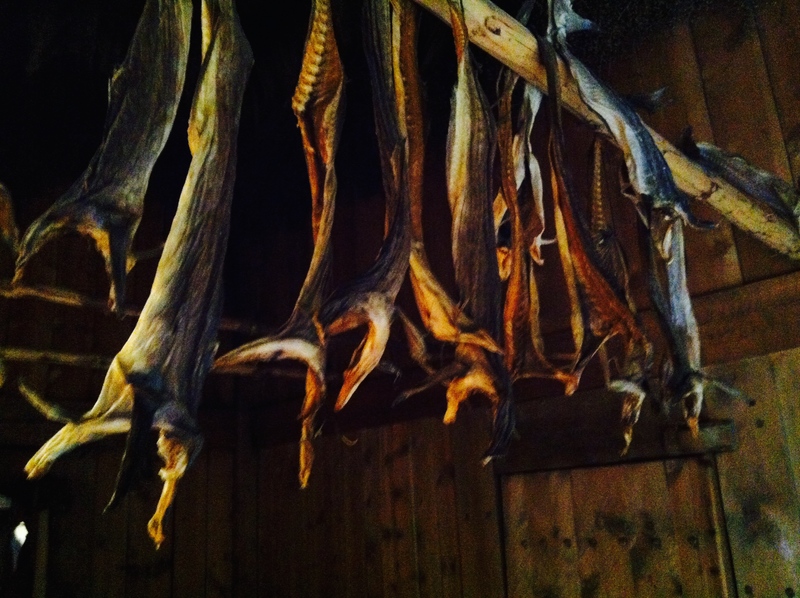 These share a post with the dried stock fish, the pride of Lofoten. Usually found headless and hanging upside-down outside people’s houses or on large wooden racks along every harbour, they too may have been a common site in a Viking-Age longhouse, particularly if that house in Borg, with dried stock-fish supposedly being one of the major sources if income to Borg and Lofoten in the Viking-Age. A second view of the Living Quarter. When working here solidly everyday, the mind does on occasion drift off on a wordless thought, where in the briefest of moments it might as well be a thousand years ago; until you are immediately pulled back again by the flash of a camera, the rustle of Gore-tex or the odd chirping of a mobile phone. I dropped the chop-block on the wooden floor in front of me, in an unused corner of the room and contemplated; ’The bench can go by the bed..;’ I thought, ‘I can fit a shelf there… and that post would be perfect for a tiller..;”. ‘But why do I always choose the same layout?’ I thought to myself. 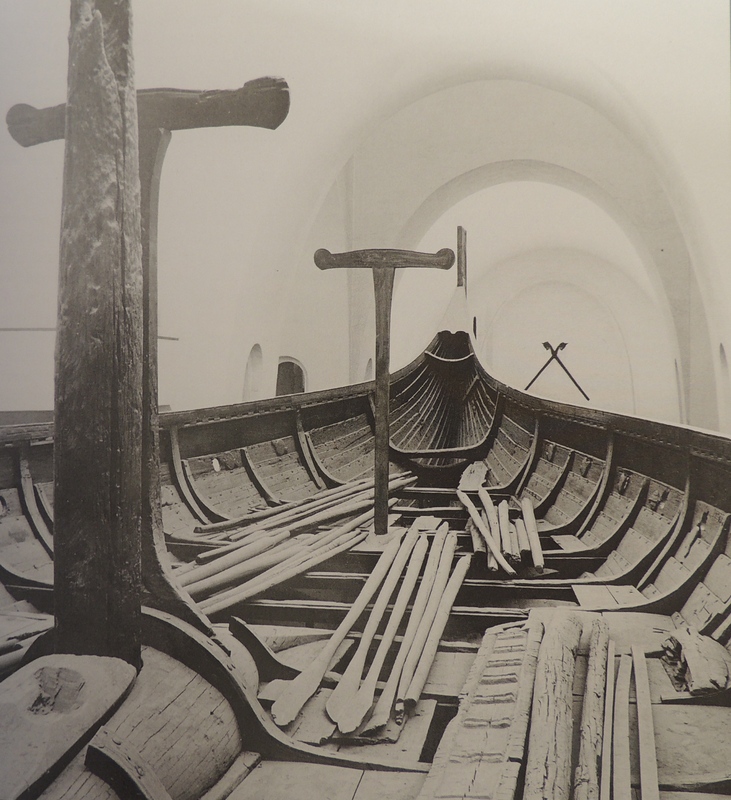 We have paintings and laws from the later middle ages that describe the workshops of bowyers, but no such station has ever been excavated from a Viking context; at least none that resembles mine. My layout rather reflects some of the tricks (and habits) I have personally picked up since I first started bow-making. My tools tend to lie about and rest close at hand while all my benches and contraptions; the wall-tiller, shave horse, tools and shave-brake like the hearth, all seem to rotate around the chop-block. This is because the block is where all the hard work really begins. 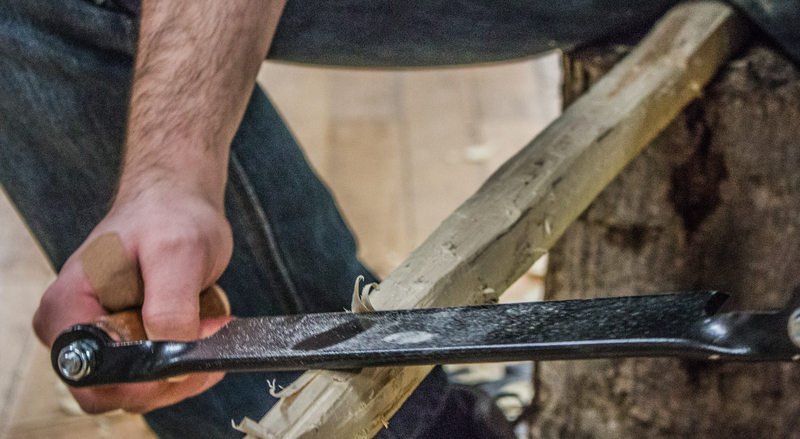 With an axe in one hand and a thick bow stave in the other, I will start by hewing and cleaving the stave’s sides until I have thinned the trunk into a billet; like the ingot of a blacksmith, the billet is the raw wooden stave from which a bow will be attempted. I took a fresh nail from the box and began once again, fixing my faithful shave-brake to the ground. 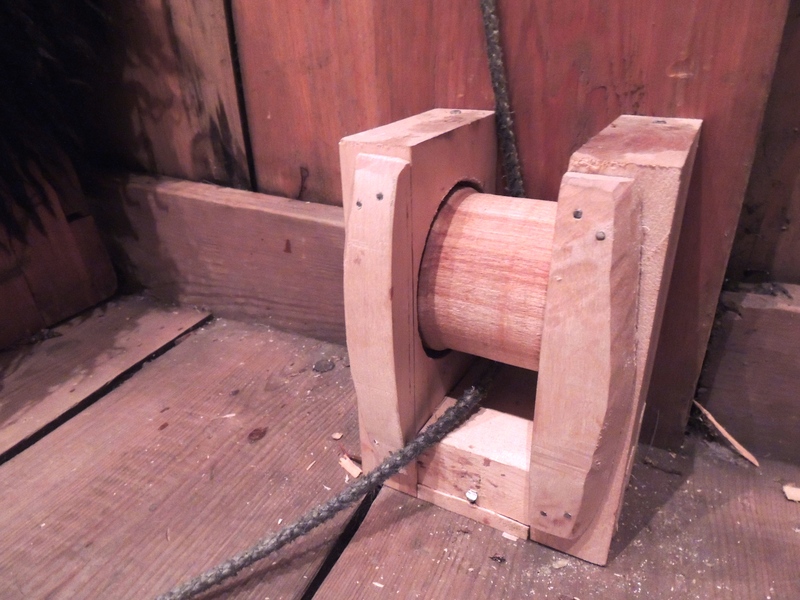 Such a thing is usually used in traditional ‘green carpentry’ for controlling the ‘splitting’ of a log, though at waist height and at a flatter angle I find it holds a stave really well. I picked it up from a man called Mike Henderson, an Irish bow maker with whom I lived for several weeks in the Burren, County Clare while writing my Masters thesis on Viking Age archery and Bow production. 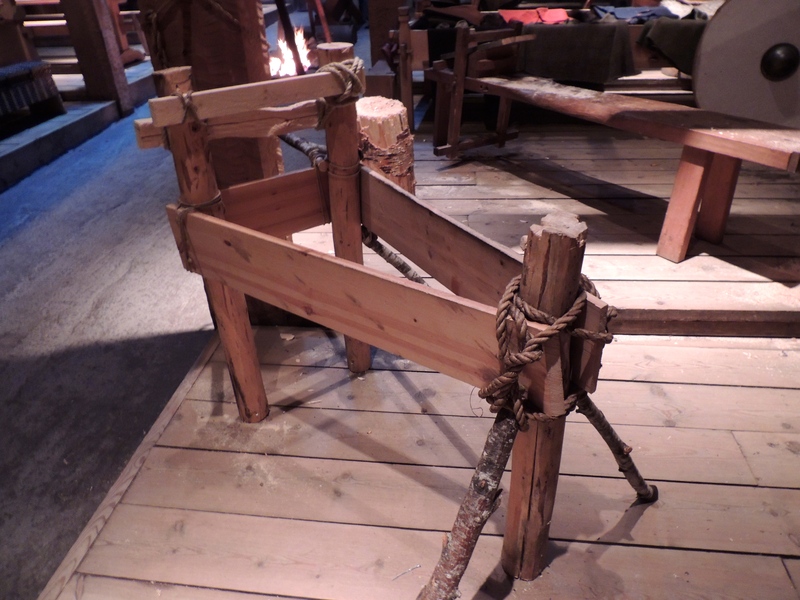 Not something one would typically find at the head of a Chieftain’s bed in a longhouse, the brake works by driving three posts into the ground in a triangle. On the two back posts there are attached a couple of angled cross-beams. 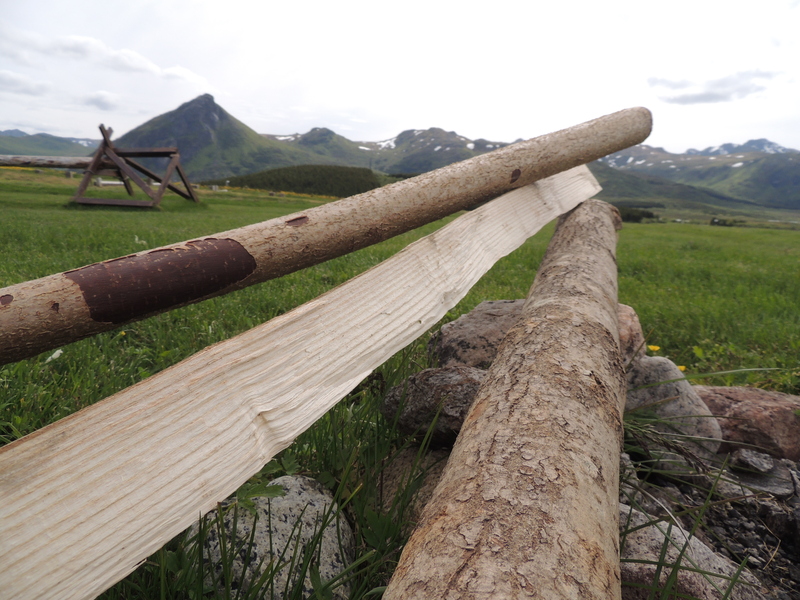 A bow stave can be wedged between these two beams and lifted over to rest on the third post; firmly securing it while leaving both hands free to work the wood on all sides. I don’t believe bow-making would be something one would carry out in a Chieftain’s longhouse. Normally this would be done outside, possibly closer to woodland, so that the posts may be driven into the ground and not nailed to a floor. I built it here, so that I might turn my usual workshop into a living exhibition. Something a bit more familiar to bow-makers however, is the bench that stands just above the chop-block. 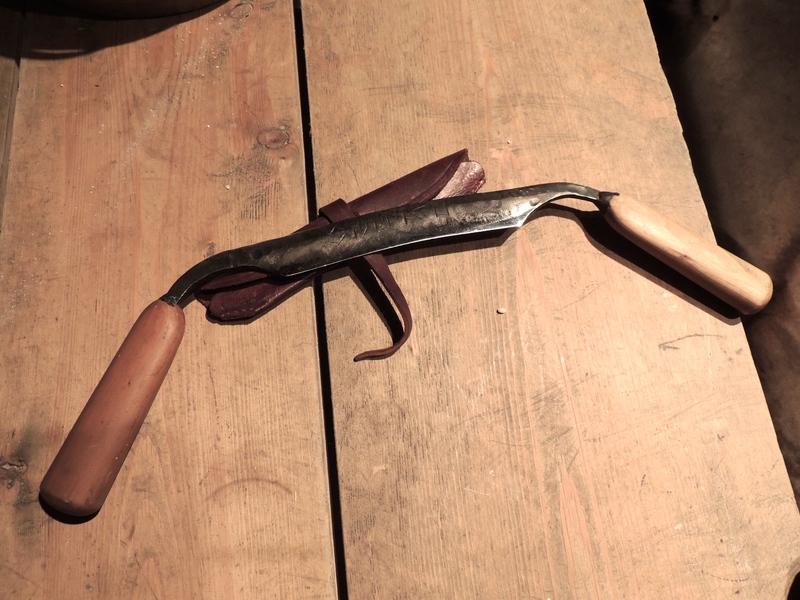 Commonly referred to as a traditional ‘English Shave-Horse’, it shares a similar function to the shave-brake, with the added ingenuity of one being able to sit down. The stave rests on a panel that rises and falls by a sliding wedge. 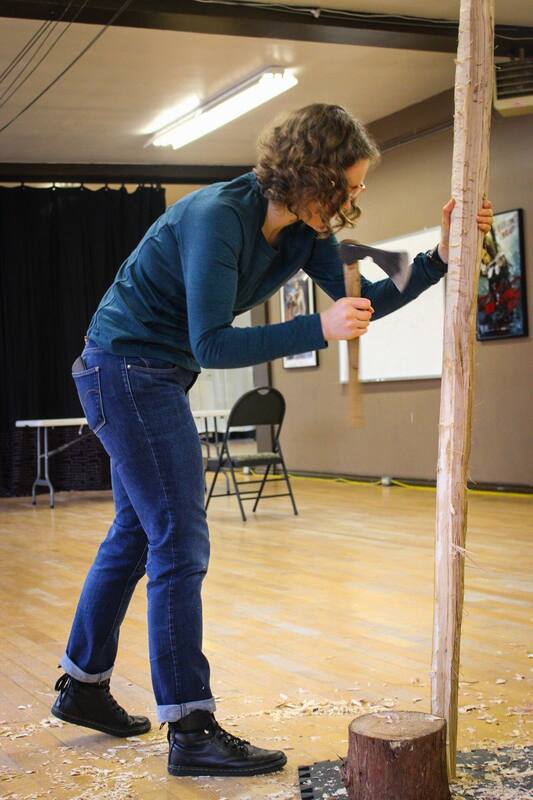 The stave can then be held in place by applying force with both feet to the two pedals or ‘stirrups’, beneath. Hence the name; shave-‘Horse’. I then reached into my bag for a large wooden wheel. 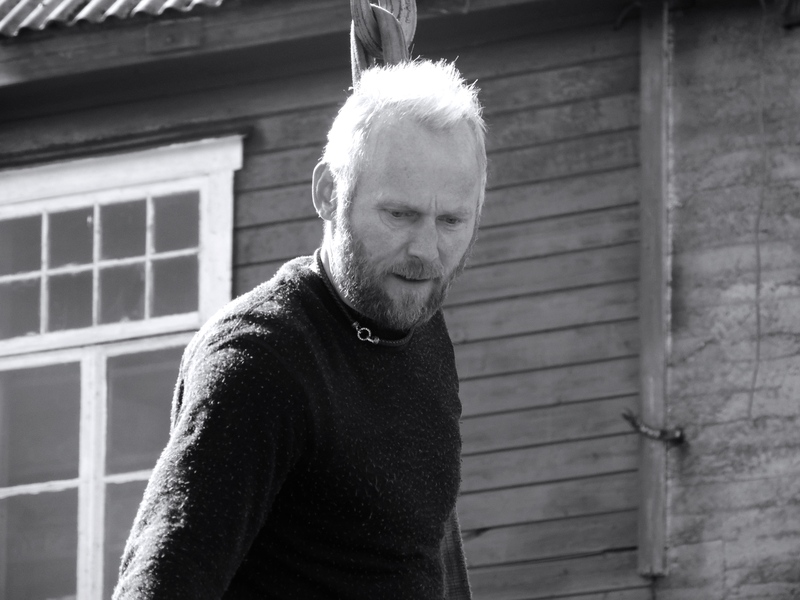 It was a hand made pully that Terje had given me; made for the ropes of a small fishing boat, but absolutely perfect as a ‘wall-tiller’. As I removed the wheel from the bag it caught the eye of one visitor, an elderly gentleman with a thick Bavarian accent and around his eyes, the creases of a man who is fond of laughing. “What is that for?” he asked, seeming to enjoy the puzzle. “Well, actually, it was made for a fishing boat” I answered as I handed it to him. “Ah! I thought so” he said, turning it over in his hands. “But I will use it to make a bow”, I continued. “A bow? !” he exclaimed; with a chin to his chest, peering over his spectacles. “Yes” I said, “I am the bow-maker here”; drawing an arrow of air to my ear. “Ah!” he said, “Pfeil und Bogen!”; nodding again. “And so, the wheel is for?” He asked handing it back to me. I took a step back; “Do you see behind me? I have a shelf to hold the bow on the wall. The handle sits here. When the bow is strung or ‘braced’, the hook is placed on the bowstring and a strong rope runs through the wheel which is tied to a wooden handle”. 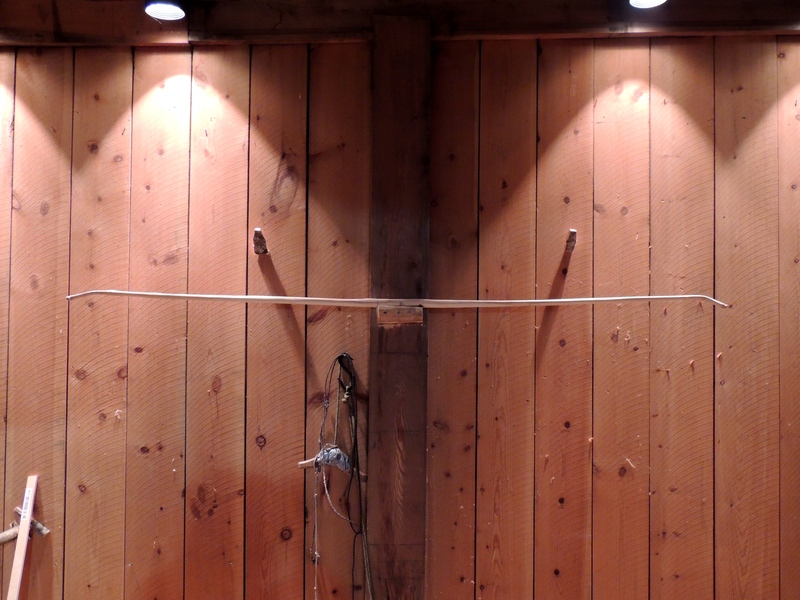 “Using the wheel, I can then pull the rope slowly back and forth, watching the bow bend on the wall from a distance; exercising the wood; stretching its fibres”. 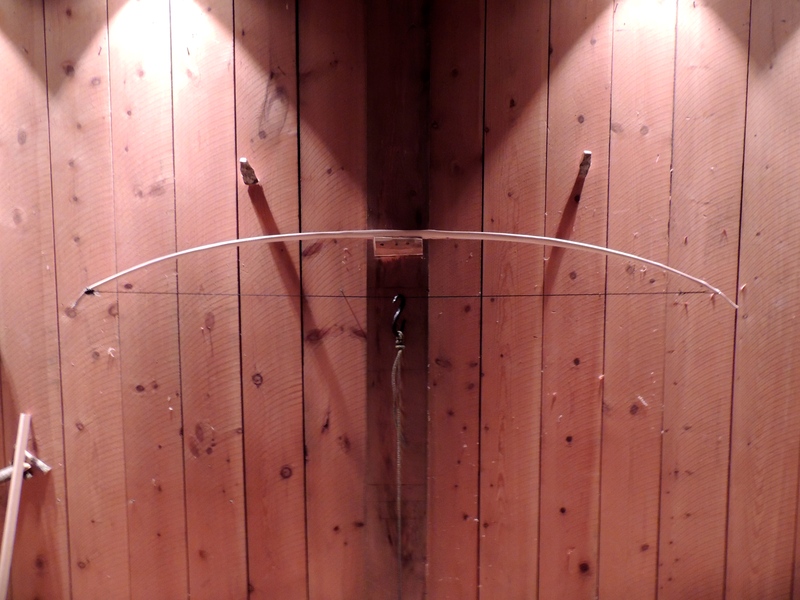 Bow shelf on the wall of the house. “But why don’t you just wet the wood or heat it?”. This is probably the most common question I get, for which by now, I have refined my answer down to two questions: “Why would I wet it?”, I asked him. “To make it into a ‘bow’ shape”, he answered. “And if I permanently shape the bow in an arc, where then would the tension come from when I draw the string?”, “Ah!”, He said smiling. “Logisch!” – I Love that part. 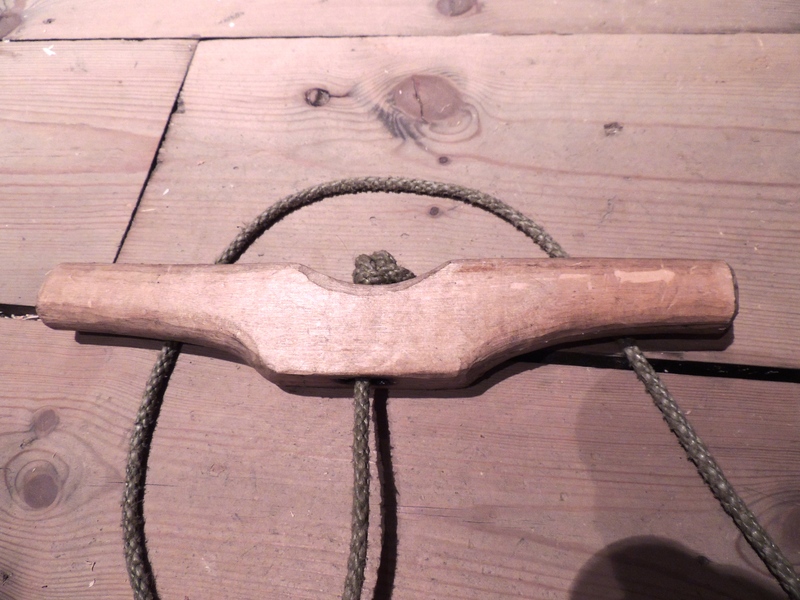 Wooden tiller handle with hemp rope. “There must be something pushing against you as you pull the bowstring”. “You never try to force a bow to bend” I continued, “You want to follow its natural shape, incorporate any lumps, bumps or twists into its final shape; you ‘teach it to bend’”. “A well made bow” I continued, “is straight when unstrung, takes the shape when braced, arcs evenly when fully drawn but returns straight again when taken off the string”. This is one of the ‘bits’ I have learned. With thousands of tourists and visitors a week, every guide here has his or her own bag of tricks; answers, phrases and facts. “But we cannot forget the other half of the weapon!” I sometimes say, moving over to the fletching station. Here I have a small table and chair. A ceramic jug filled with turkey feathers sits beside a wooden bowl of beeswax and linen thread. I have a stick of pine resin glue and beside me a bucket of pre-made poplar and pine arrow-shafts. 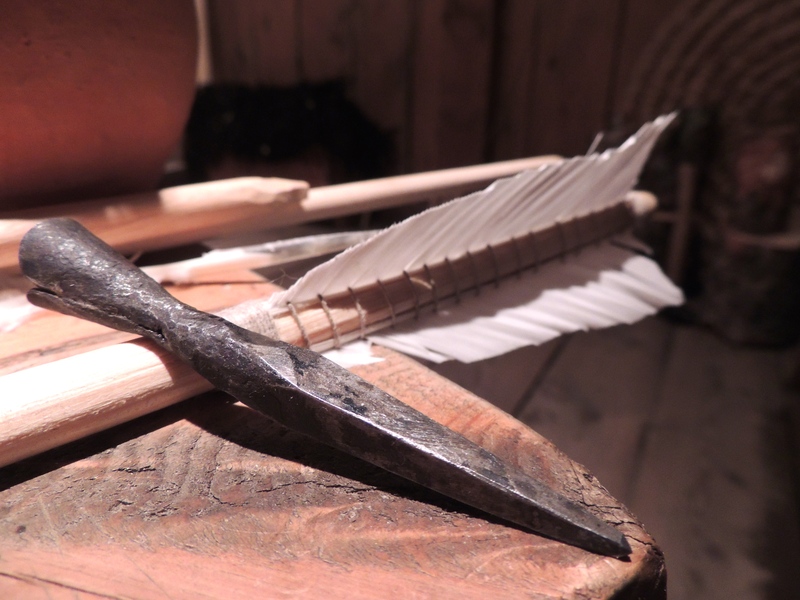 But sometimes more important to them than the fletching is the question of who made arrowhead. I tell them; “If you go on after the longhouse and make your way past the white building at the administration, you will come to a small pine forrest”. 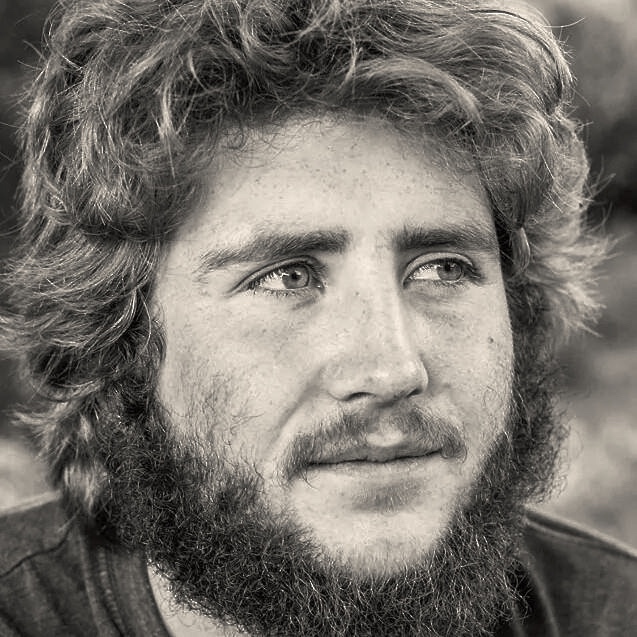 When you pass through to the other side, you will hear the pinging and clanging of our smithy before you see him; Brage Stenson, a friend of mine and a talented blacksmith in training. He will spend his summer down here, forging iron and organising archery and axe throwing for the kids and other guests. The smithy is where my arrowheads come from. Some days I will receive a couple of new ones from a blackened hand over my morning coffee. Some are forged barbed for hunting; and some long and pointed for penetrating chain-mail. Bending a strong bow on the wall and explaining it is one thing, but handing a tourist a fully fletched arrow, bound in linen, sealed with rabbit glue and tipped with iron really gives them something to think about; and me, something to smile about, with every wince as I describe what kind of damage each one is designed for. The block lay at the centre of the workshop, the horse was standing proud while the tiller and brake were stuck firmly to wall and floor; it all looked very Medieval and busy. Manfred, a tall German guide and one of my coordinators, caught me as I was packing up for the evening, “You are hear now?” he said with a look of surprise. “Yeah”, I answered, “But I think its going to better here”. “Yes I think so too”, he added, “This is where all the activity is. In the back you were so far away form everyone, but here, the people can see it better for themselves, when everybody is together and busy doing something”. 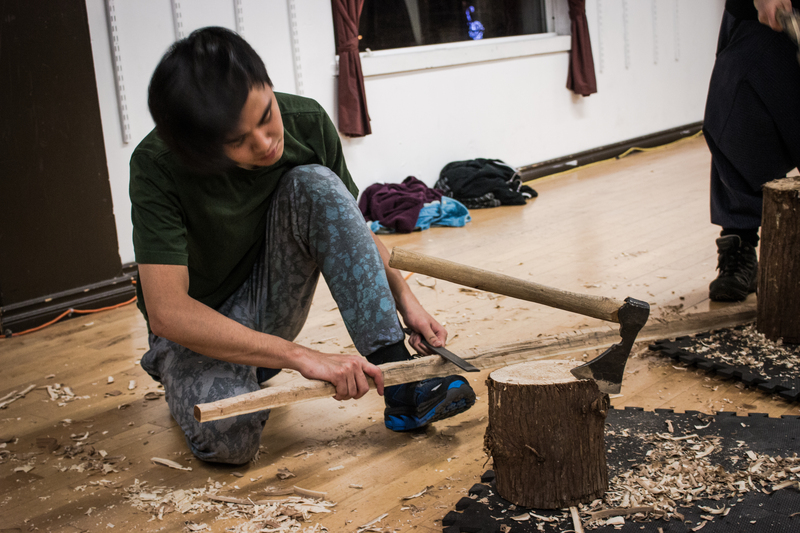 “And I no longer have to run between rooms with hot pot of wax and a bow in my hands whenever I need to use the fire” I added, “I just need to find the rest of my tools and materials and then I am good to go”. “Well,” he said, “Now that you are no longer on the edge of the universe, your tools won’t go so often for a walk as you say”. But tools always walk, that’s what keeps archaeologists in business. Munch, G. S., Johansen, O. S., & Roesdahl, E. (eds) (2003) Borg in Lofoten: A Chieftain’s Farm in North Norway. Trondheim: Tapir Academic Press. I wonder how many Vikings marched off to war in a shirt and trousers their mammies made for them? Last year the museum provided me with an outfit. This year however, I came prepared with an outfit made entirely by my own mother. Personal dress can often be the defining aspect of one’s culture or one’s own status. To Dickens’ musing, even poor Oliver Twist, in that single moment when newly born and wrapped in just a blanket, might have been the child of a nobleman or a beggar. But no stranger could have determined his role in society until he was enveloped in a pair of old calico robes, which had yellowed in the same service – badging and ticketing him as a parish child; a pauper; to be despised by all and pitied by none. The artefacts that once dressed and shaped the atmospheres of the past, are no longer in their original contexts. They have become darkened with age, time has removed them from the bustlings of daily life and they are left in places to stand, untouched and deadly silent. In the Longhouse however, atmosphere is everything, and if the atmosphere created here is anything similar to that of the original family’s in the 8th century, then it must have truly been a magnificent one. The dynamic here would not strictly be considered reenactment, neither is it the same as living history. 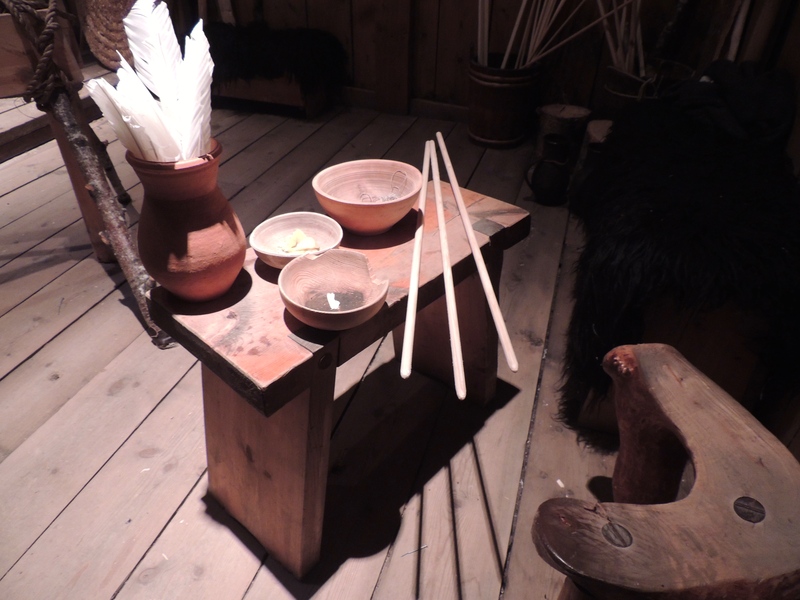 But, by the time each visitor has reached the reconstructed longhouse, they have seen already the original objects from the excavations at Borg; now suspended in time behind glass. They have also seen the excavation site; a rather cold and windy excuse to see a large pockmarked crater of postholes. 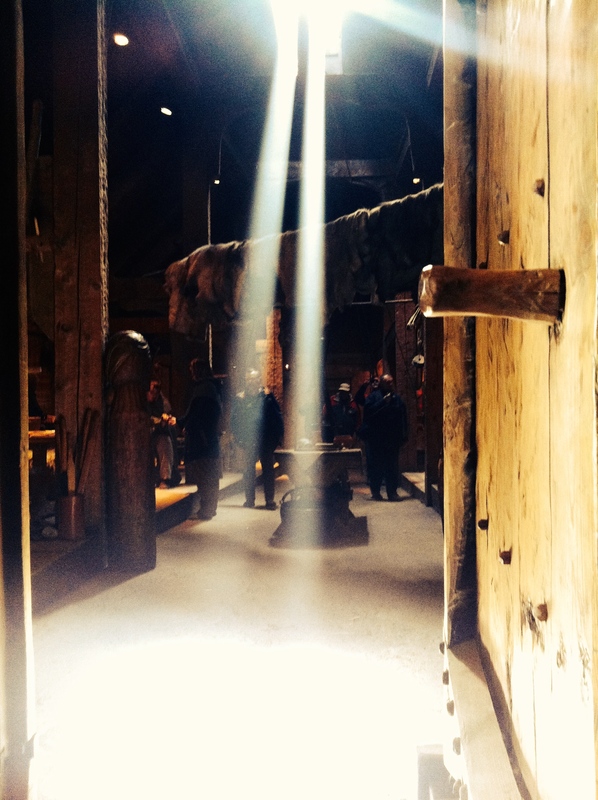 But as you turn to enter the longhouse, which slowly looms over a hill of sheep and goats, your nose is first met by the aromas of burning firewood and a bubbling lamb stew; you begin to hear the sharp, staggered banging and scrapes of wood as you cross the threshold into the main entrance of the house. Almost immediately you are greeted by a guide dressed in the finery of a chieftain or a lady of some importance, while many bodies clothed in slacks and shirts of white linens or dresses and tunics of wool wrapped in cloaks, hurry about the place chatting to tourists and going about their daily duties. The site of the original longhouse. Approaching the Chieftains’ Longhouse from the Museum. “so too do the vibrant bright blues and yellows and the deep greens and reds pull you farther away from the black and brown leathers that Game of Thrones or The Lord of the Rings have left us used to”. Small funnel Beaker, its size and form suggests its from the 9th Century. 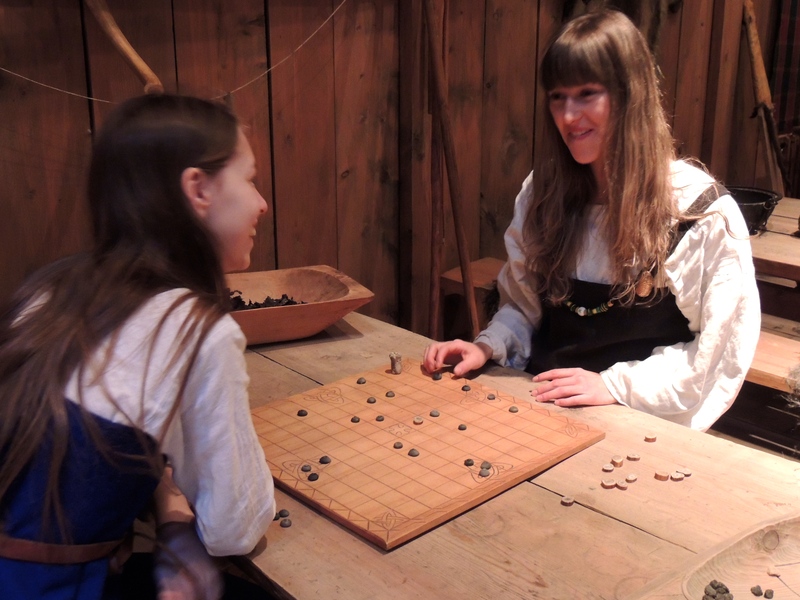 Two guides enjoy a quick game of Hnefatafl. 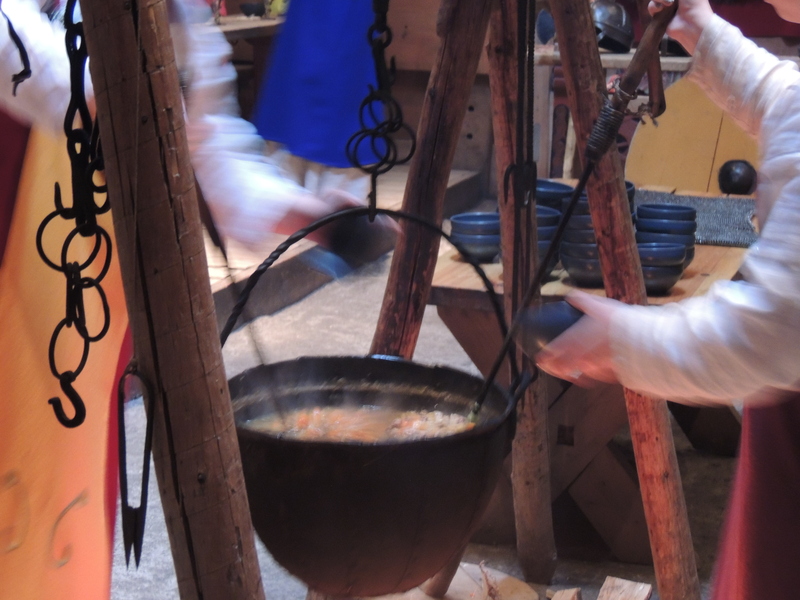 A crowd gathers around a pot of hot lamb stew, filling bowls for the guests. Most of the clothing worn by the staff is produced on site by the museum. 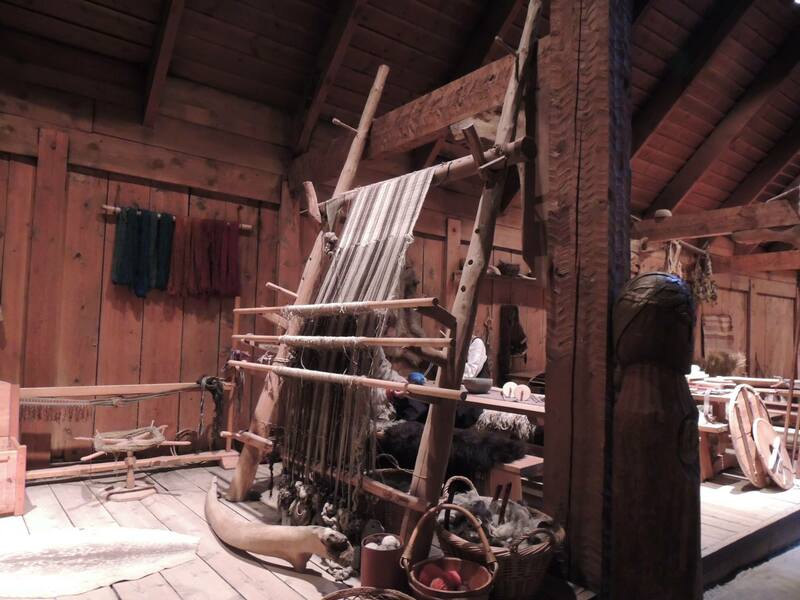 Aside from woodworking and leather crafting, tablet weaving is a common site in the longhouse. Usually some of the girls can be seen weaving by our two looms; where often, many visitors will amusingly take one of the whale bone loom-swords and poise themselves with a shield and helmet for a photograph. Authentic clothing is what really makes the difference here. We of course learned about clothing in University, but my interests tended to sway towards the shinier, sharper things of the past. But the the mixed image of bright colours and textures tends to remove your thoughts from their usual comfort zones; much like how a multicoloured Roman column or statue tends to hurt the brain, so too do the vibrant bright blues and yellows and the deep greens and reds pull you farther away from the black and brown leathers that Game of Thrones or The Lord of the Rings have left us used to. Guides of every language are placed around the house to answer questions and talk about the history and archaeology of the site. The loom stones rattle eerily as the loom is worked. 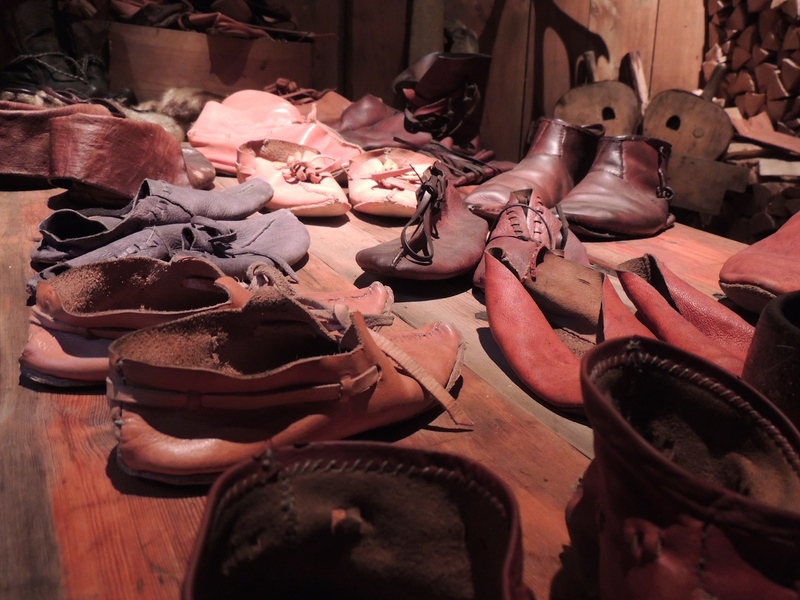 A table of leather shoes; collected over the museums many years. This year however, I came with my own outfit. I certainly don’t feel of ‘higher status’ in the traditional sense, but having a dressmaker for a mother certainly made a few of my fellow Vikings quite jealous. Having usually worked on wedding and debutant dresses, my she was quite excited at trying something so old and so different. The first question was that of colour. Some colours in the past were of course more expensive than others and available to only those who had the means to wear them. Though I figured as I am ‘the Chieftain’s bow-maker’, I should probably dress more like a hunter; I therefore chose more earthy colours that would blend a bit more into the surrounding light green and boggy brown landscapes of Borg. 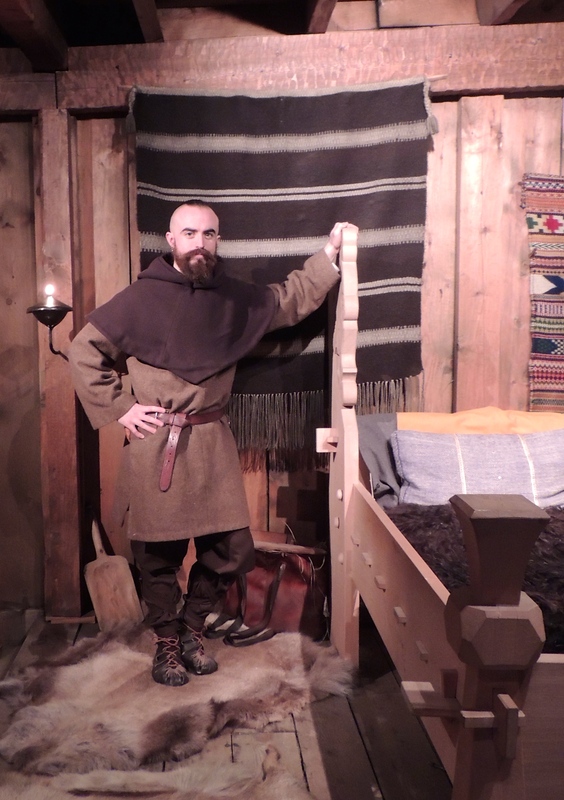 My new Viking outfit, of wool and linen in light and dark browns. The boggy ground around the museum; making an Irishman feel right at home. Small mountain right outside my house. Last year I wore a pair of woollen trousers, but they proved far too heavy and hot for work. We chose then a lighter linen of dark brown. 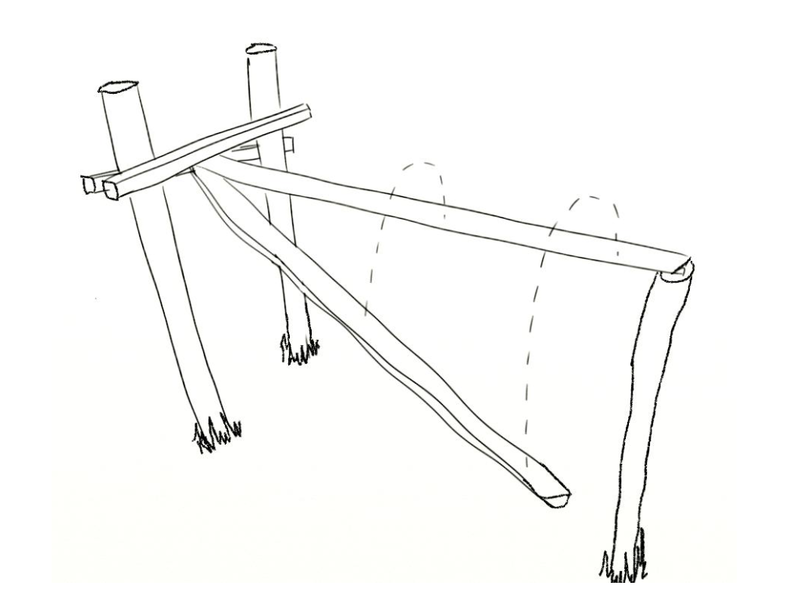 From the same material we then made a pare of leg ties that would hold in the looser ends of the trousers; keeping them from snagging on any low jutting branches in the woods. 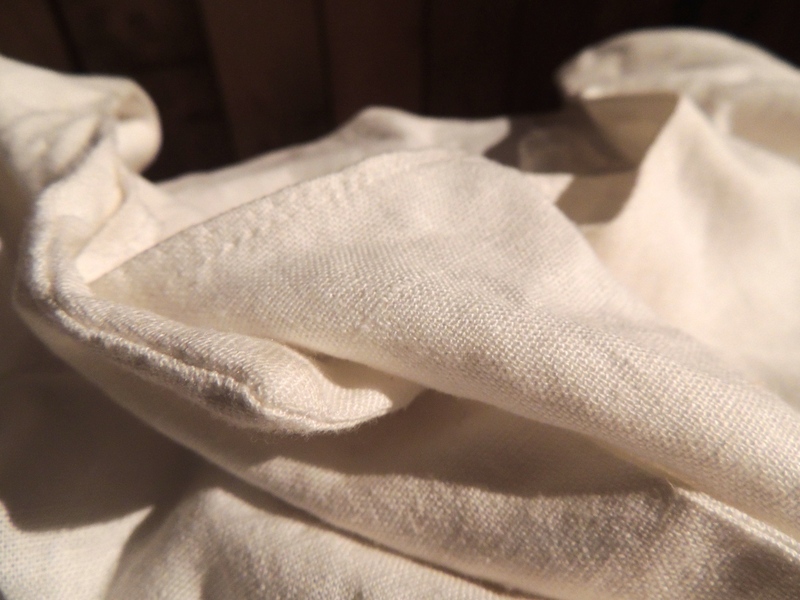 The undershirt however, is of a really nice white linen. In keeping with the period, it has no collar, it is worn by pulling it over the head and reaches down to just above the knees. 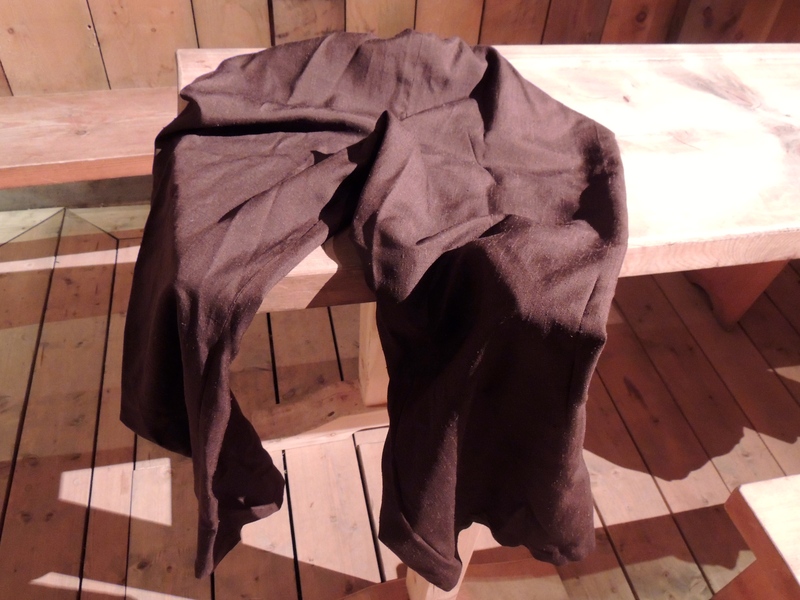 The tunic, my mother’s favourite article, was made from a really nice light brown wool. 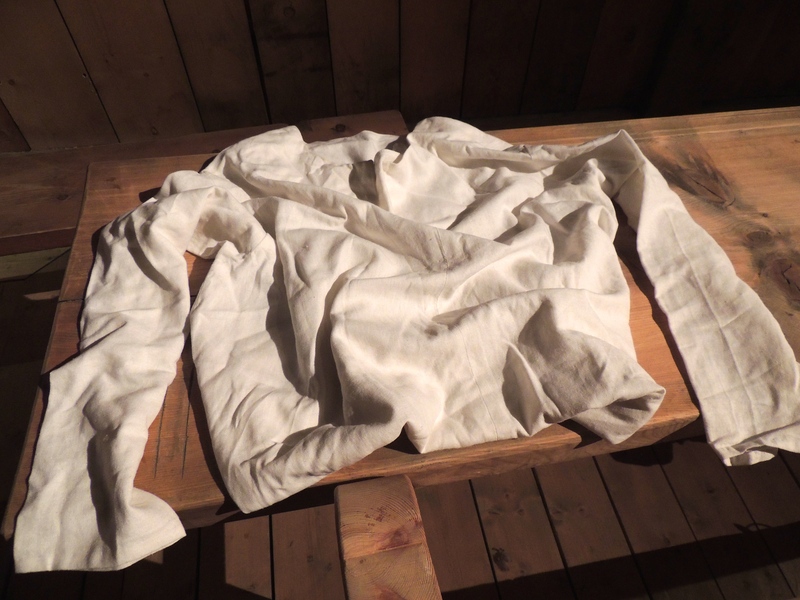 More or less the same design as the undershirt, it was made from 100% wool and is extremely warm, a detail I would easily have made use of when sailing on the longship last year. 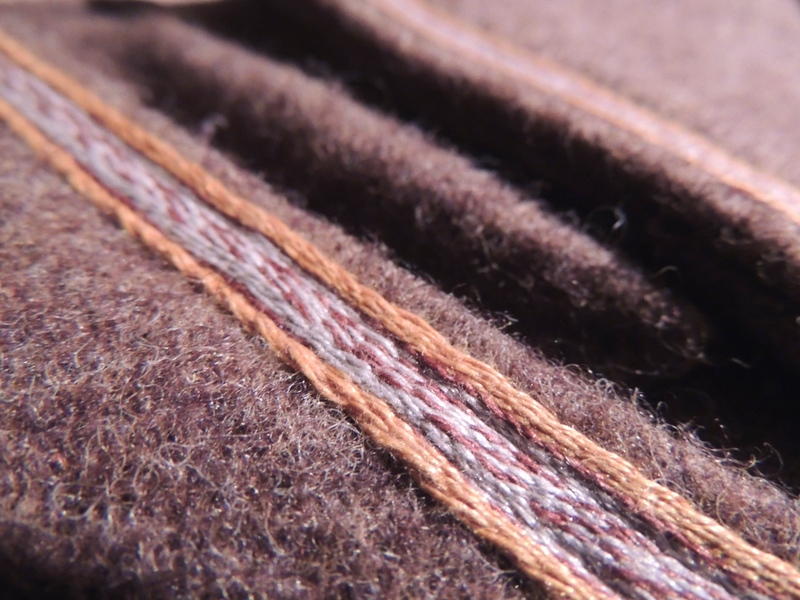 Sewn around the edge of the neck is a thin tablet woven trimming. 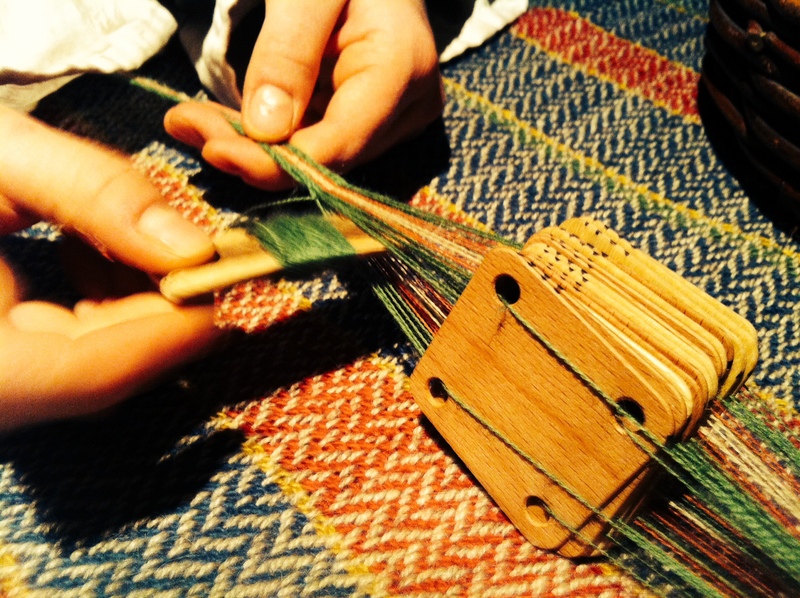 Tablet weaving is another activity often practiced by the fire in the longhouse; several rocks hold in place the ends of many different coloured strings which pass through tiny holes at the four corners of each small square tablet; the tablets they then turn almost rhythmically like an ancient rubix cube, transforming a complicated algorithm into a simple and beautifully patterned strip of colour. With no idea where to even start, we preordered a thin handmade strip one on eBay, made with yellow edging and red specks; which when attached to the tunic really made the neck pop. 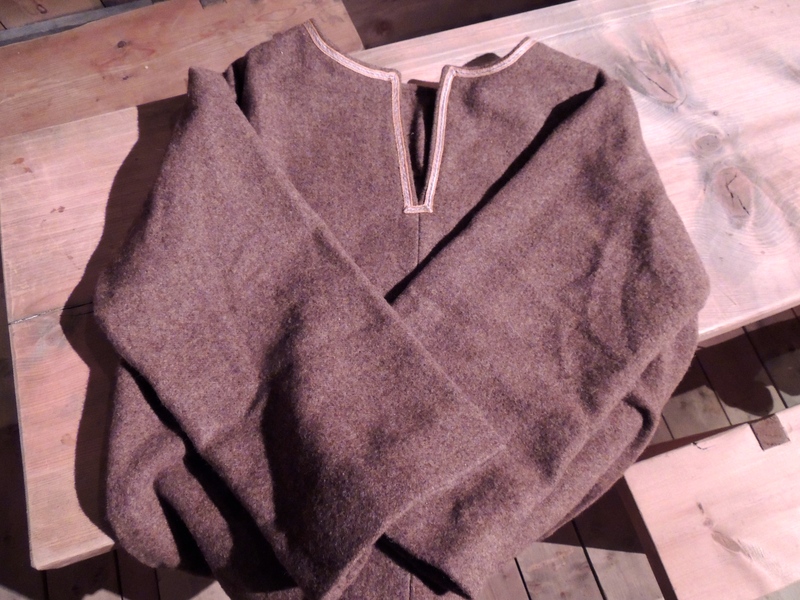 The tunic, made from wool and tablet woven trimming. 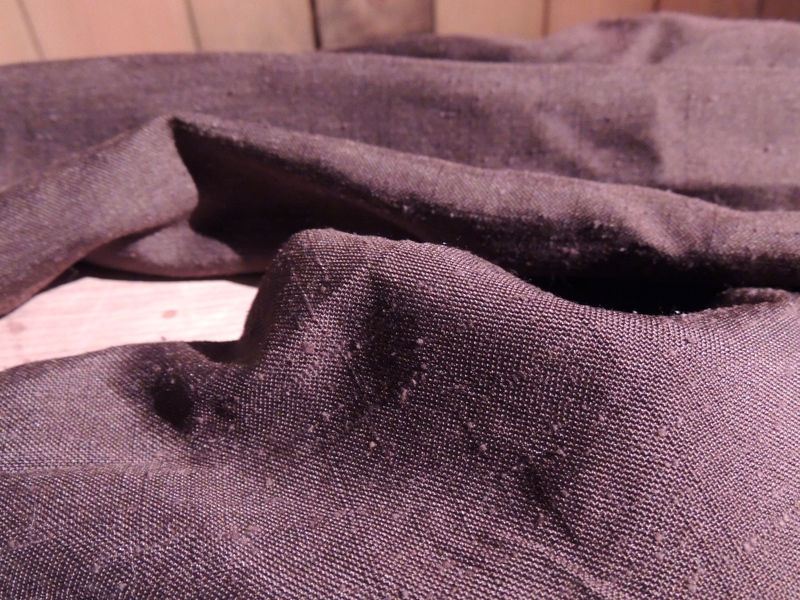 “it was made from 100% wool and is extremely warm, a detail I would easily have made use of when sailing on the longship last year”. 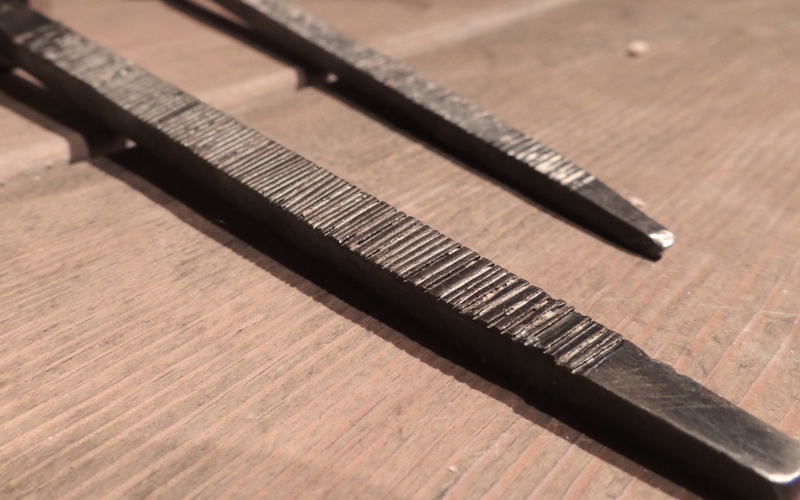 Close-up of tablet woven trimming. 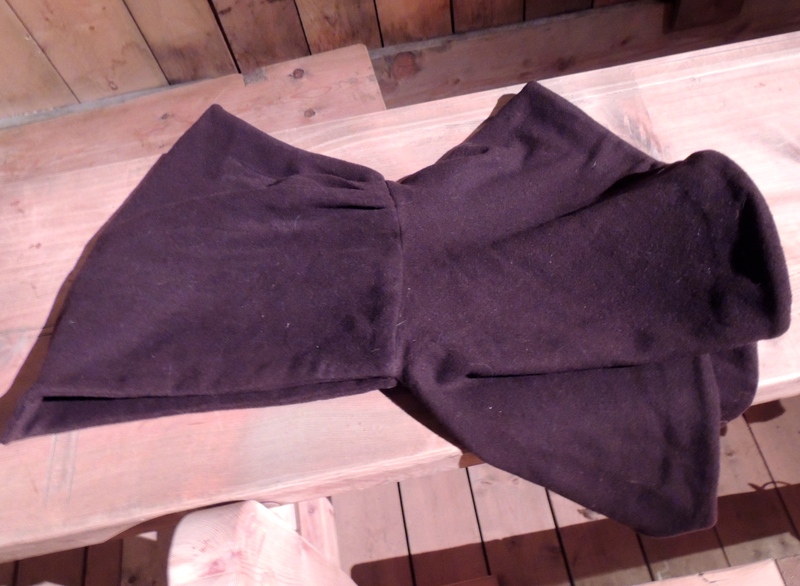 My own favourite piece, is the dark brown woollen hood. This I remember, was excellent for keeping my chest and neck warm at sea, although the tedious wind tends to flip the bottom half up onto my face; often when saying good morning to a visitor. 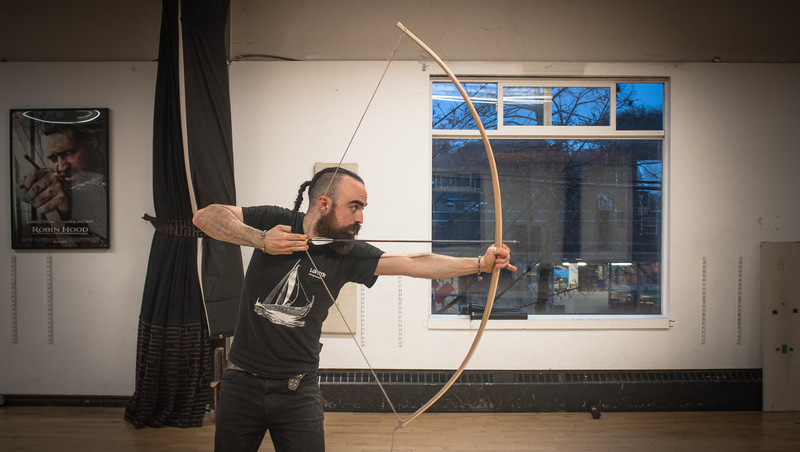 Commonly referred to as an ‘archer’s hood’, you really do look the part of the hunter when its warn with a bow in your hand. 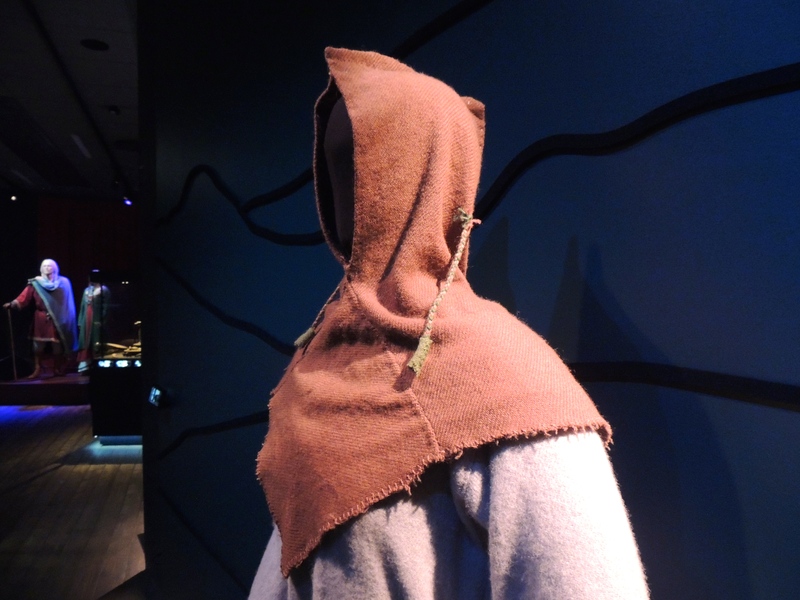 Although, I imagine such hoods were not exclusive to archers. 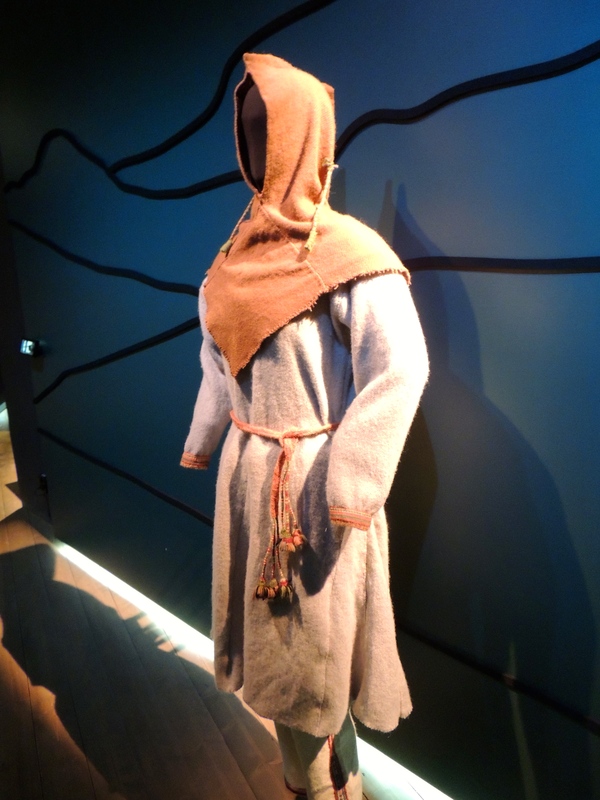 Reconstruction of the Skjoldeham outfit, on display at the Lofotr Viking Museum. Egyptian shoe, 4th Century Roman period, The National Museum of Ireland. 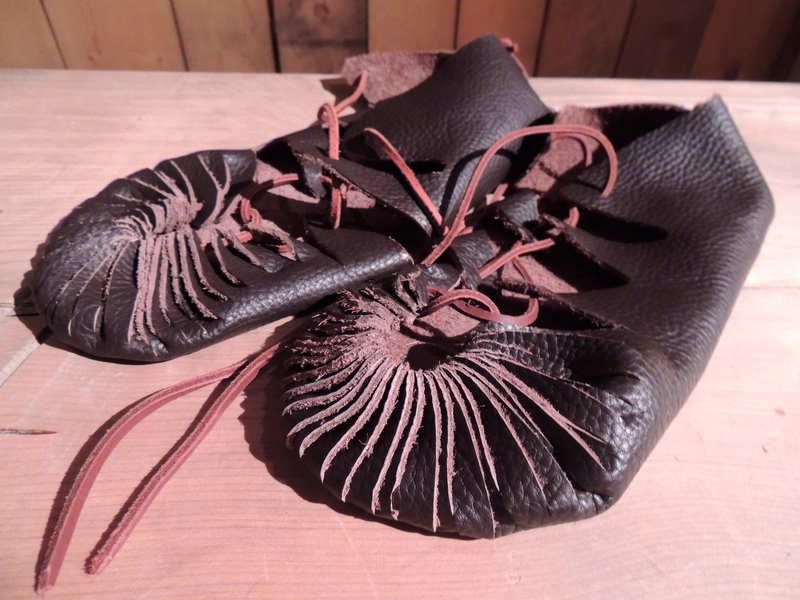 The shoes are a simple Iron Age design. Custom shaped for the individual, each shoe is a single oval of leather, which wraps around each foot. 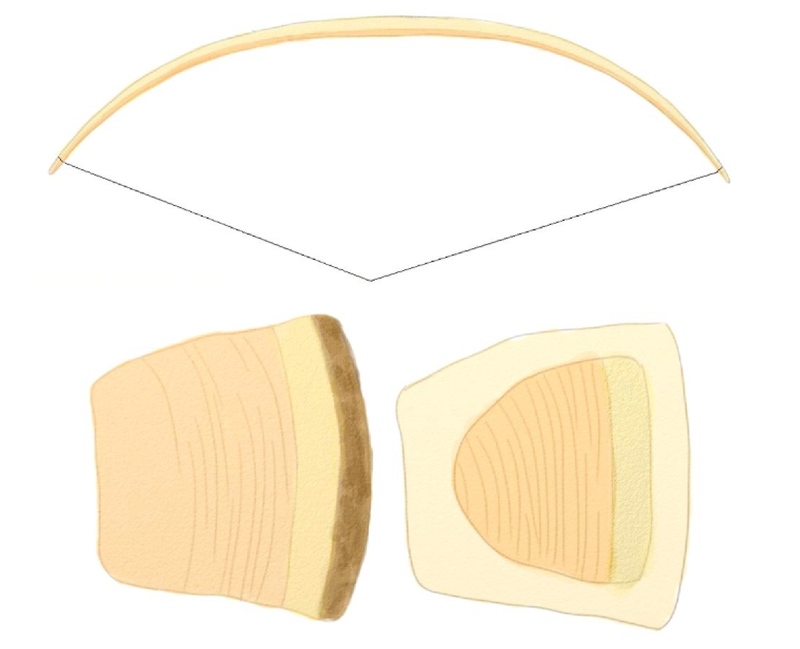 Around the toes, the leather is cut into a semicircular throng of strips, through which a string is run; which, when pulled tightly, basically creates a comfortable yet fashionable ‘bag’ for each foot. 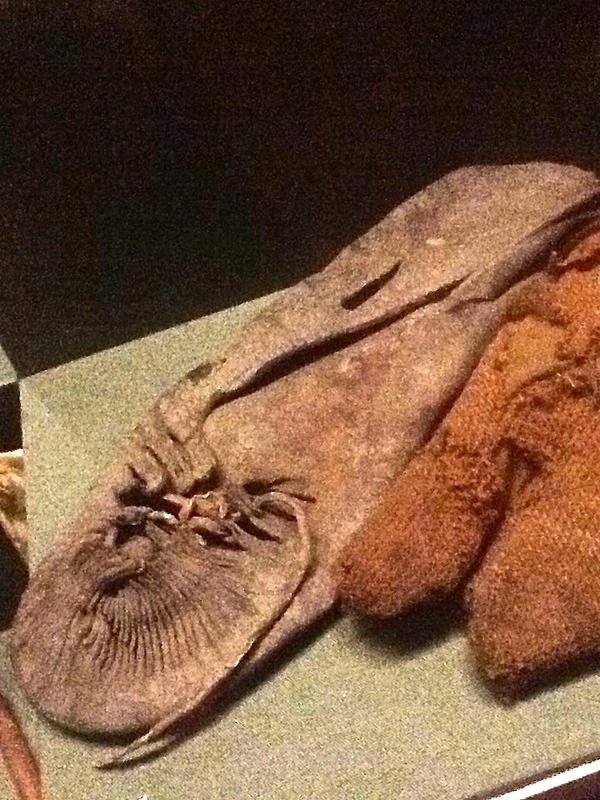 I found a blog tutorial to help make mine from: http://www.instructables.com/id/Viking-shoes/ , though a really nice example can be seen in the National Museum of Ireland; as delicate as a pharaoh but almost unnoticed in a corner of the Egyptology section, is a single shoe from the Roman 4th Century. 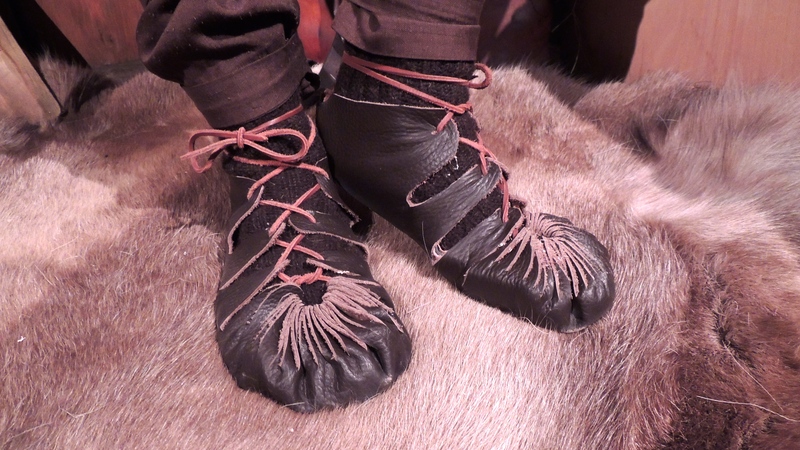 Leather Shoes, unhardened, reindeer skin. The shoes averred comfortable, silent to move in and very easy to make. 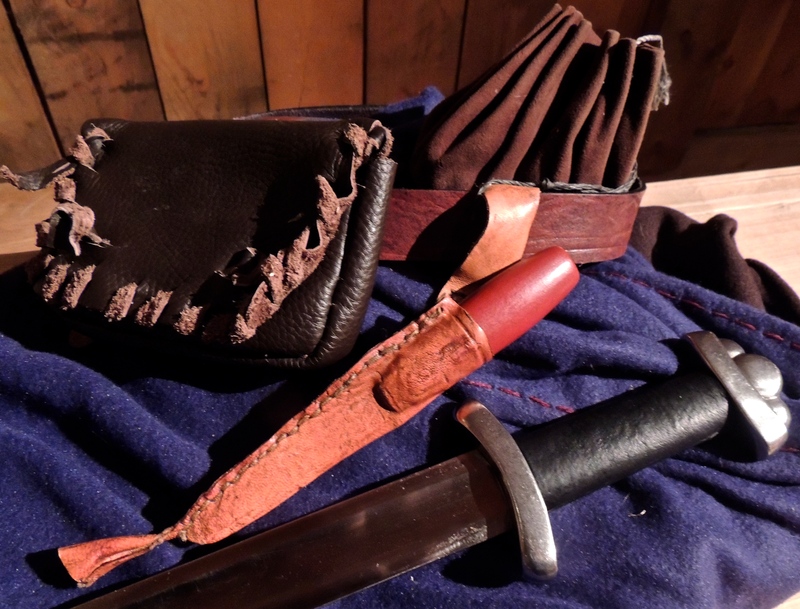 In a brown leather pouch I carry a few trinkets that I use often to talk to visitors about the small objects people once lost; only to pop up again during an excavation. Tourists love the little trinkets. They are often thought provoking, and help to reflect on some of the beads, pins and coins they only just saw in the exhibition below. They often find it amusing, the similarities there are between ourselves and those of the past; the idea of someone cursing themselves for losing a brand new comb or brooch; our conversation often ending in a story of a lost iPhone or camera. On my arm I wear a silver bracelet with two ravens while holding up my blue cloak, is a Hiberno-Norse thistle brooch. 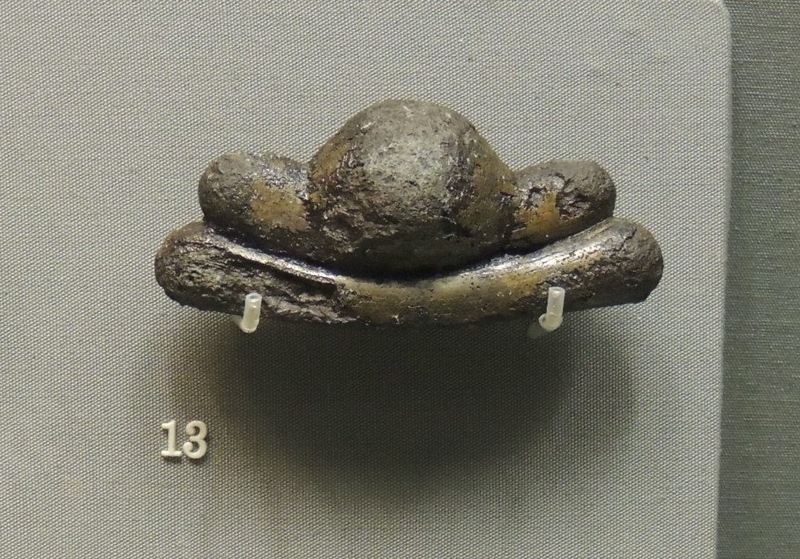 I was surprised to hear that these kinds of penannular brooches did not appear in Viking contexts until after they made contact with Ireland. 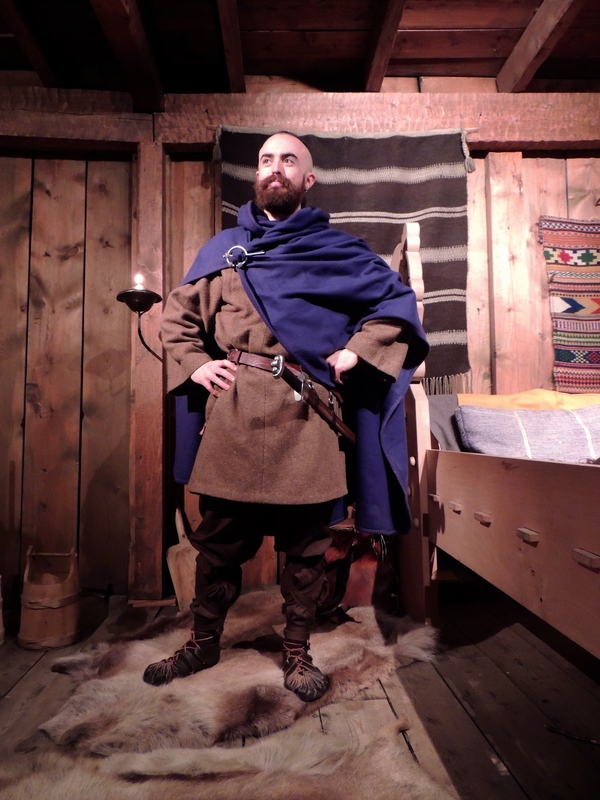 I now use it to show how Viking traders did not just bring to new places their own styles and traditions, but how they also borrowed and even adopted some of the styles and traditions from the places they migrated to. 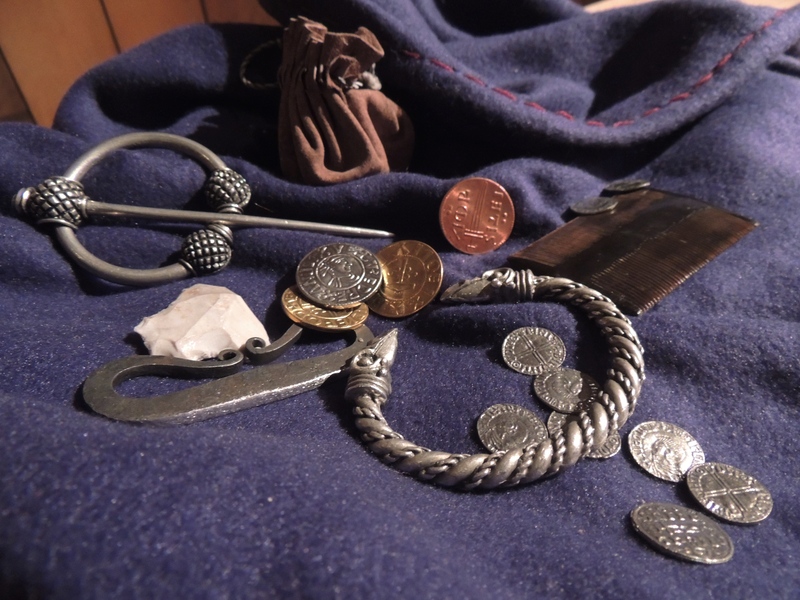 I carry with me a steel striker and a piece of flint which I use for firelighting demonstrations; a small pouch of replica gold and silver coins and a comb to show how I keep my beard and moustache so full and majestic. 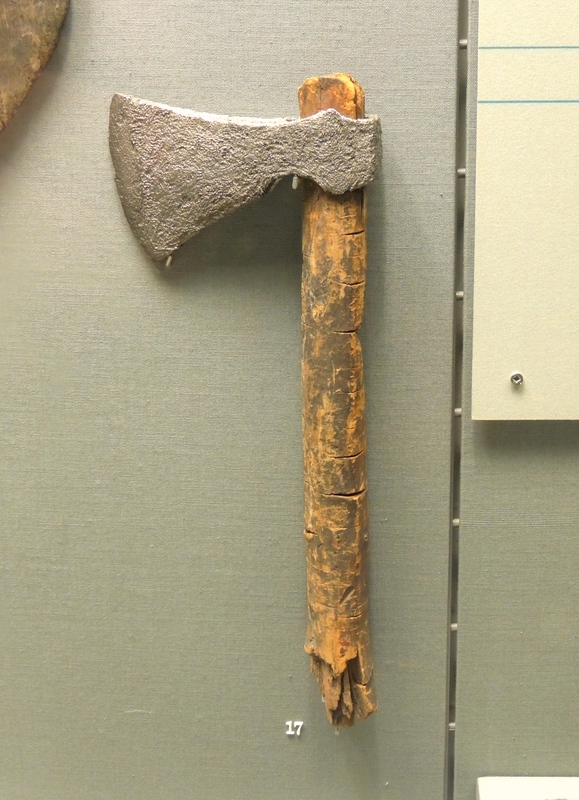 Some early Danish Viking laws required every freeman on the battlefield to bring with him to battle at least two spears, a shield and a sword or axe. 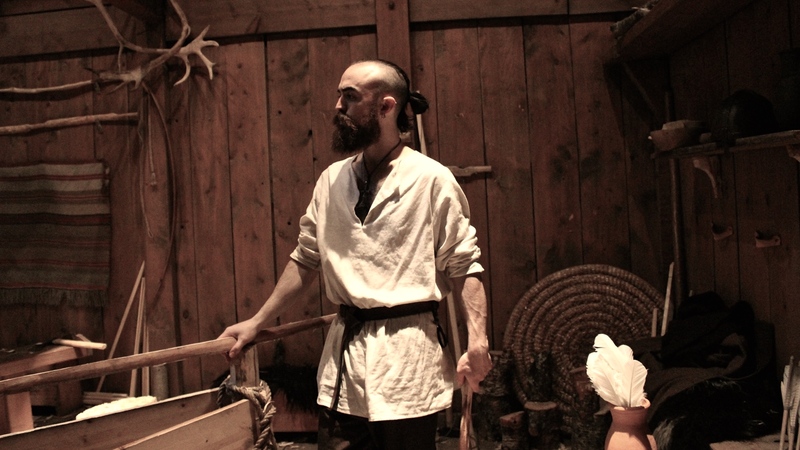 Having a full time job as a bow-maker in the Chieftain’s house, I figured a man of means was entitled to a sword. However, the rounded ‘safe edge’ of my own, would have left a warrior in the past at a distinct disadvantage. The edges of our swords are rounded so that we may actually fight and practise with them. 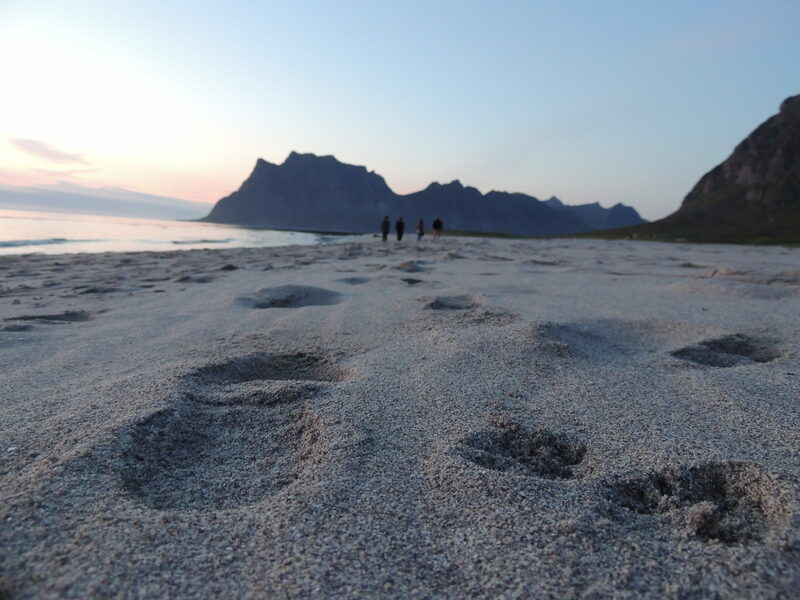 Last year as a branch of UCD’s Combat Archaeology module, I set up a fighting group in the Lofoten. 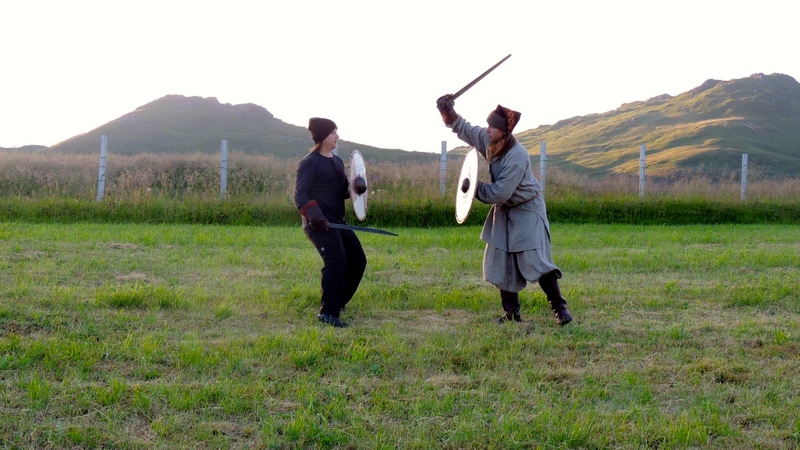 Here the staff were able to learn a little bit more through direct experience, the dynamics of close combat, by actually using a sword and shield. 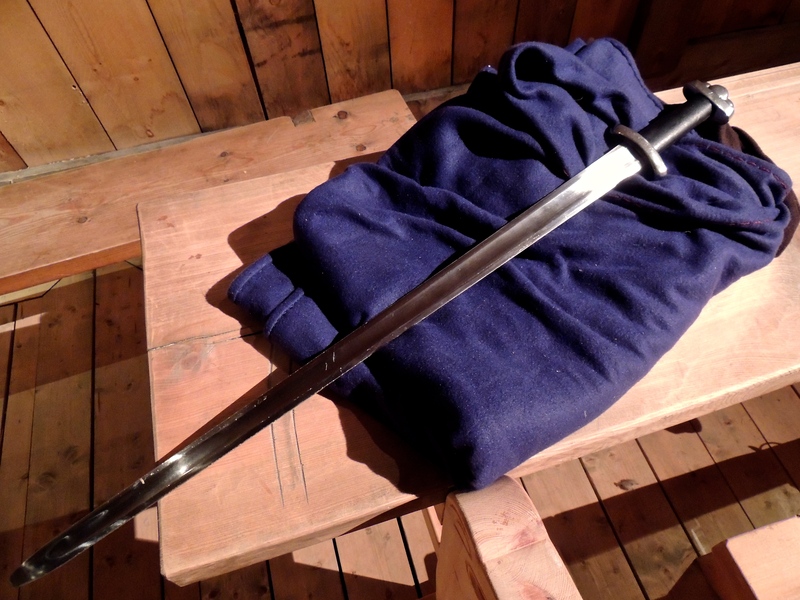 My sword, has the pommel of a typical ‘Peterson Type S’. This was what really influenced my purchase. Type S swords have these three very distinctive and rounded knuckles on the pommel. 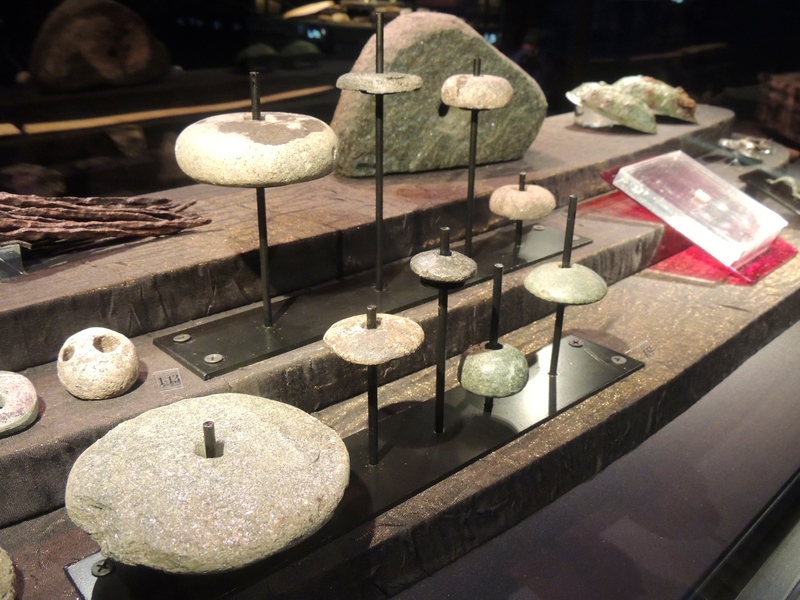 These were mostly common to Southern Norway and thus, also quite popular in Ireland; one of which can be found in the National Museum of Ireland. 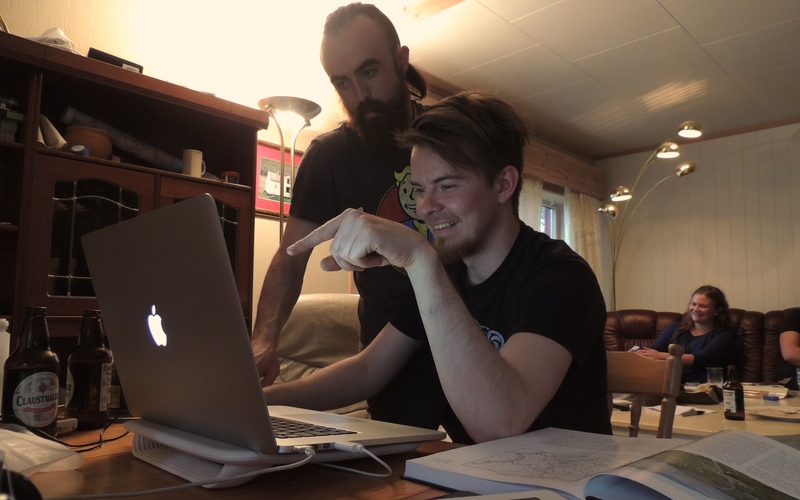 Lofotr Combat Archaeology Session, July 2014. 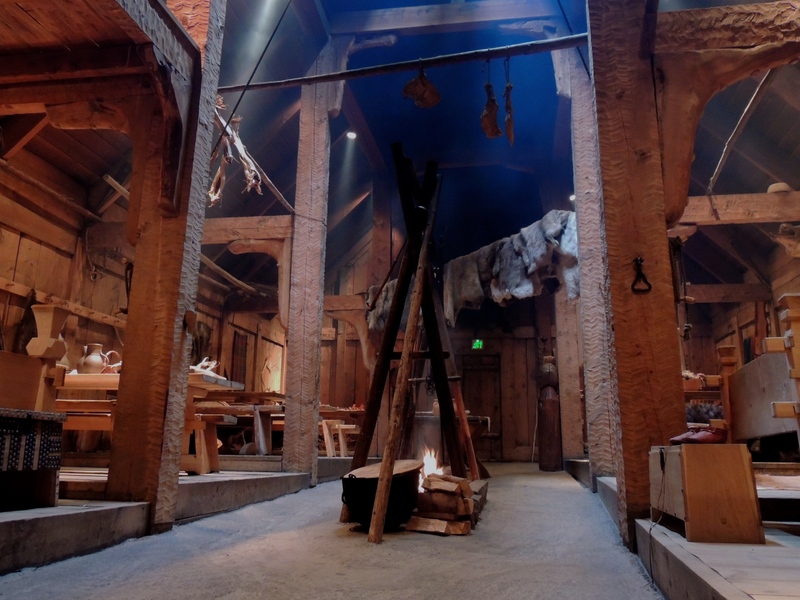 The atmosphere in the longhouse now, is mostly designed to create a visual and dynamic experience. The clothes, activities and objects used in the house, help awaken each of the senses and bring to life the objects that now rest too quietly in the exhibition below. 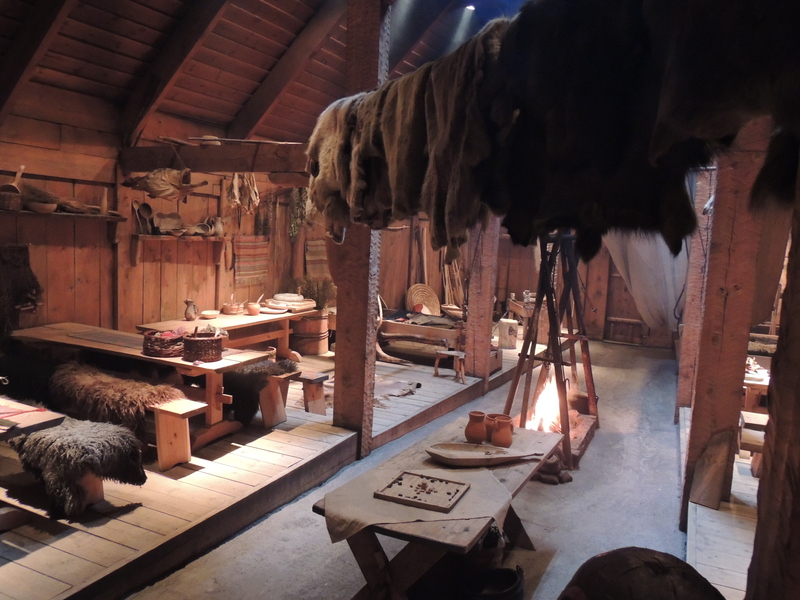 However, the guides and crafters dressed as Vikings are often asked about the original site and objects; which they then try effectively, to put put these things into a living context for the visitors. An Italian Guide Speaks to guests. 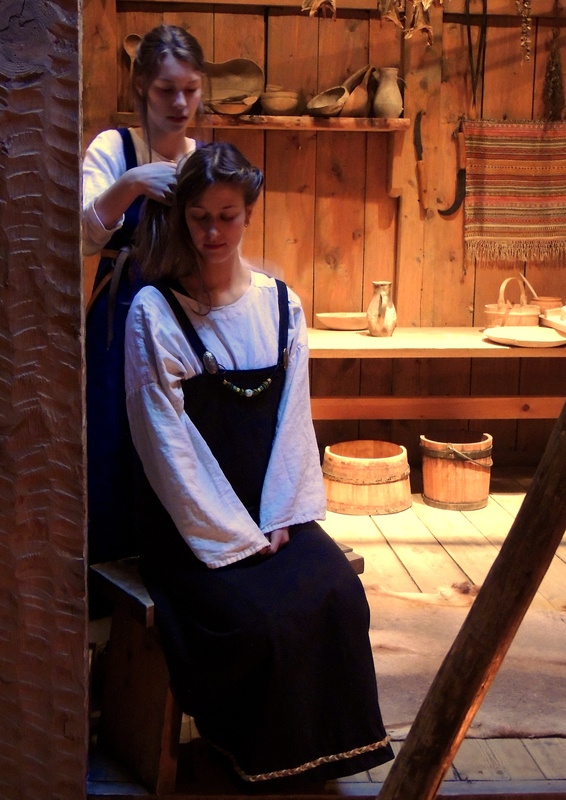 Unlike other museums which purely uses reenactment, we do not strictly use characters or roleplaying. However, recently it has been suggested. A question was raised at the 9th Experimental Archaeology Conference in Dublin this year; whether or not taking the role of a Viking character and pretending to be a person in the past, might actually have the opposite effect, and actually limit the archaeological discussion; with ‘early medieval characters’ unable to discuss modern things such as archaeology, excavation; unable to draw comparisons to later/earlier cultures. It is true in many museums that a character can enhance the atmosphere, however, this being an archaeological site with the original remains right outside the door we perhaps have a responsibility to the site first. However, I am determined to test that for myself. Either way, there is no doubt that getting dressed up and looking the part certainly does provide a living exhibition, where active thinking can truly begin to take over where the mind left off in the museum below. 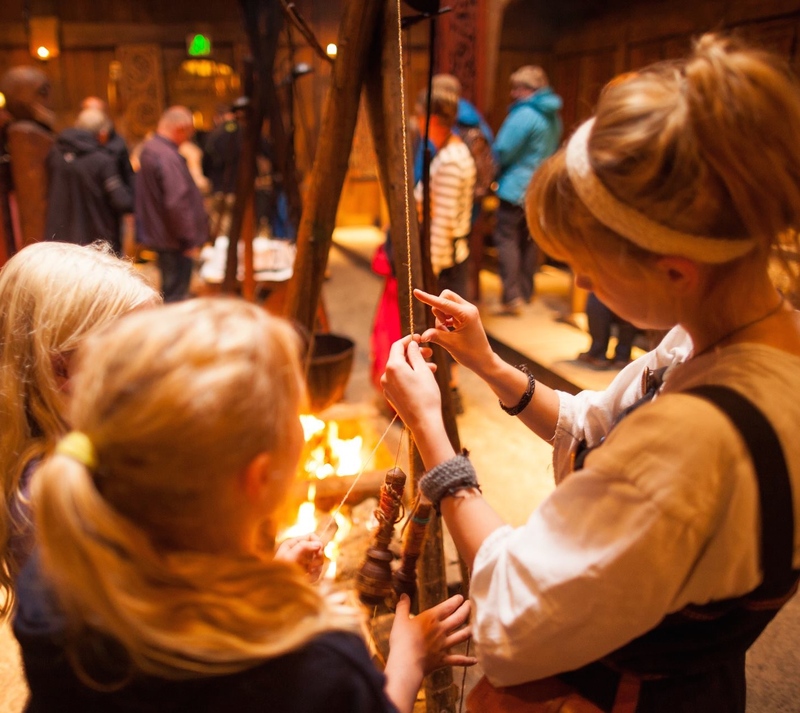 Coming straight from the silence of the finds-room, past the original excavation site and then into a smoky longhouse, each visitor can see both colleagues and friends making noise and working around an open fire. It stretches the imagination and brings to the surface that all too blurry area where artefact ends – and interpretation begins. It is a living exhibition that reminds us again how experimental archaeology can be used as a way to enter any subject that questions the route of all our archaeological interests; ‘people’, and their dynamic interactions with the things around them.